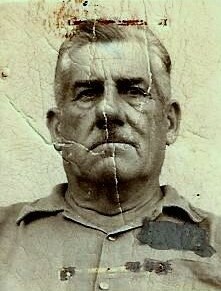 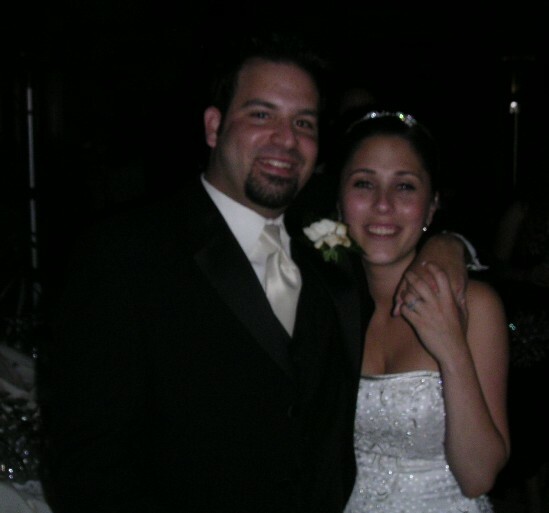 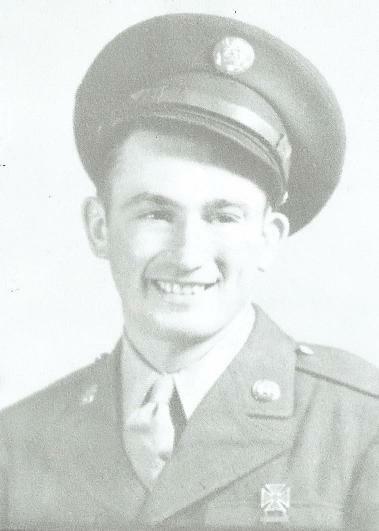 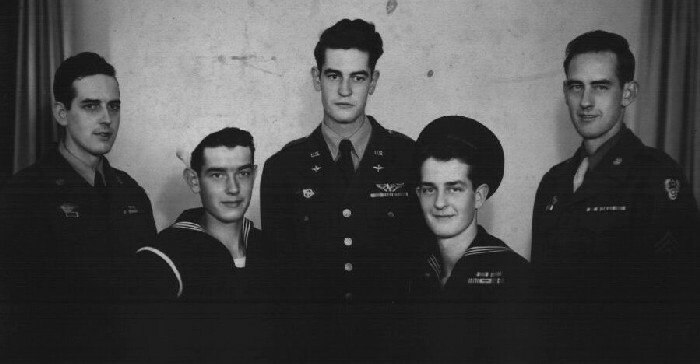 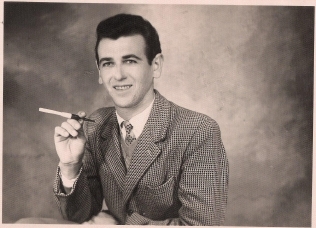 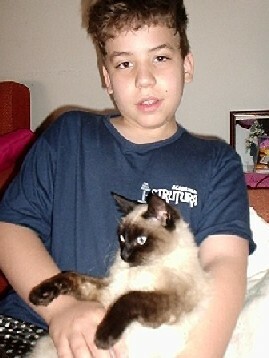 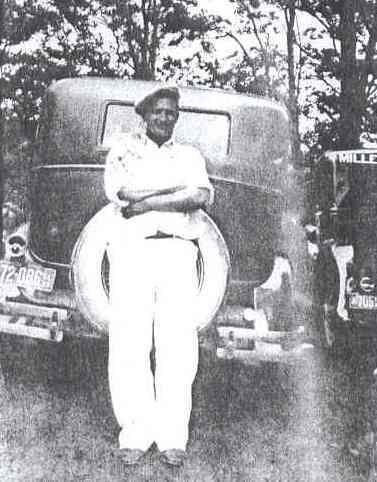 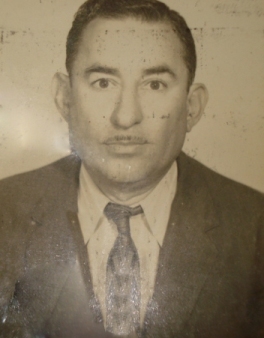 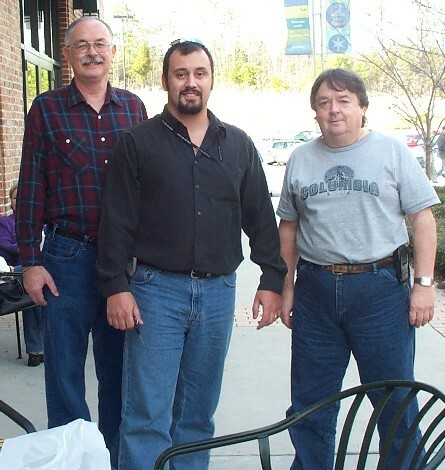 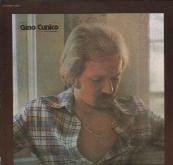 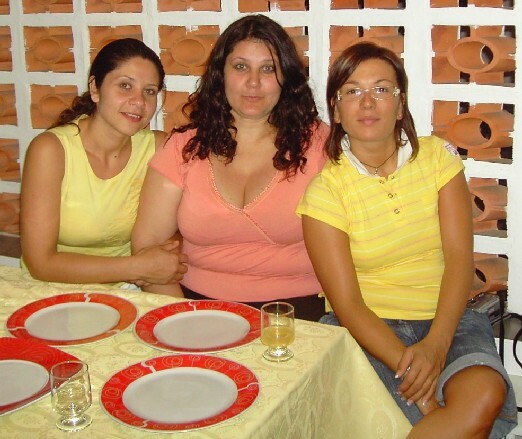 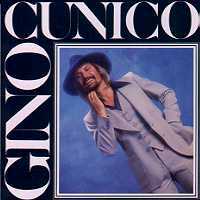 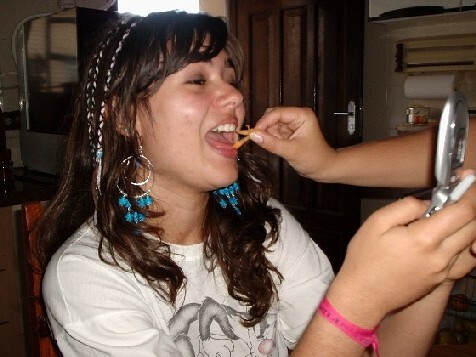 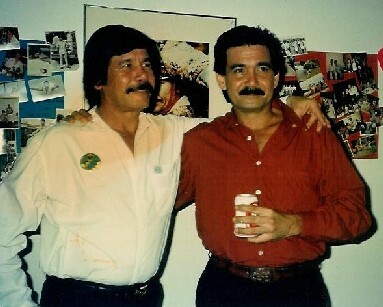 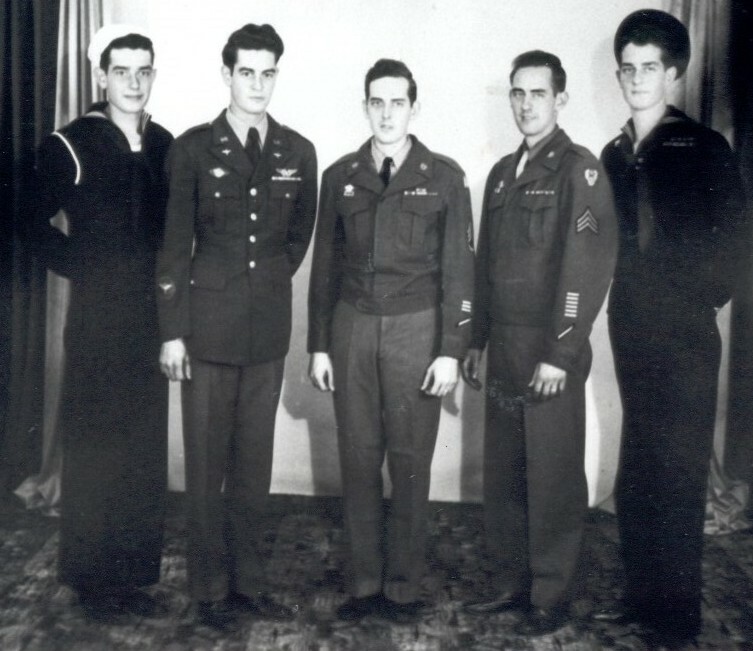 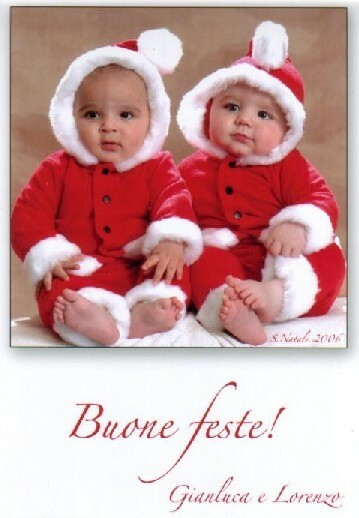 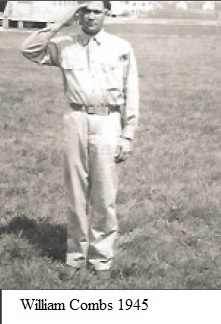 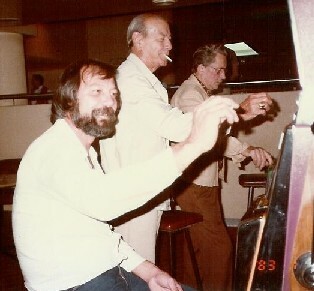 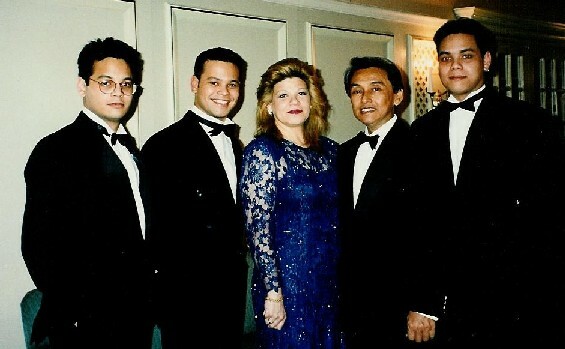 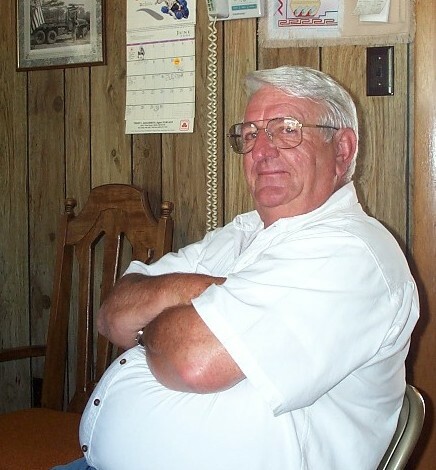 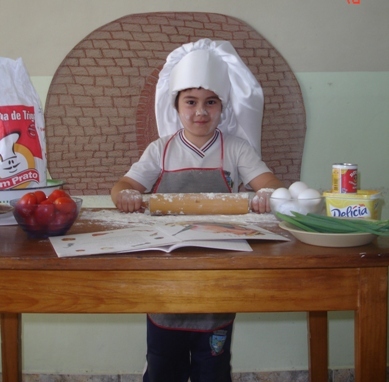 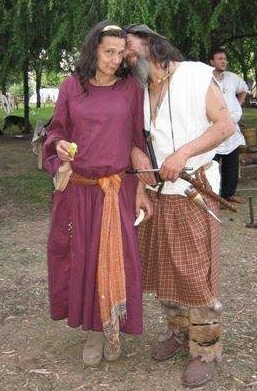 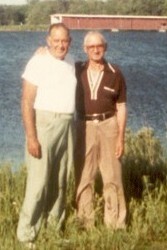 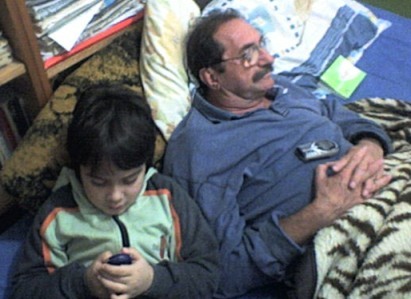 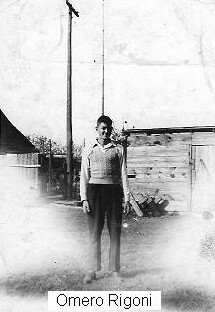 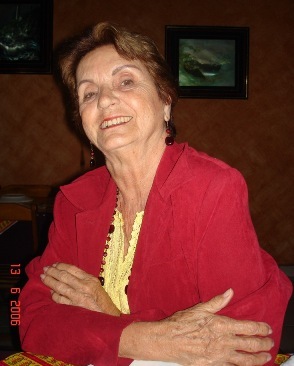 On this page, I have posted photos shared Cunico family members. 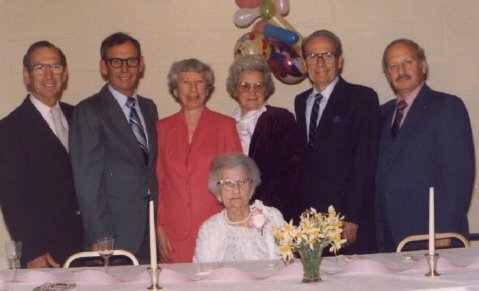 The branch names should be listed alphabetically. 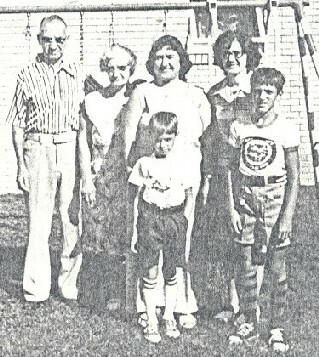 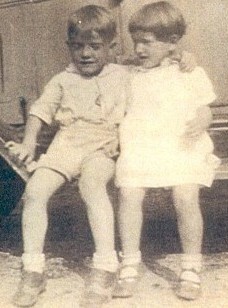 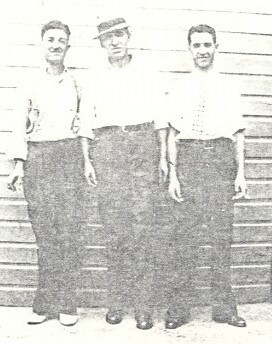 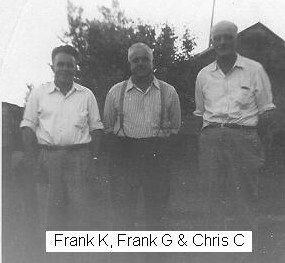 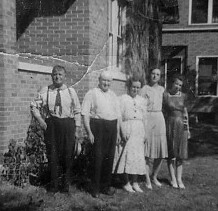 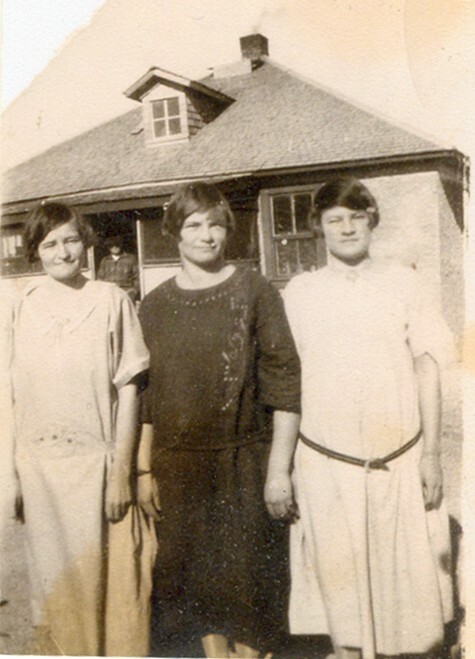 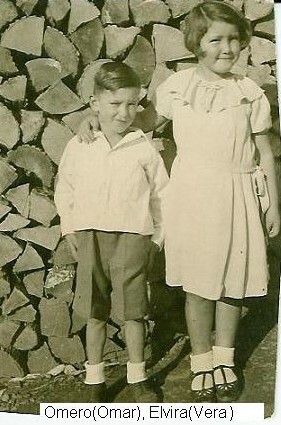 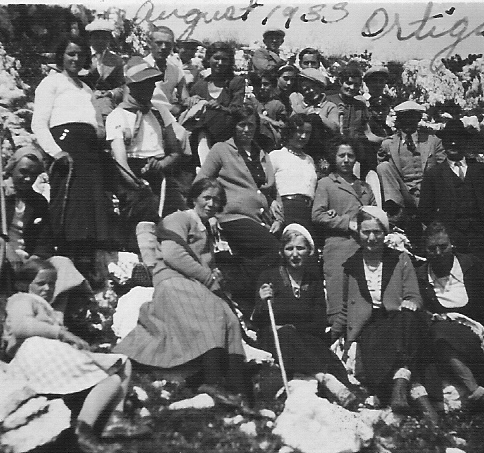 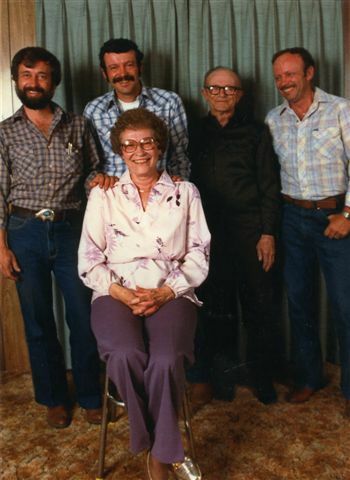 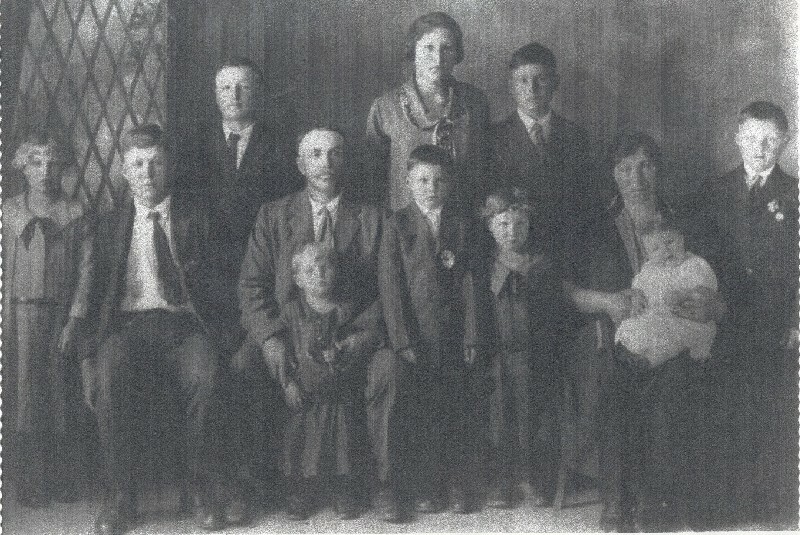 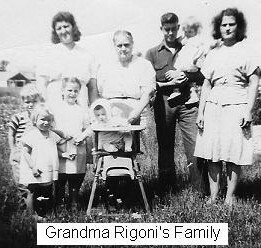 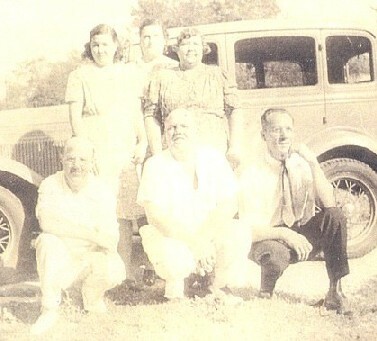 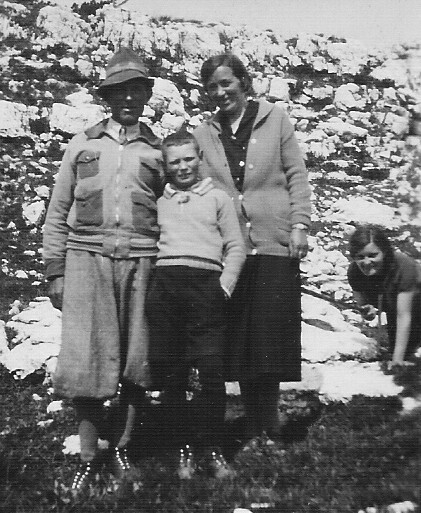 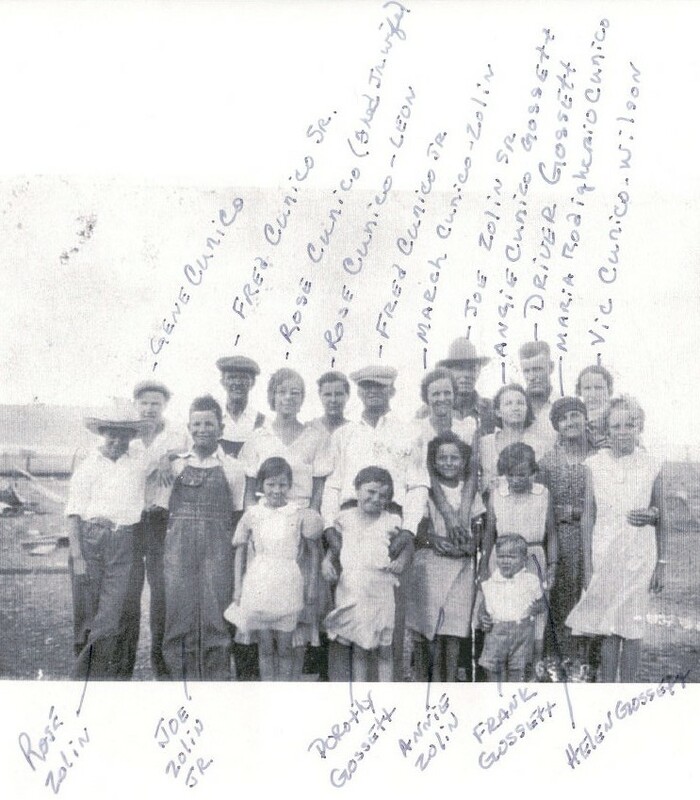 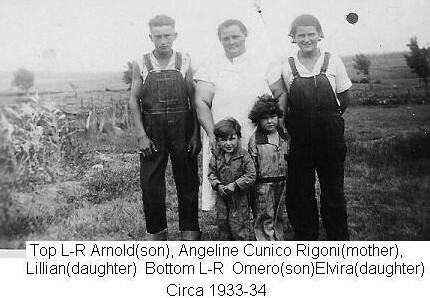 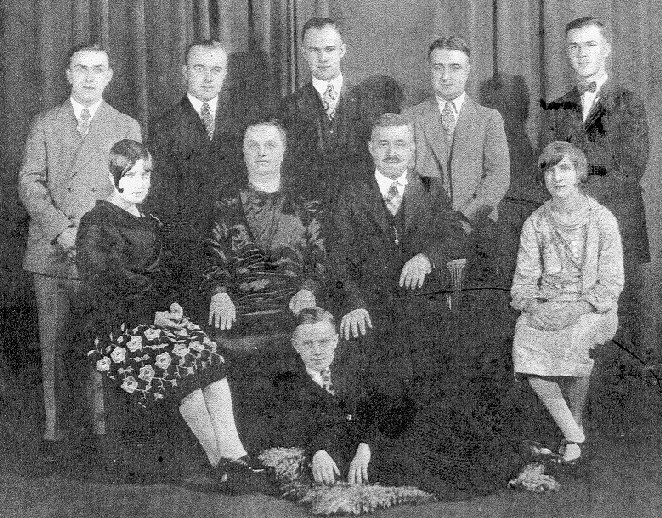 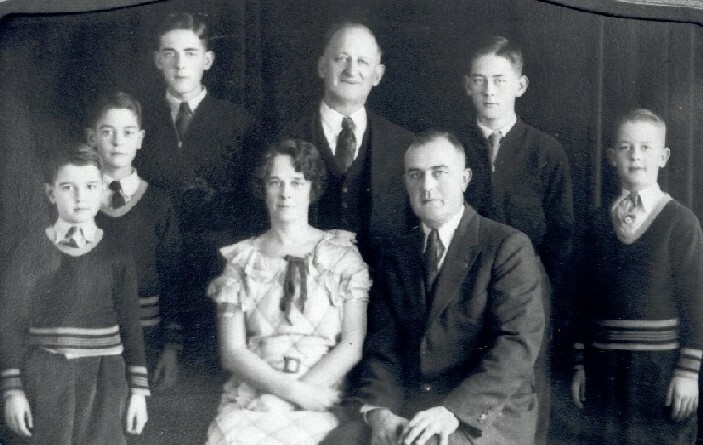 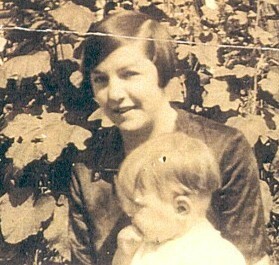 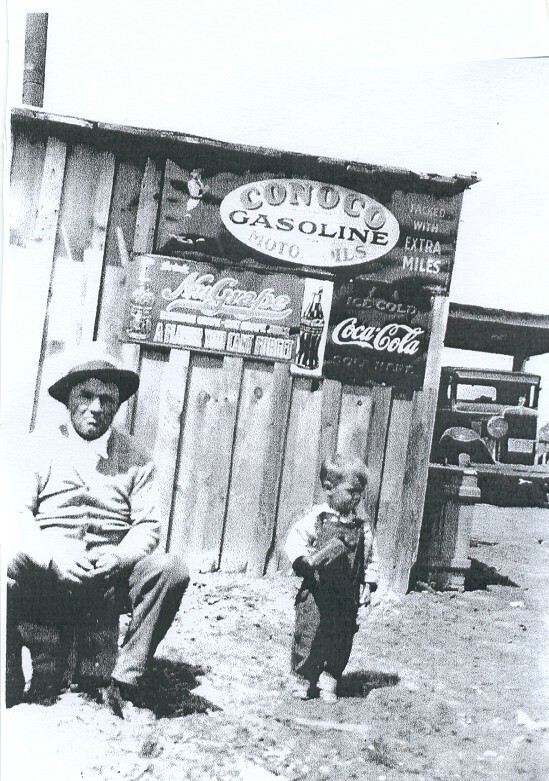 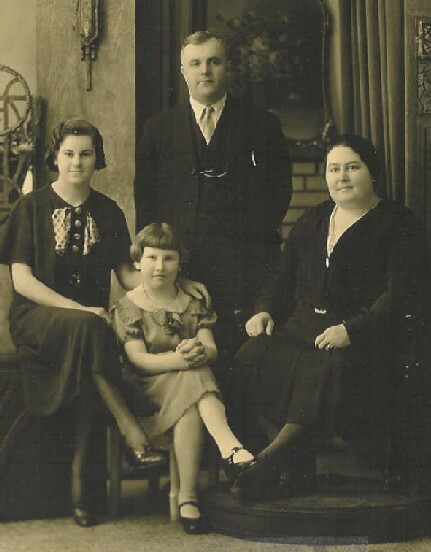 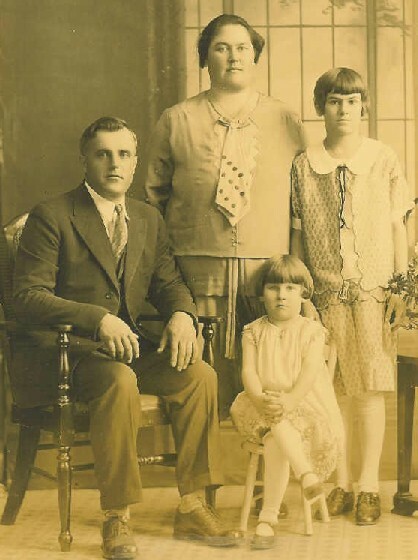 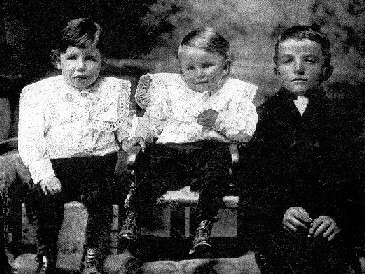 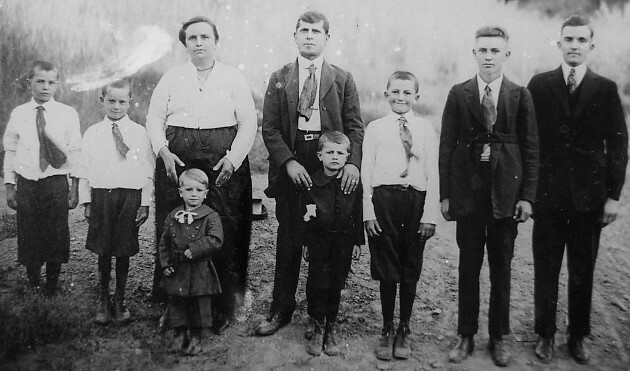 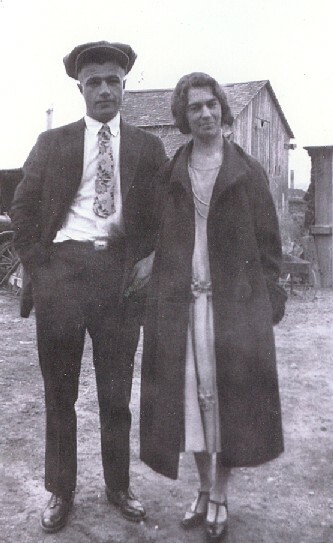 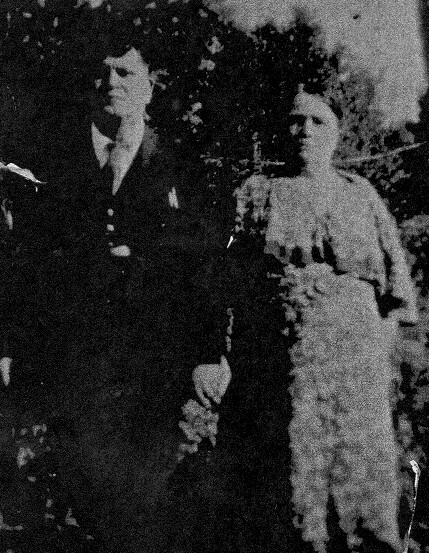 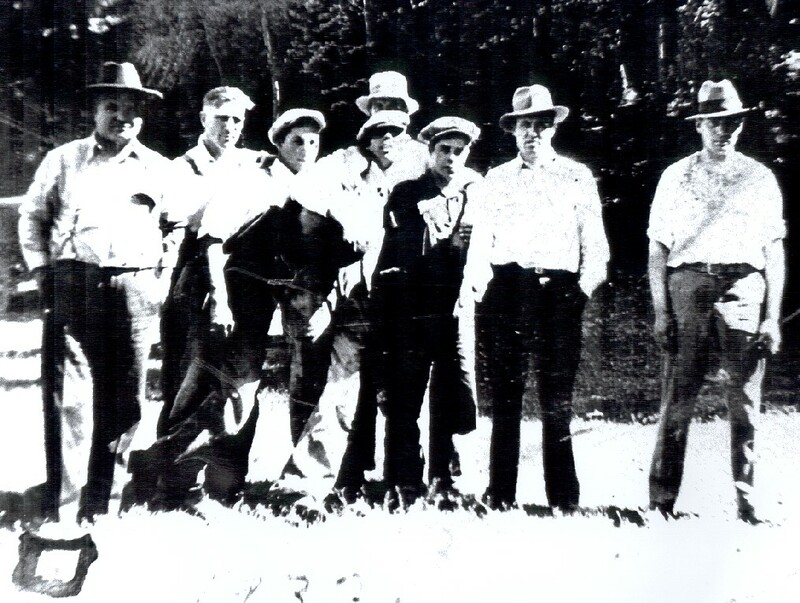 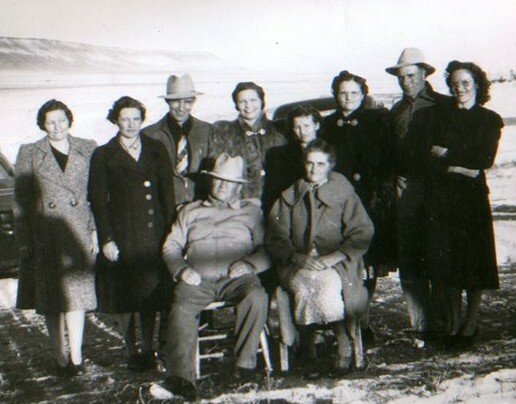 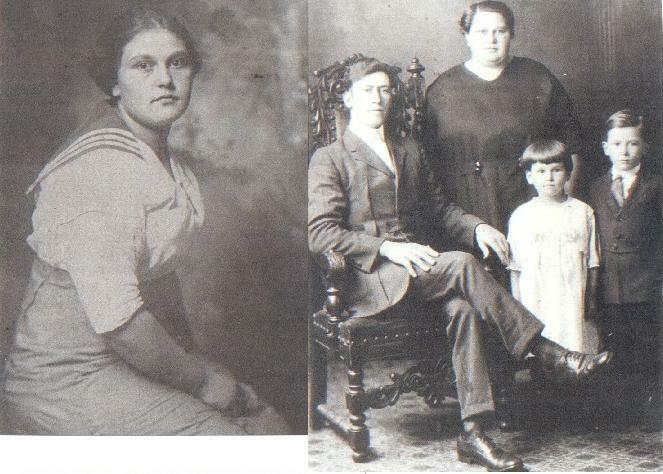 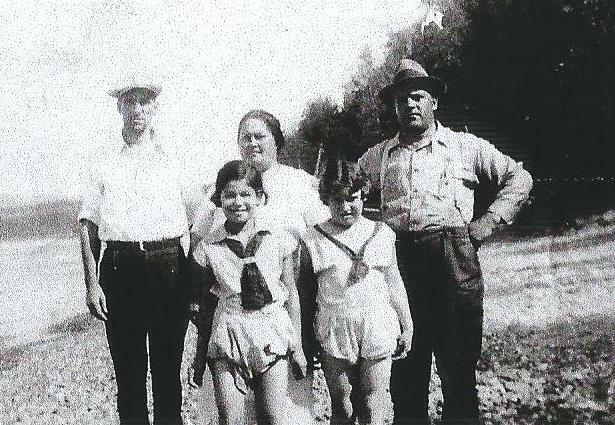 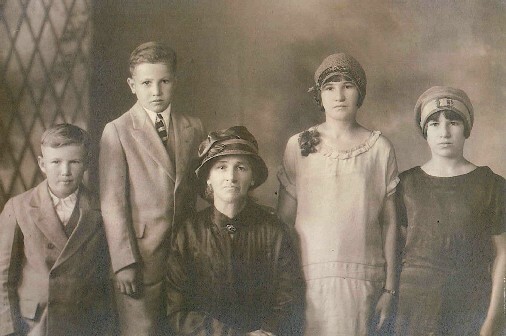 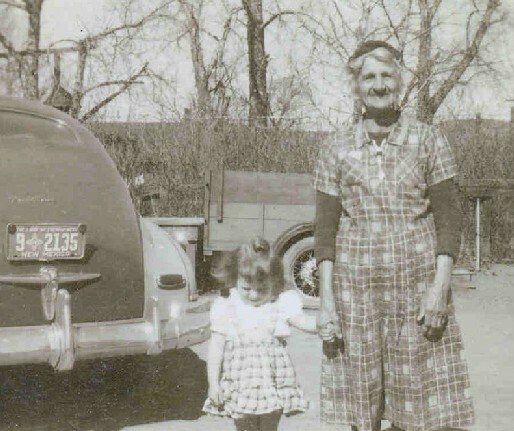 Karylyn's Family - Karylyn's Mom Dorothy Gossett & her Uncle Frank Gossett are in this pic (circa 1930) with a Cunico bunch. 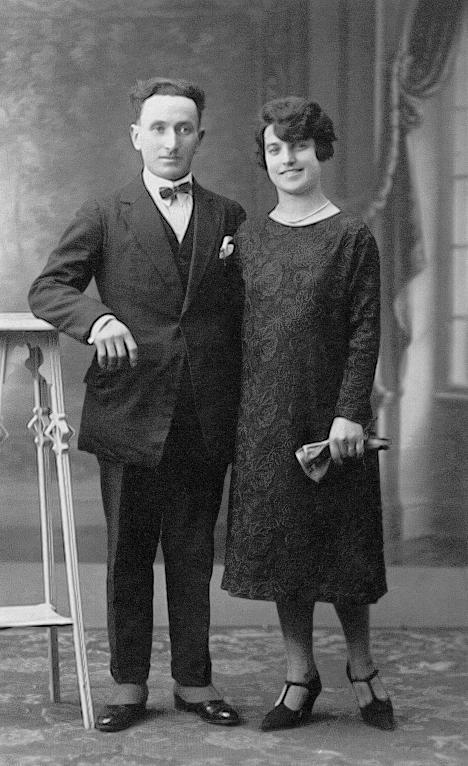 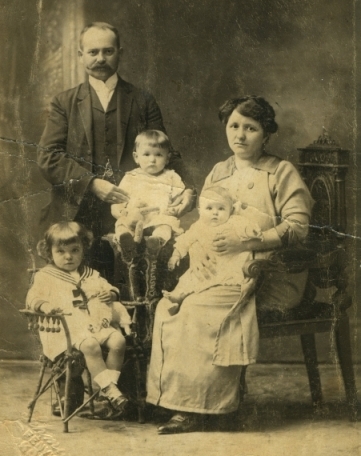 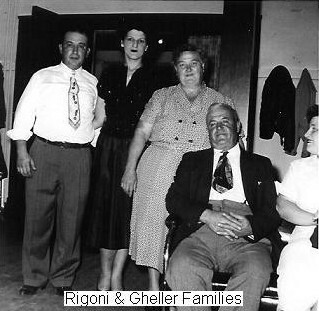 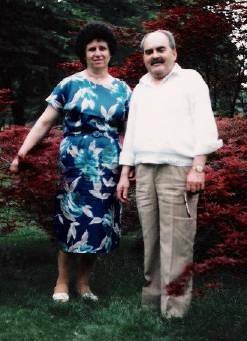 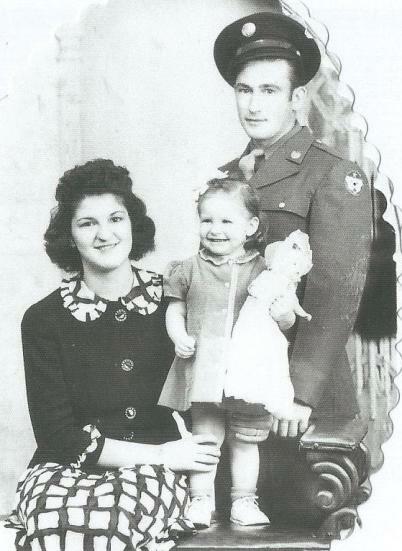 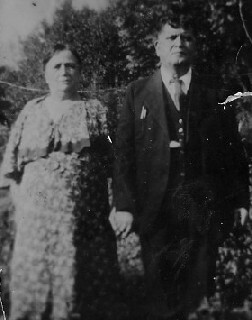 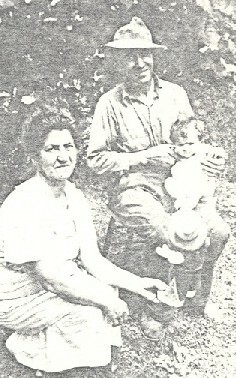 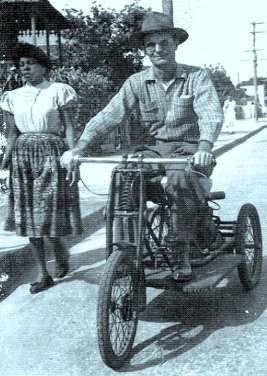 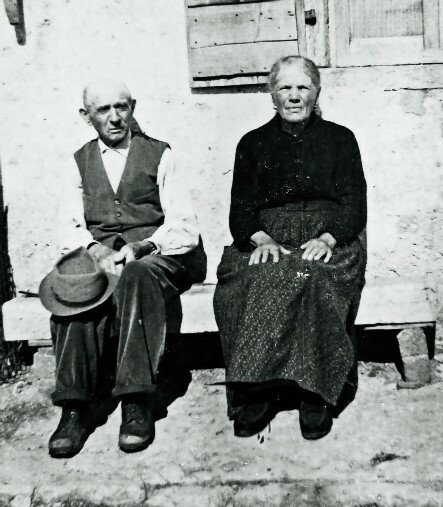 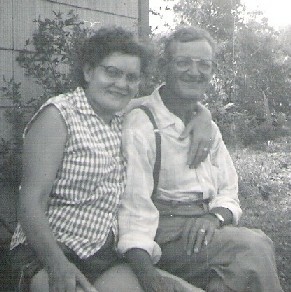 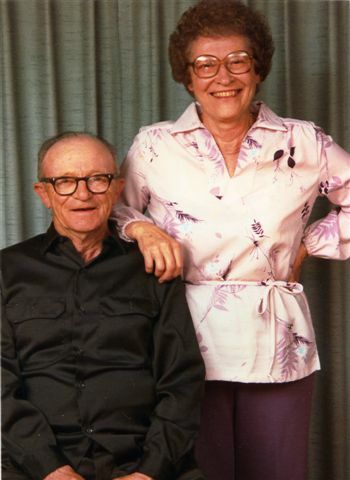 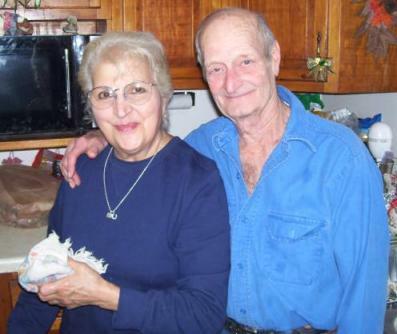 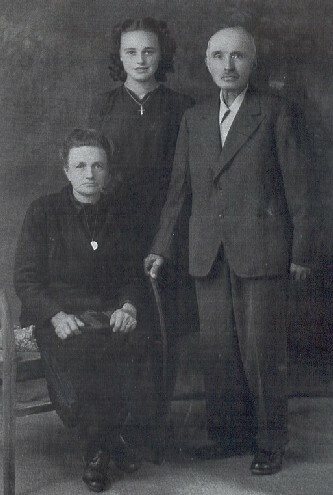 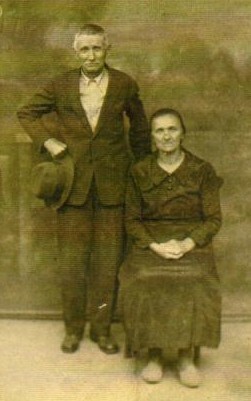 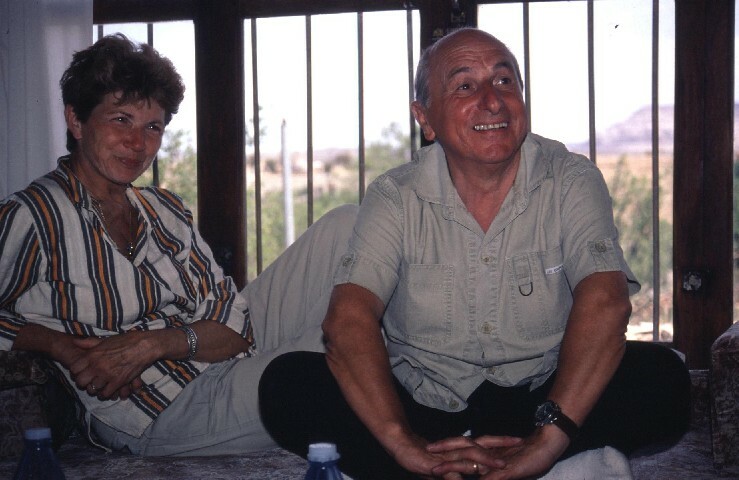 Joe Cunico #2 - Seated - are Guiseppe (Joe) Cunico and wife Marcolina ( Rigoni) Cunico. 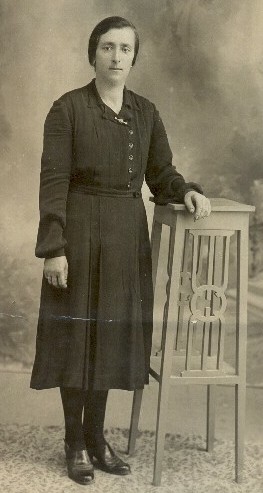 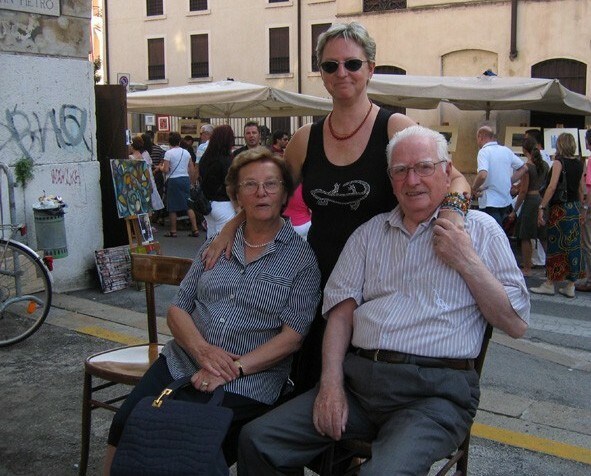 Standing : Mary Rigoni, Antonia(Toni)Chapman. 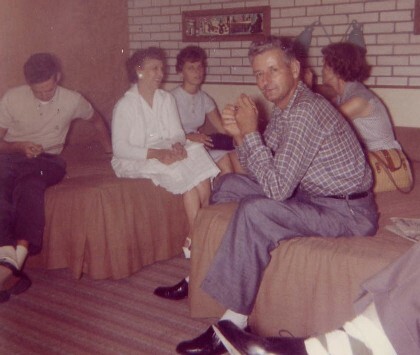 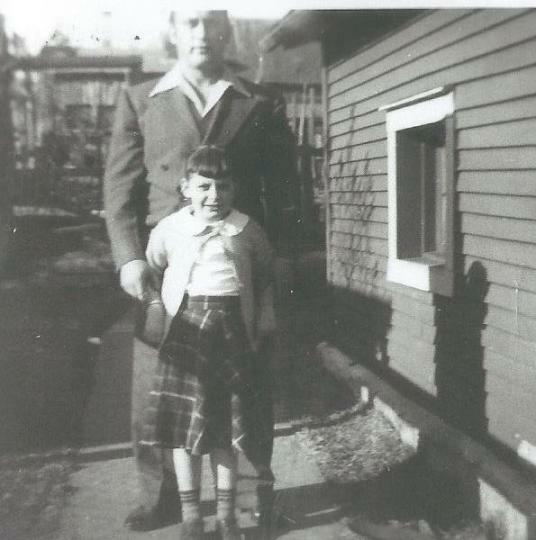 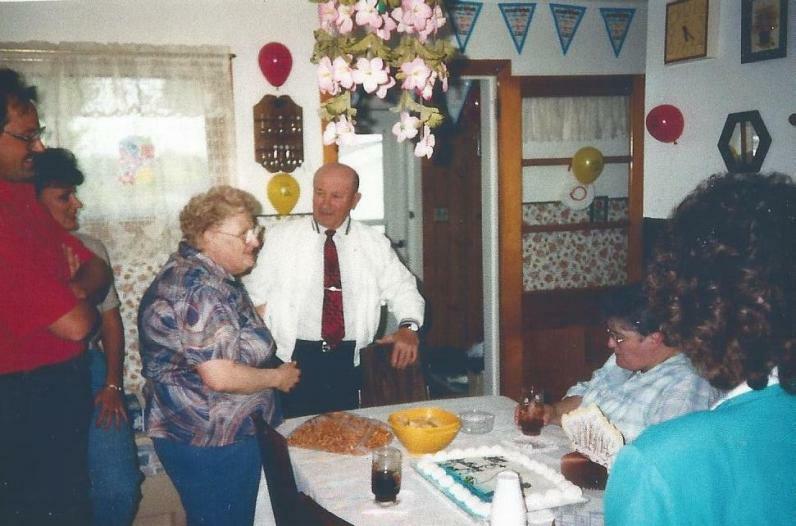 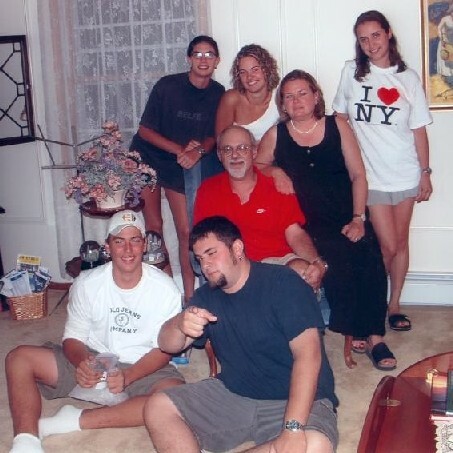 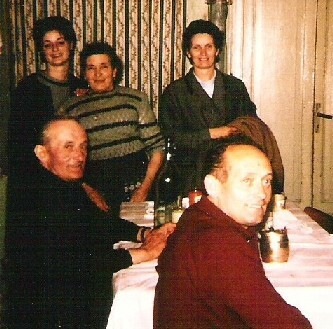 Mike Cunico,Catterina (Rena) Mahoney ,Eva Hargrove, Edith Rigoni, Joe Cunico Jr. (my dad) and Jennie Scott. 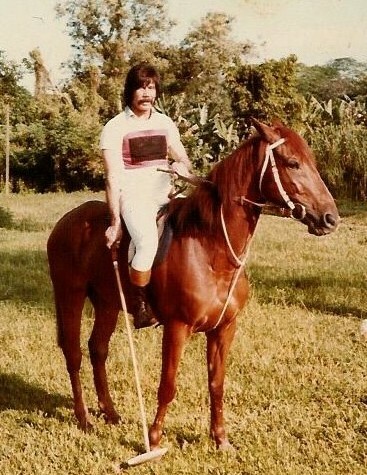 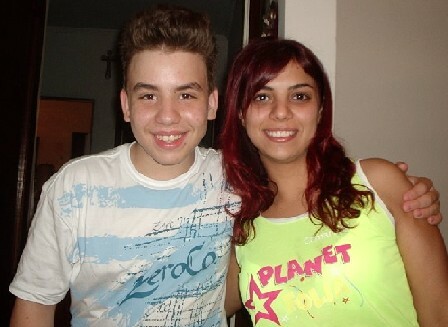 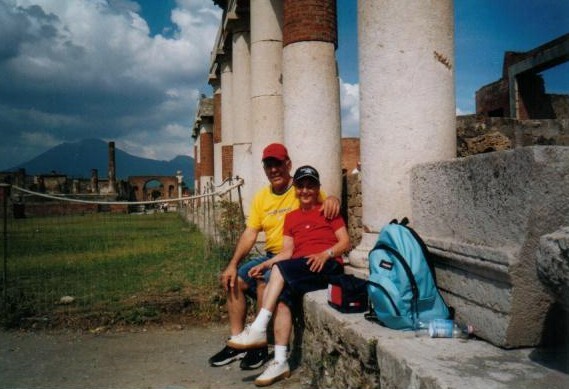 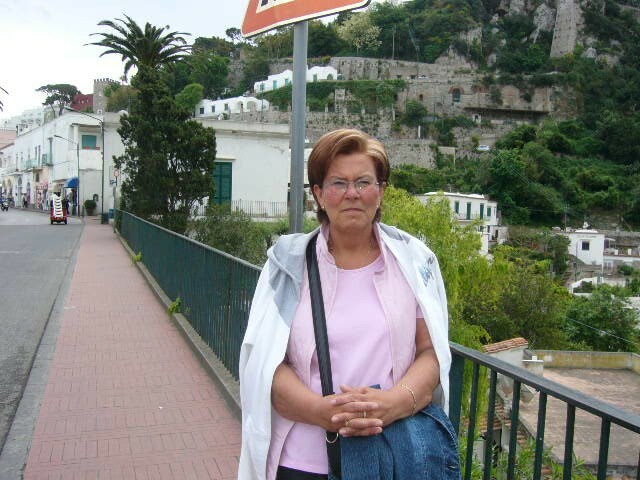 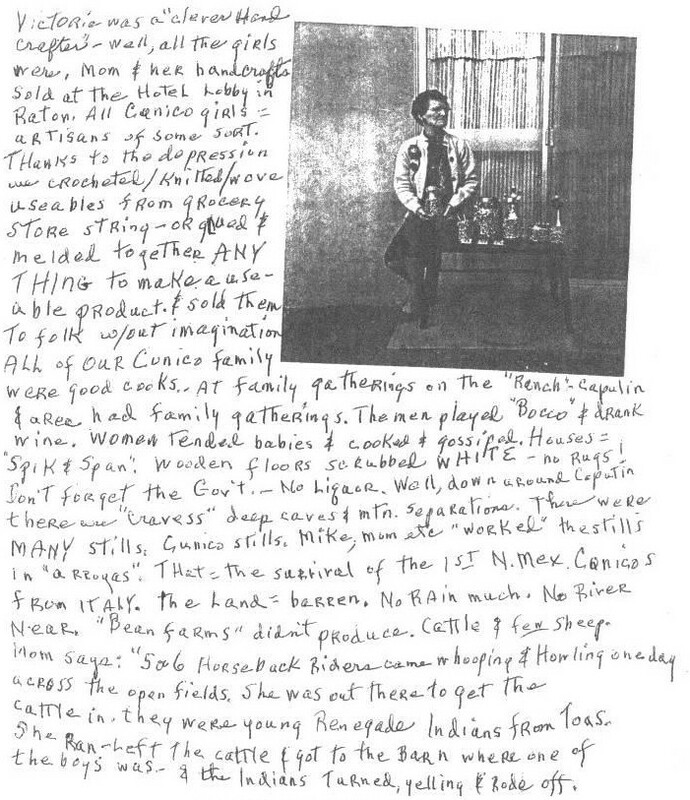 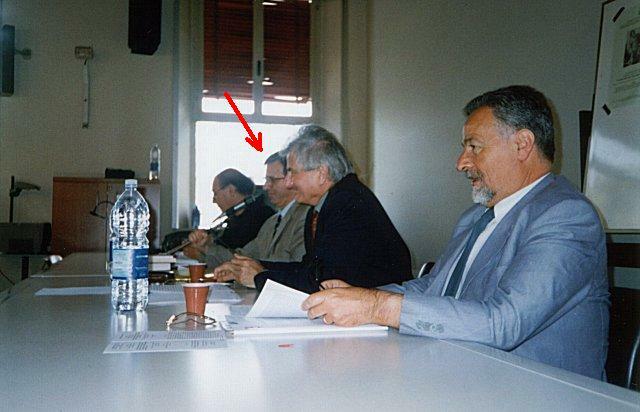 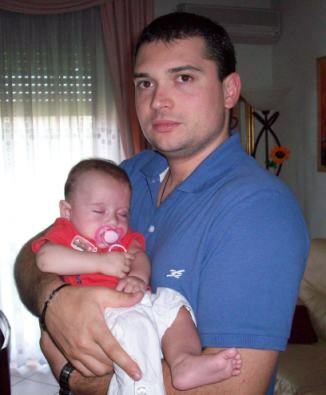 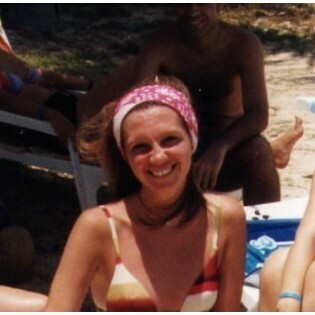 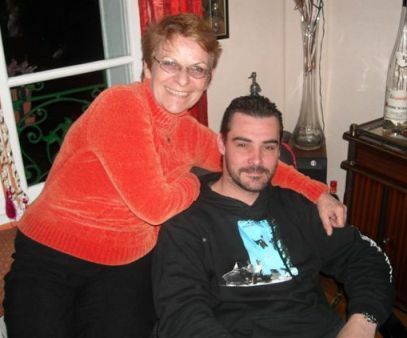 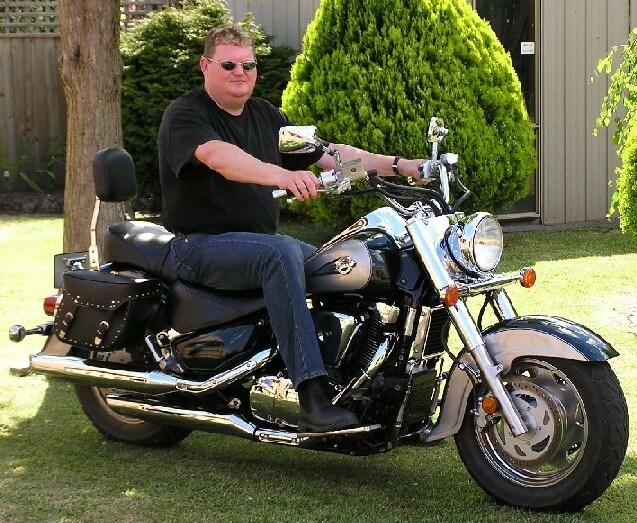 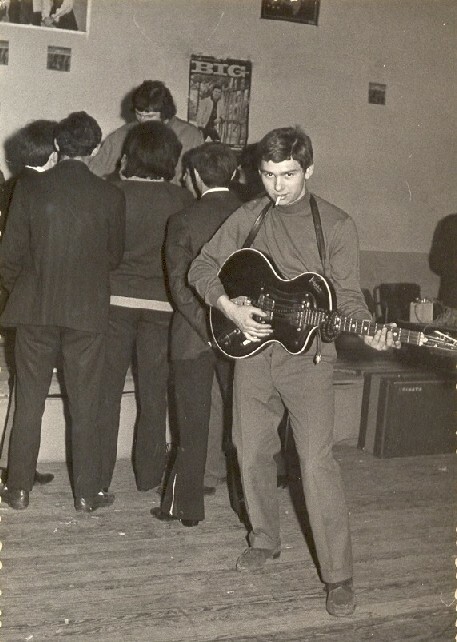 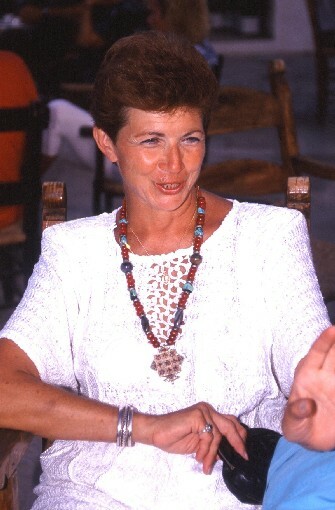 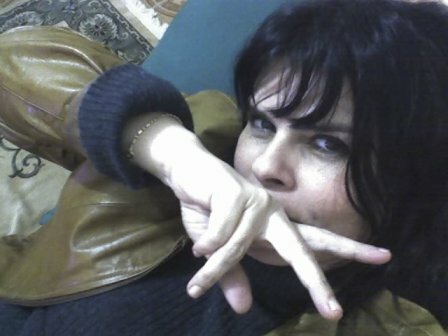 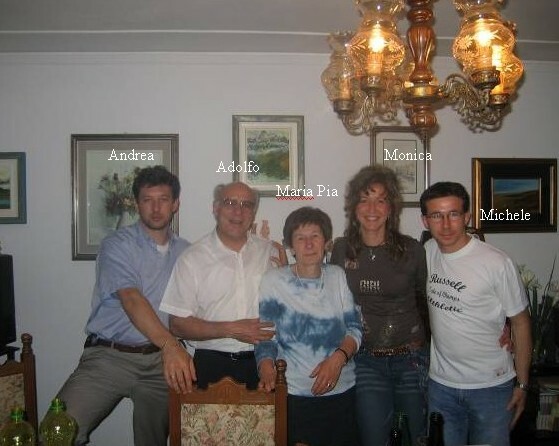 Marcolina1 - Pic shared by Betty. 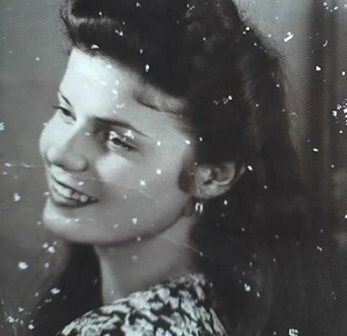 Marcolina2 - Betty's notation - She was so unique in so many ways, as you can see she smoked a pipe,and hated having her picture taken. 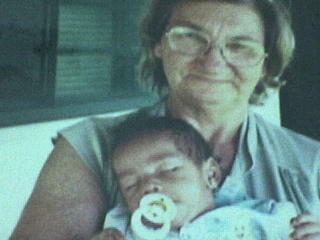 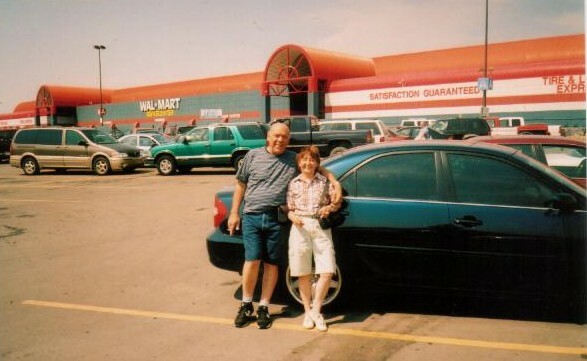 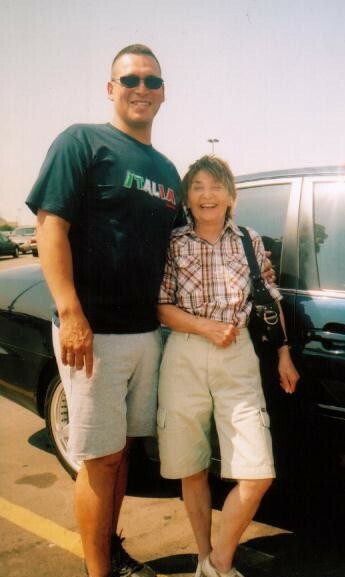 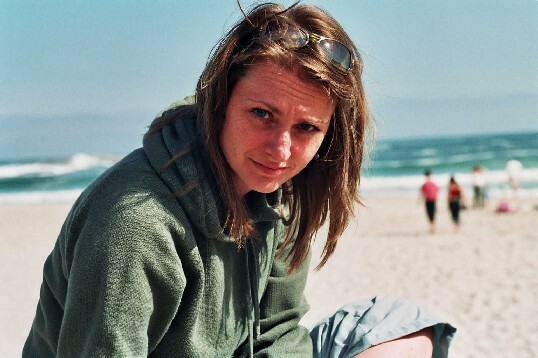 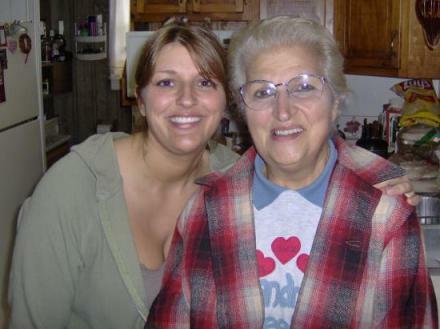 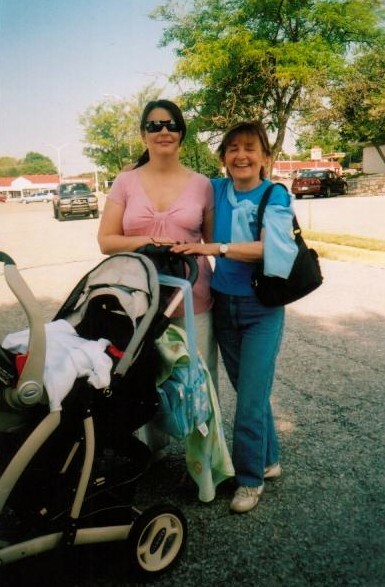 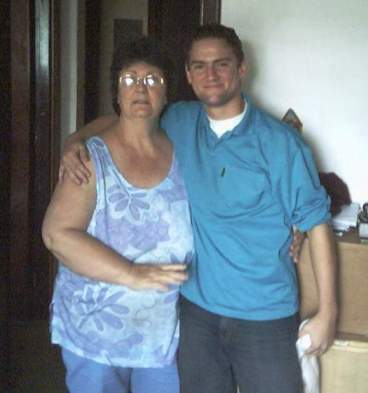 I was 36 when she went home and I still miss her so much. 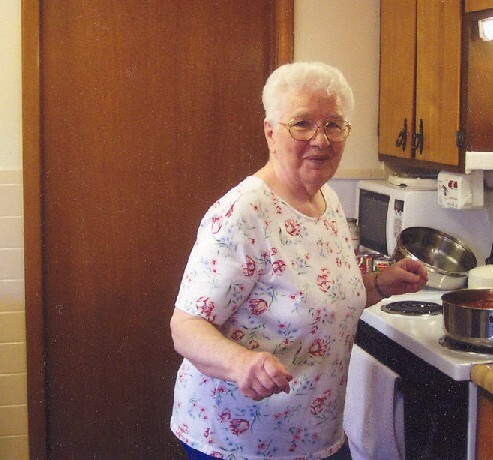 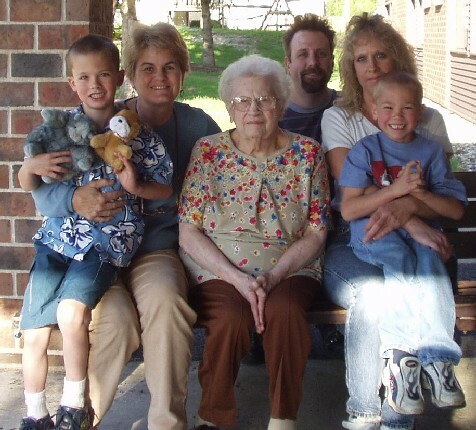 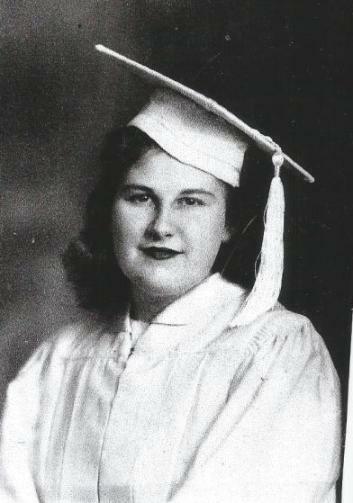 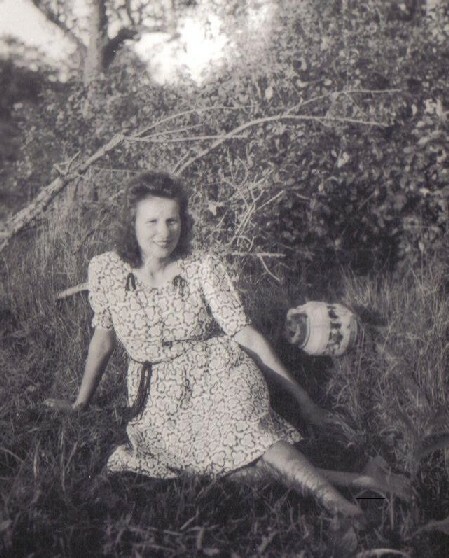 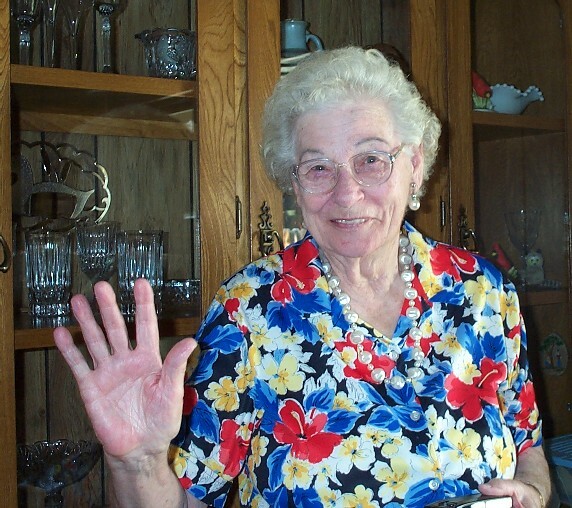 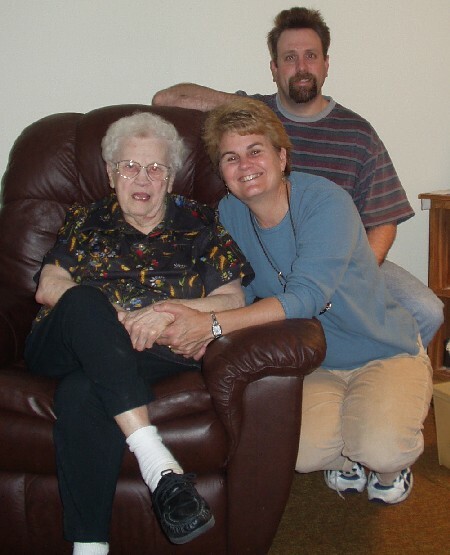 She died the day before her 99th birthday, so we were very fortunate to have had her for so long. 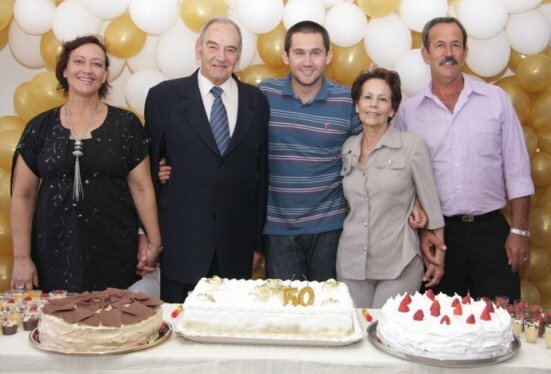 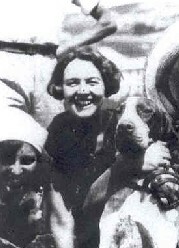 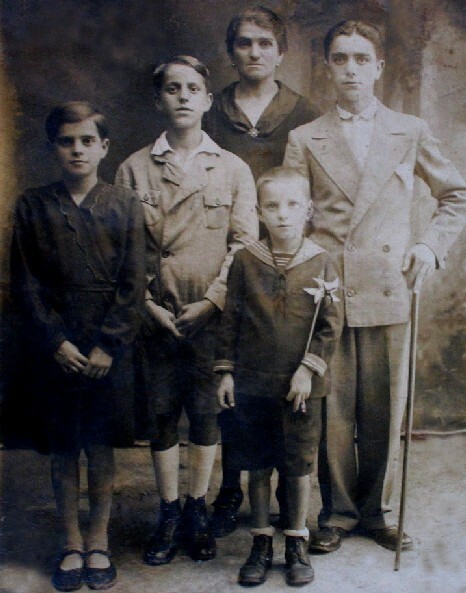 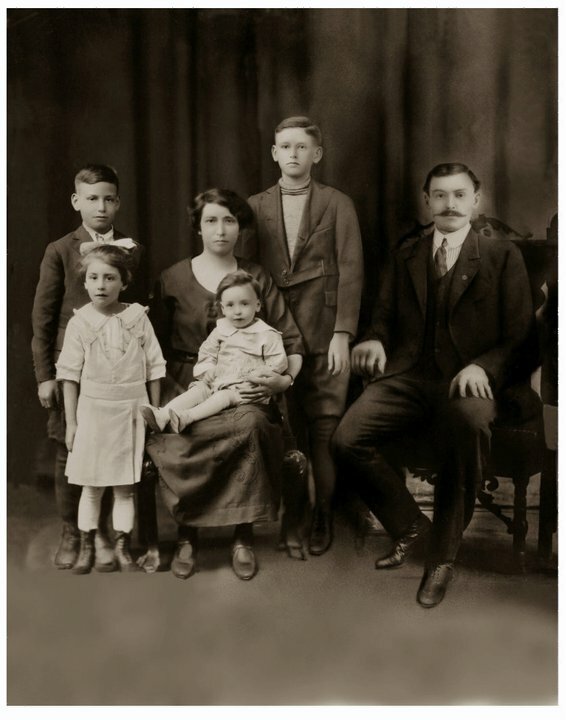 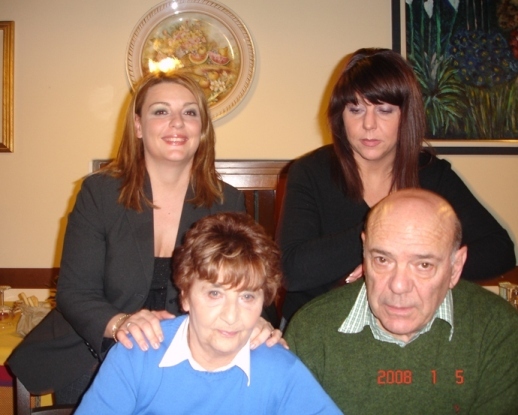 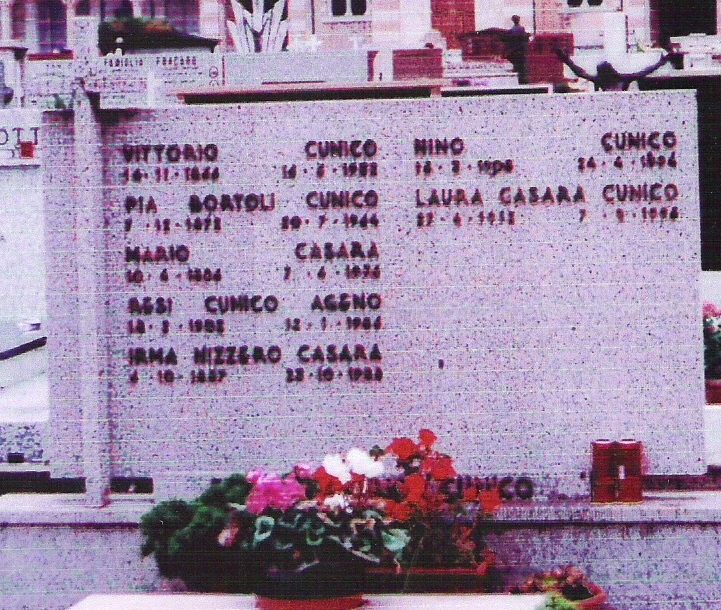 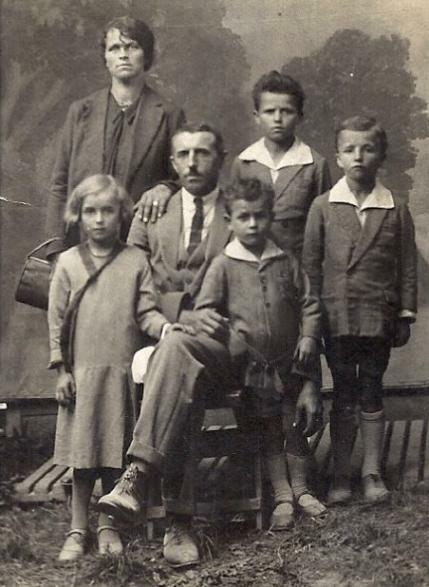 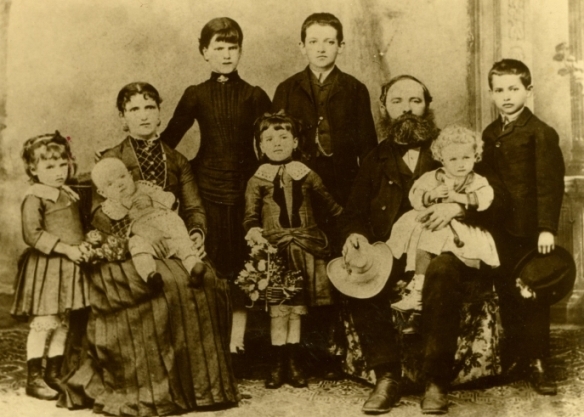 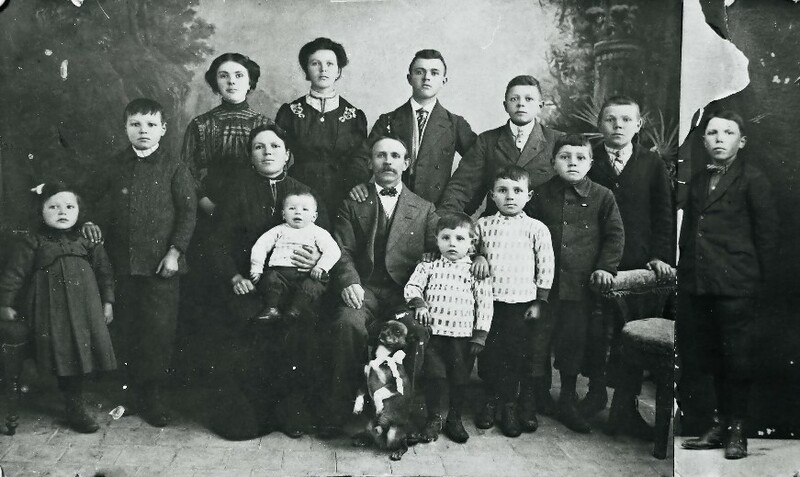 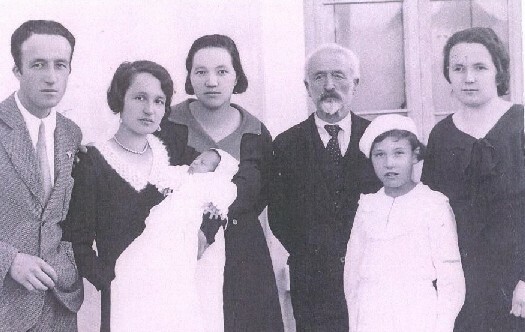 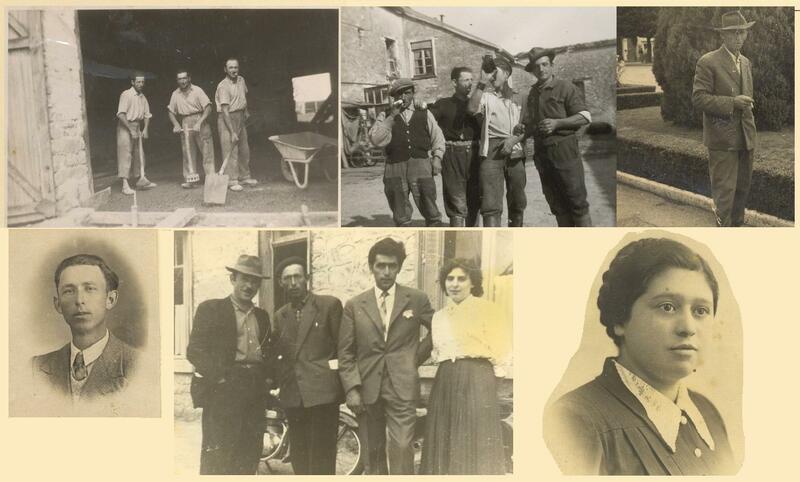 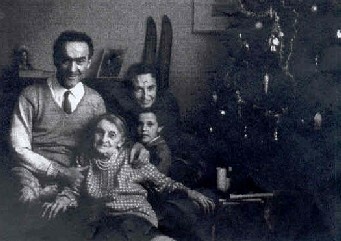 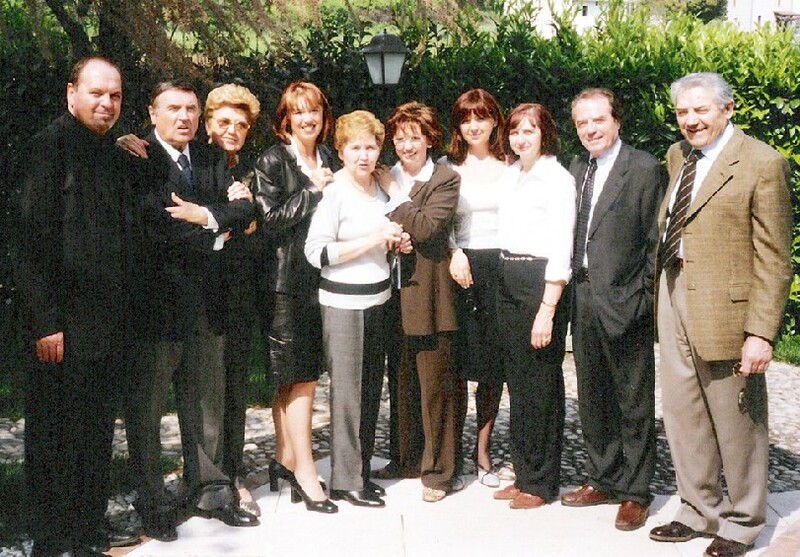 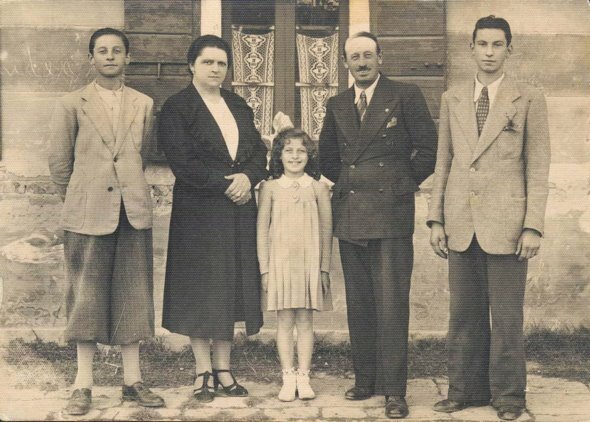 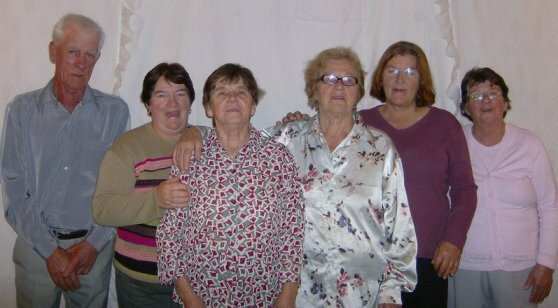 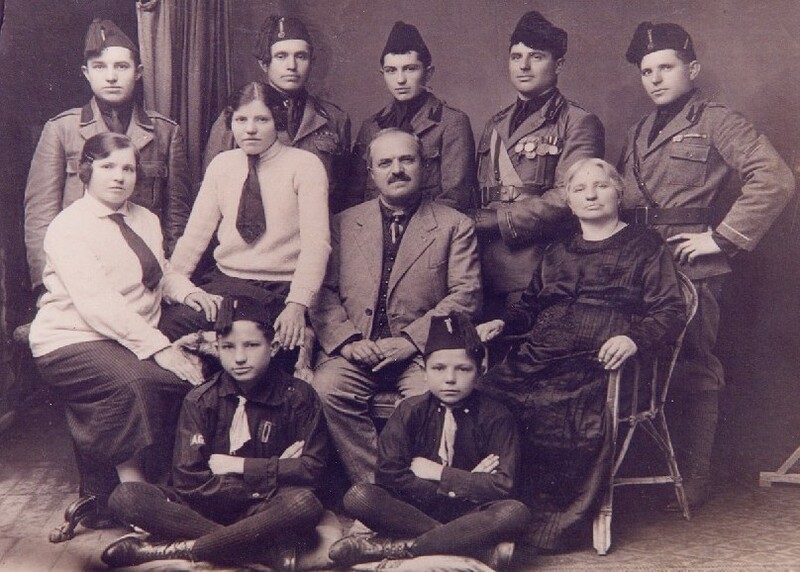 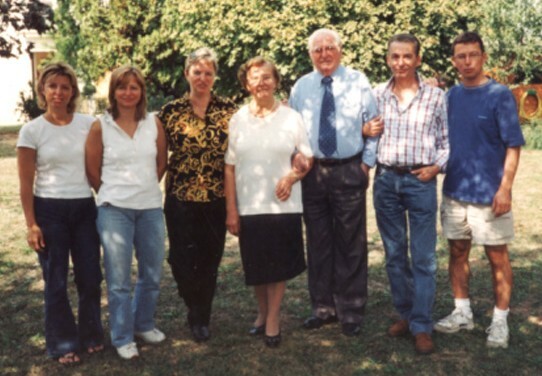 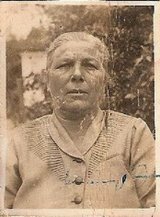 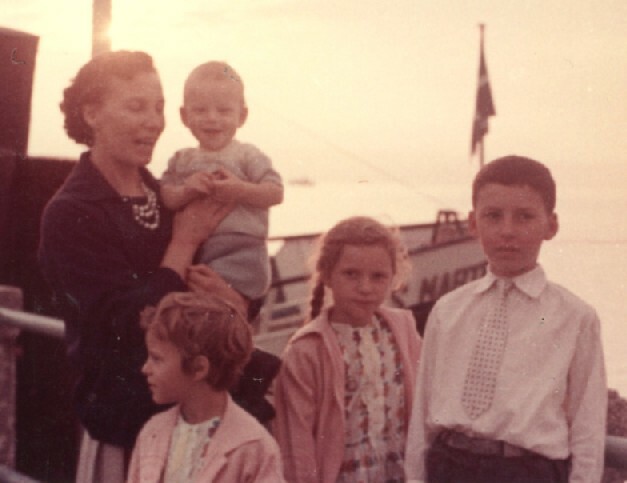 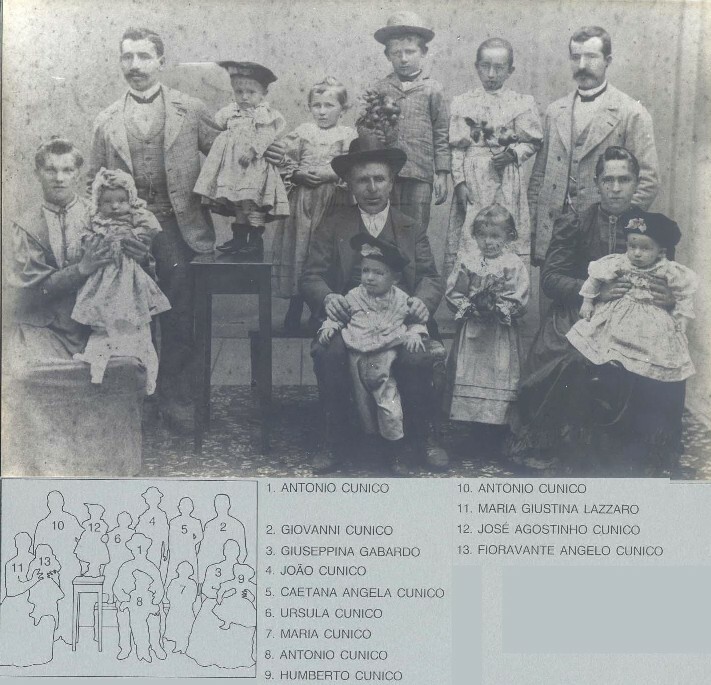 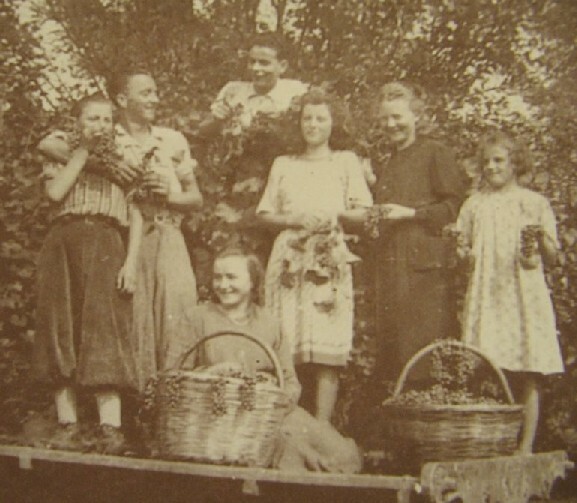 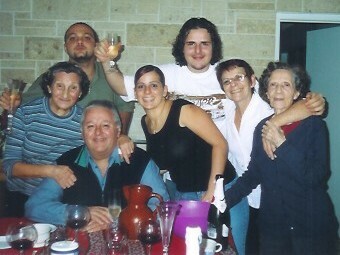 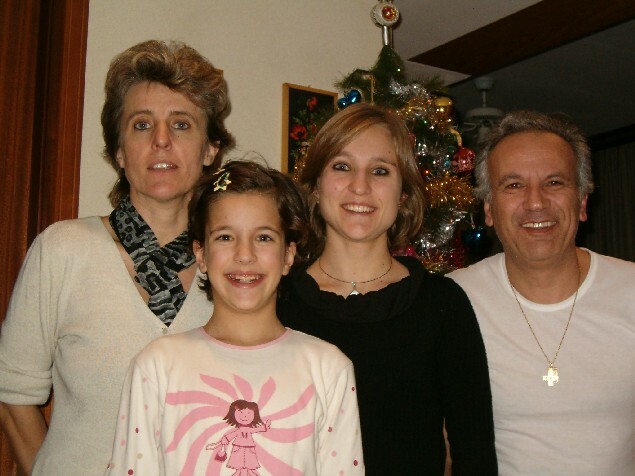 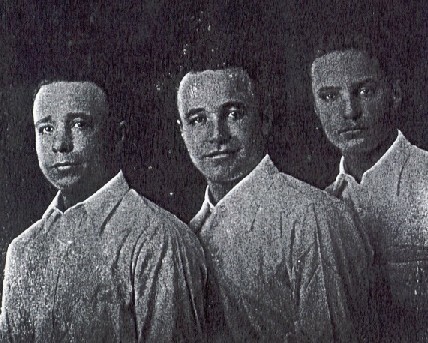 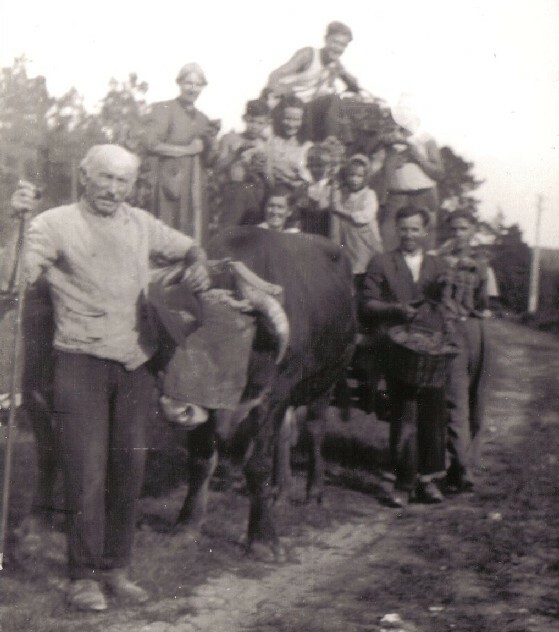 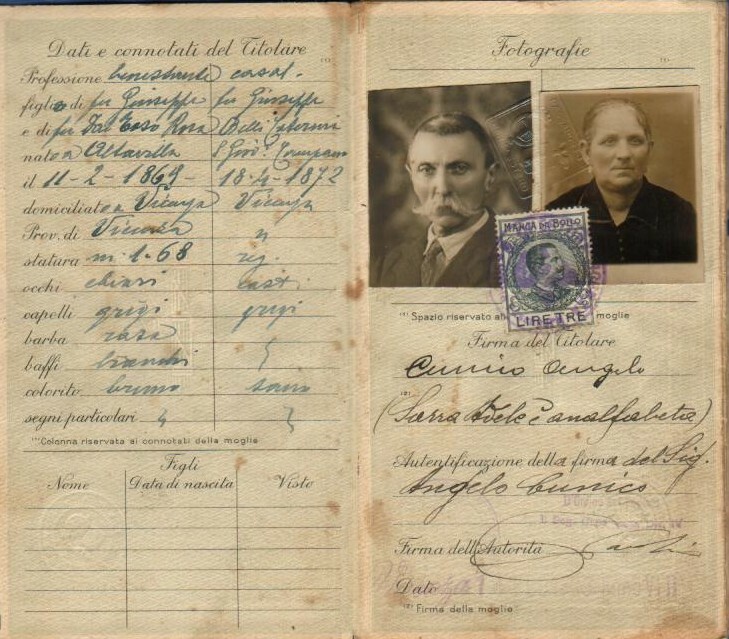 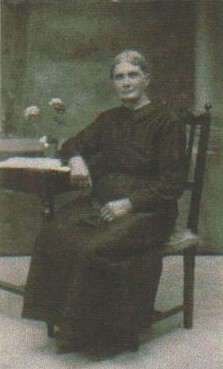 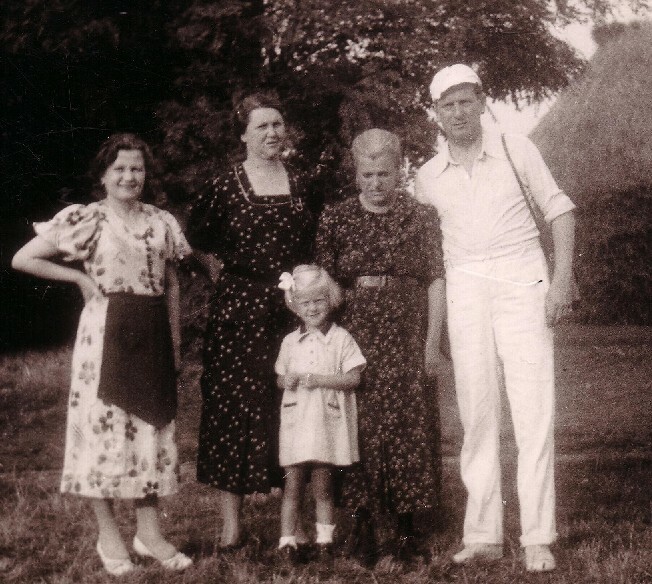 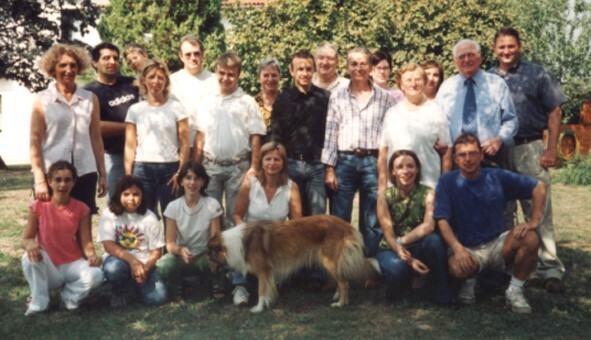 Bruna1 - (l to r) top: Cesare, Battista, Domenico, Florindo, Giuseppe, middle: Maria, Giuditta, Antonio (Bruna's Grandfather), Giovanna Bersabea Manfroi (Bruna's Grandmother), bottom: Angelo, Placidio. 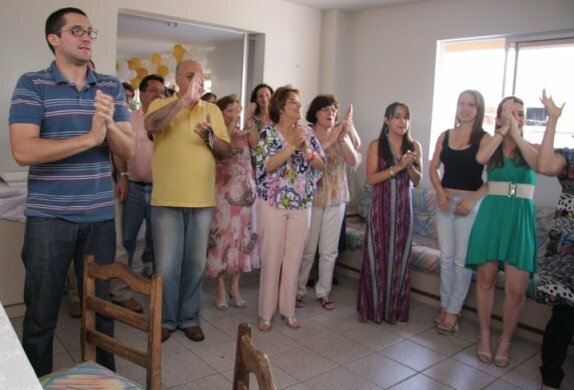 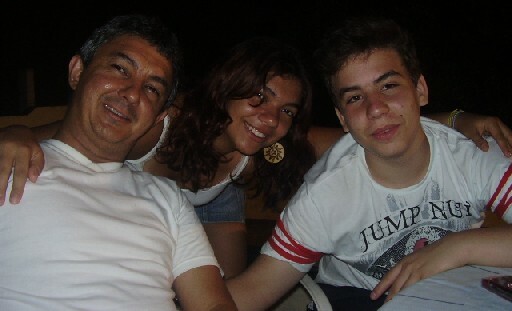 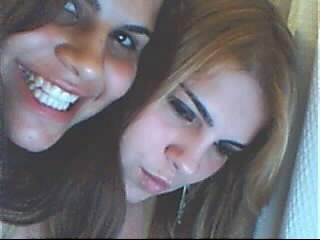 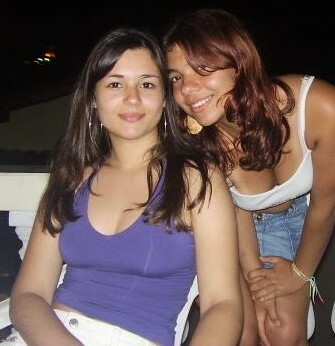 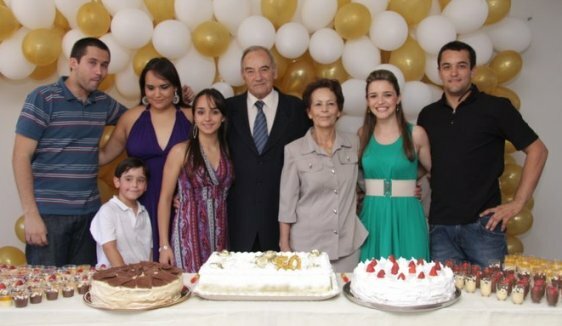 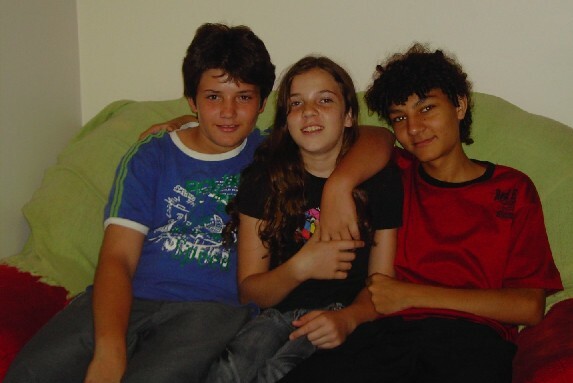 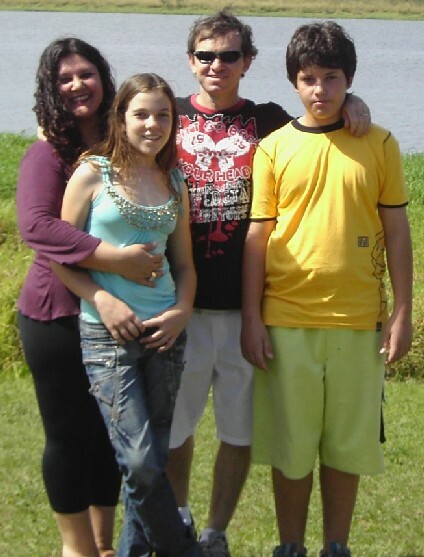 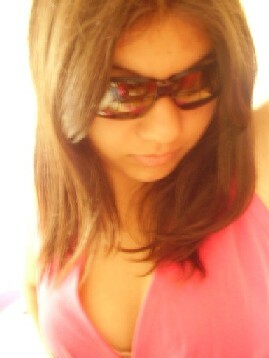 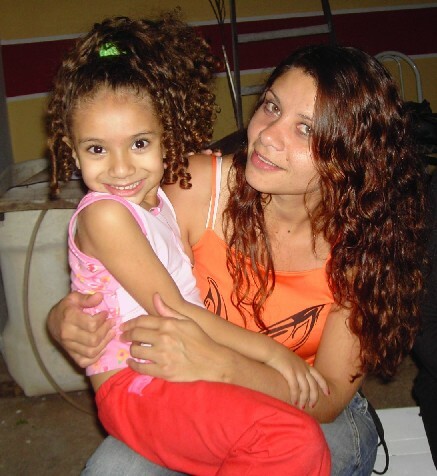 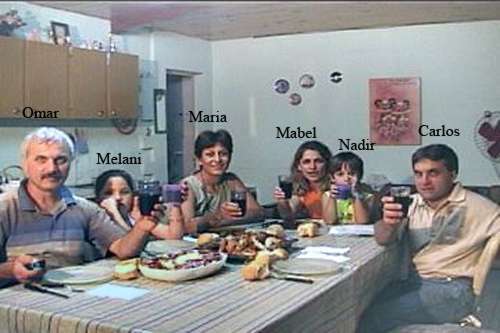 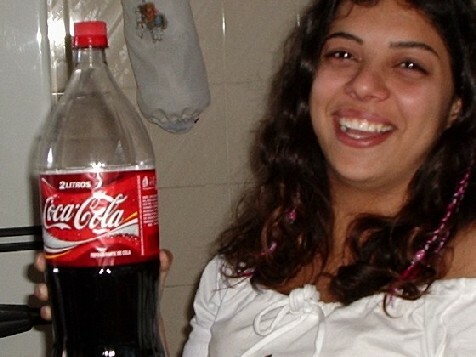 Bruna4 - The entire family! 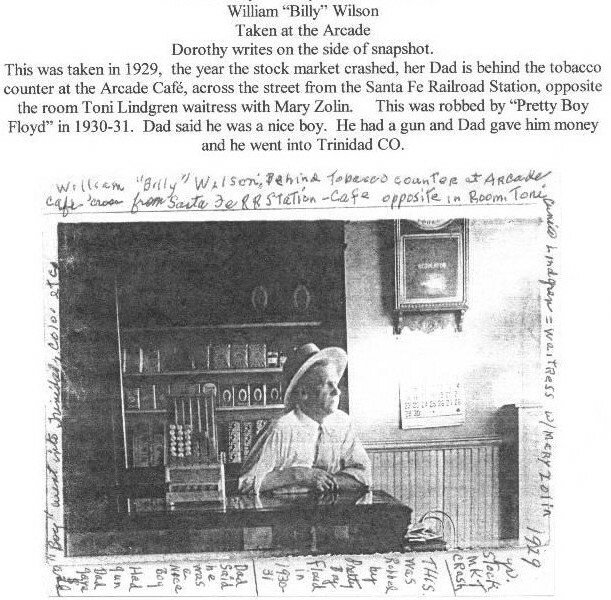 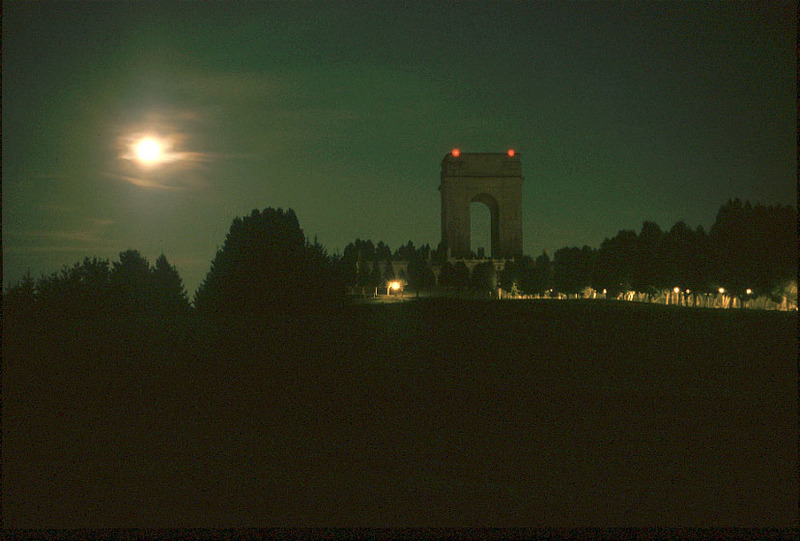 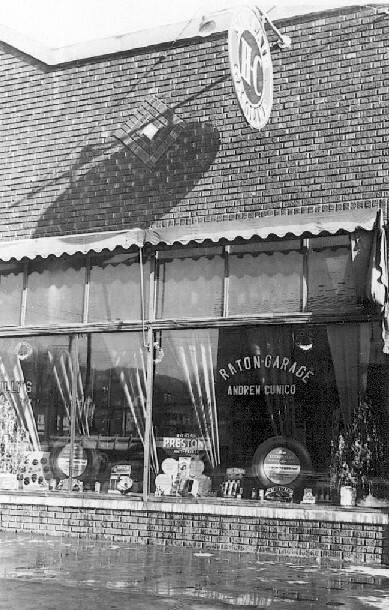 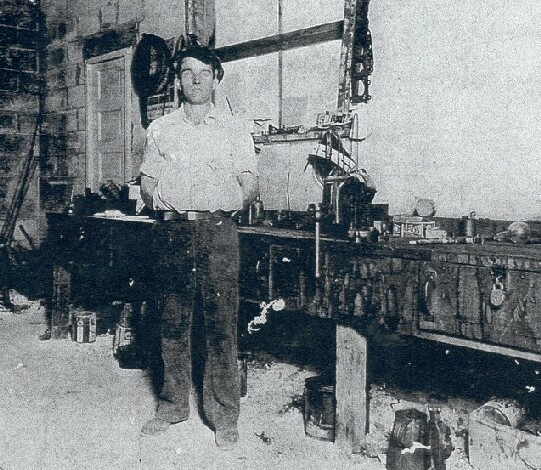 All photos below were furnished by Dorothy Wilson Patterson. 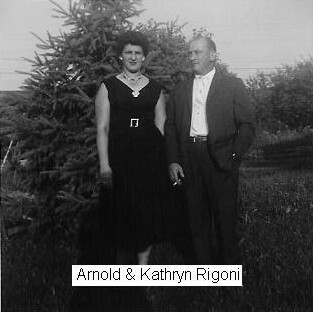 All photos below were furnished by Karylyn Petrie. 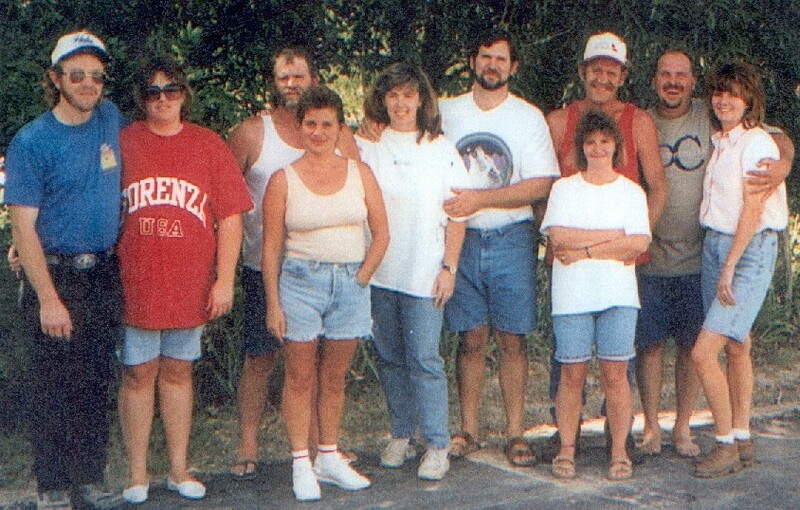 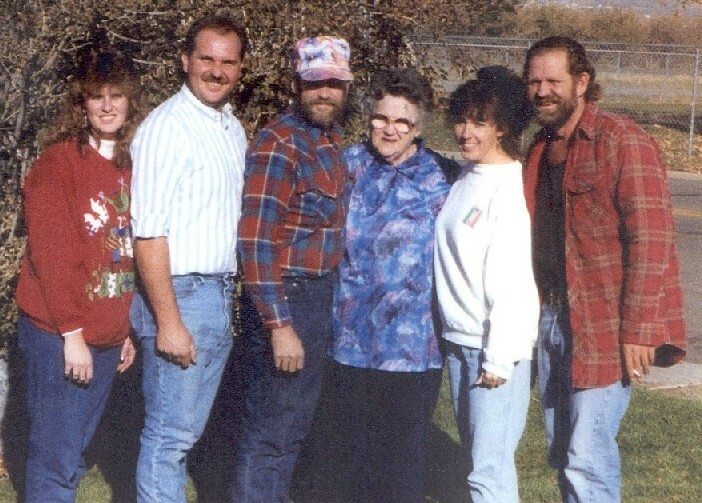 karylyn4 - Cunico Group (back: Uncle Coonie, Uncle Ponch, Uncle John, Uncle Gene, Uncle Mike front: Aunt Della, Aunt Toni, Aunt Margie, Grandma Angie, Aunt Mary. 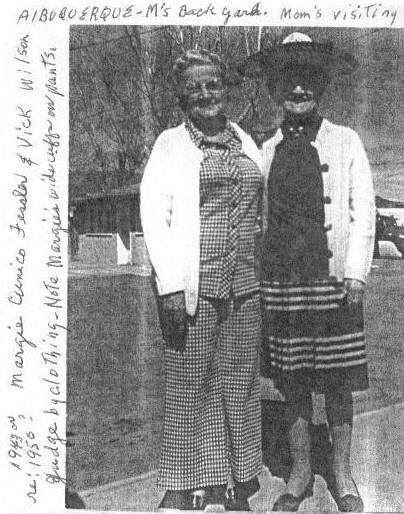 Karylyn found (2) post cards in her Aunt Toni's records. 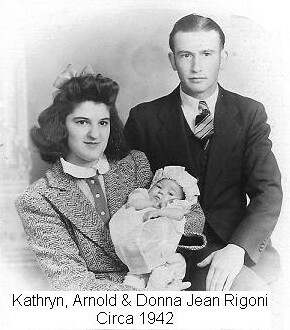 They originally belonged to Karylyn's Nona, Maria Rodigherio Cunico. 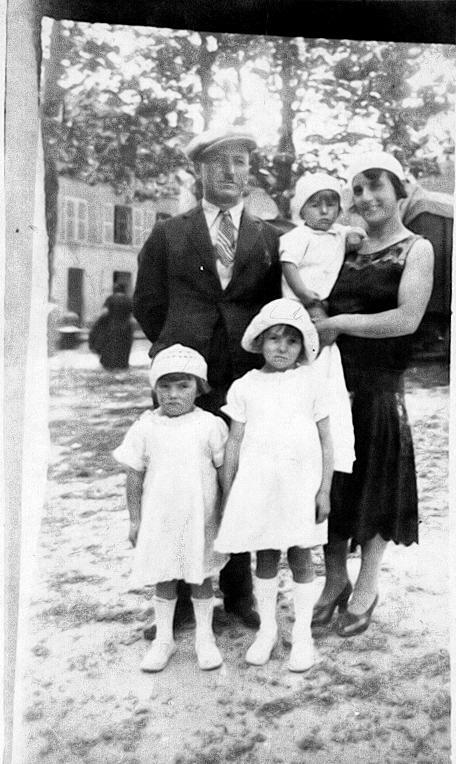 They appear to be Odette's family. 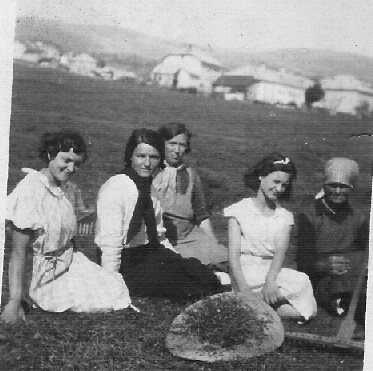 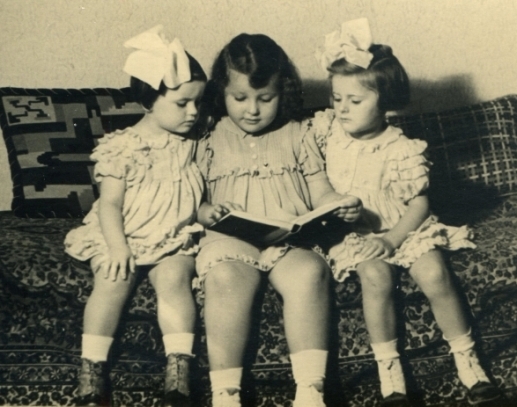 postcard1 - 1st postcard - Barbara Carli's parents and her daughter? 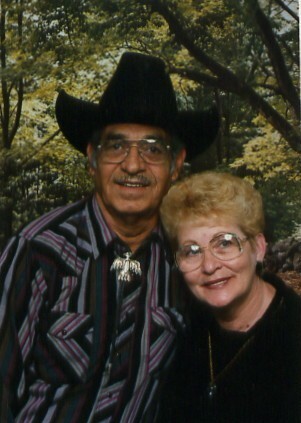 All photos below were furnished by Mary Ann Salas. 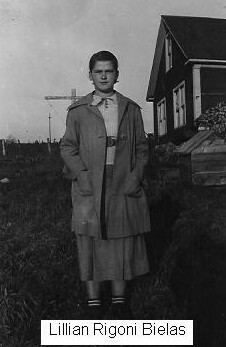 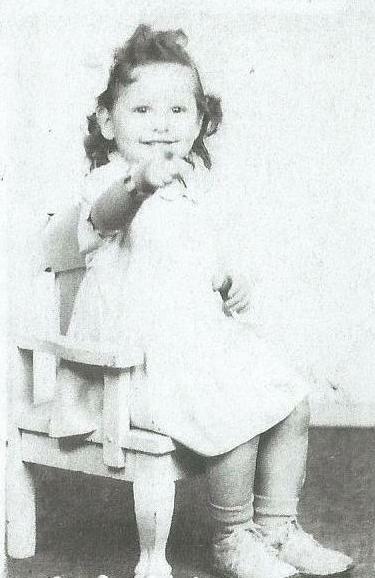 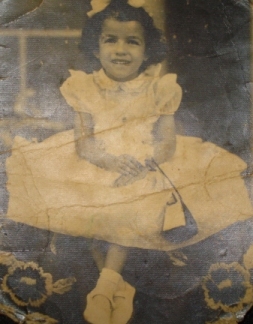 andie7 - unknown, guessing Antonio Cunico's children? 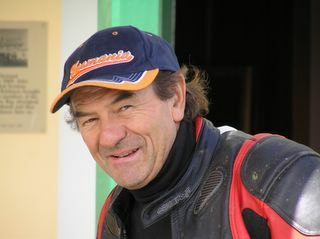 gallagher2 - Antonio Emilio (Anthony B.) 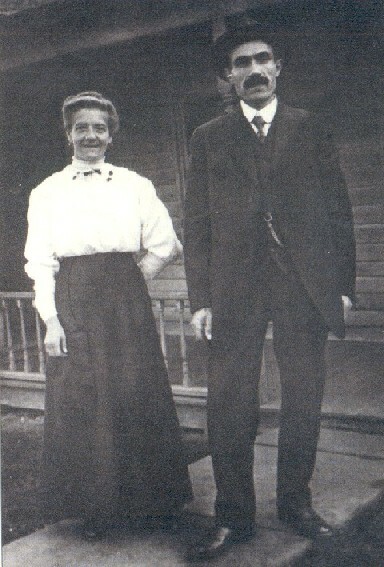 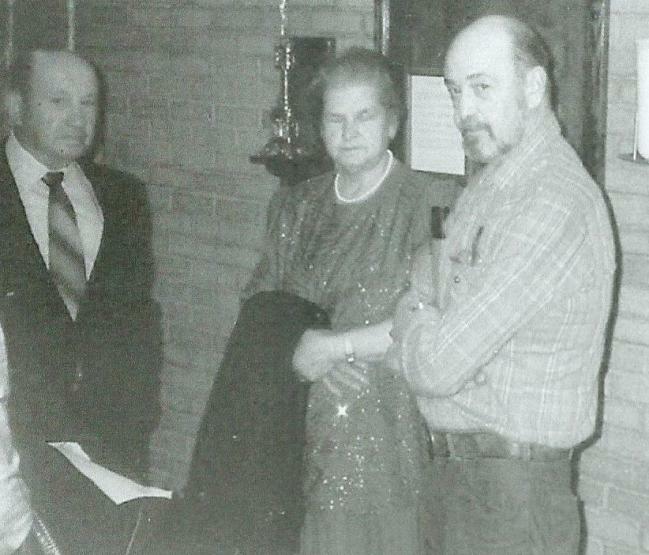 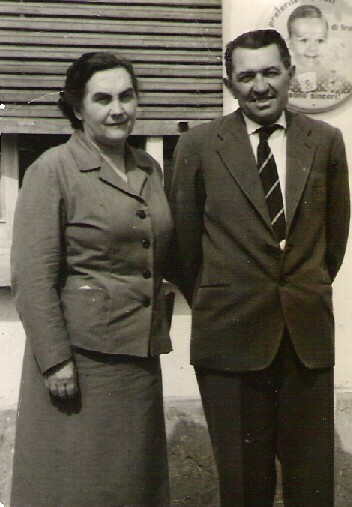 Cunico and Margaret (Mary) Muldoon - attendants Peter & Ruth Larese. 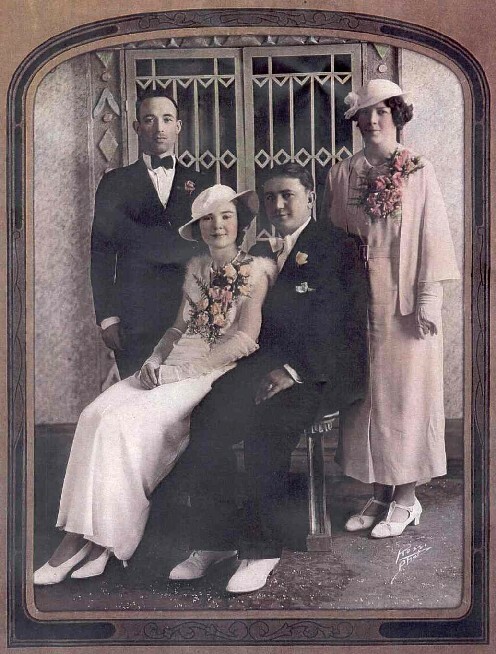 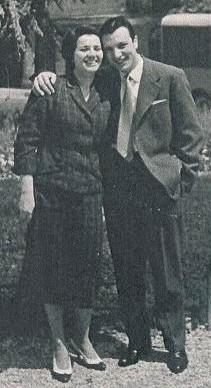 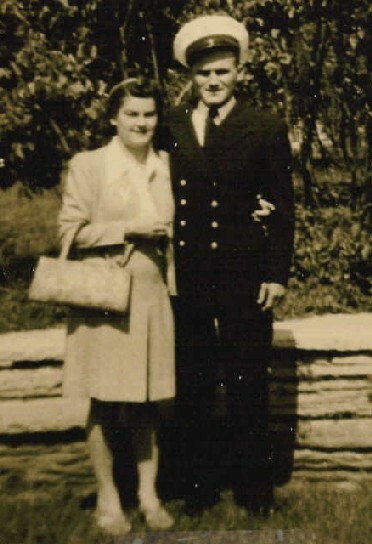 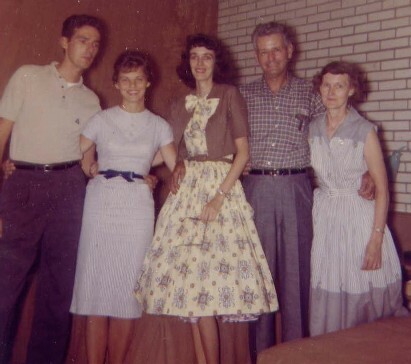 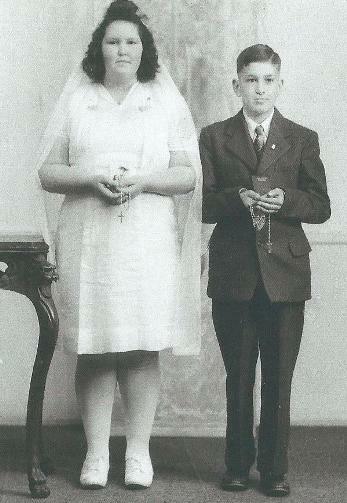 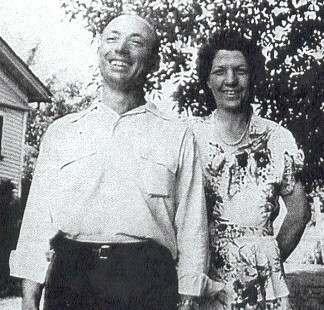 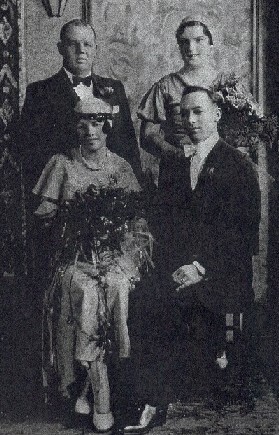 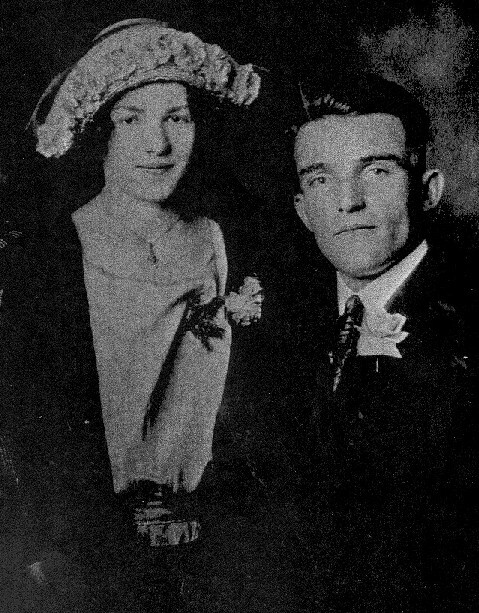 The wedding ceremony for Mary Ann's parents was held 22 Jun 1935 at St. Dennis church in Lockport, IL. 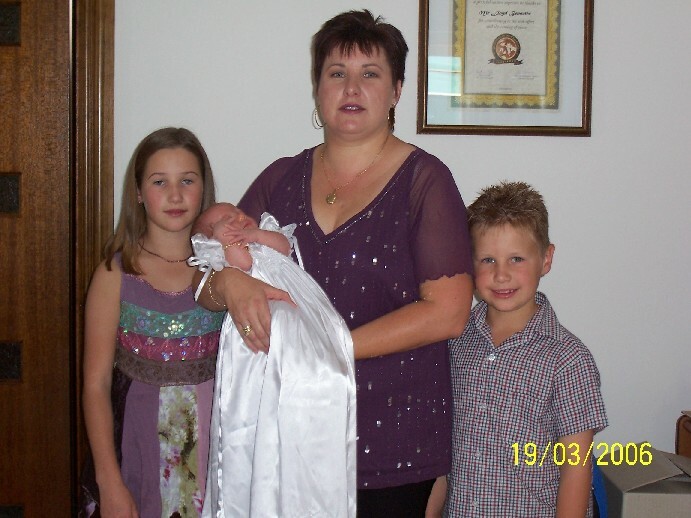 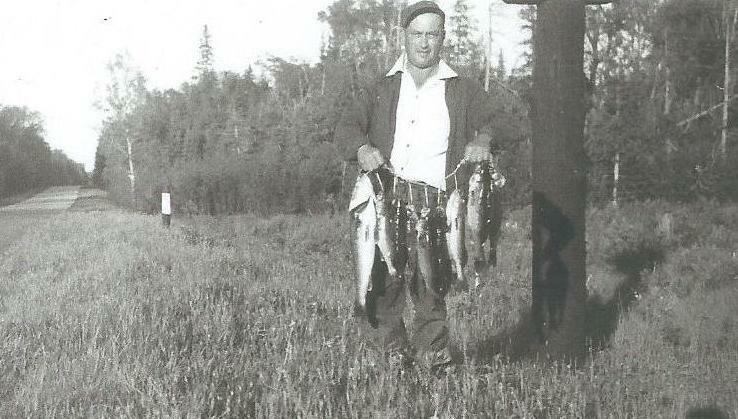 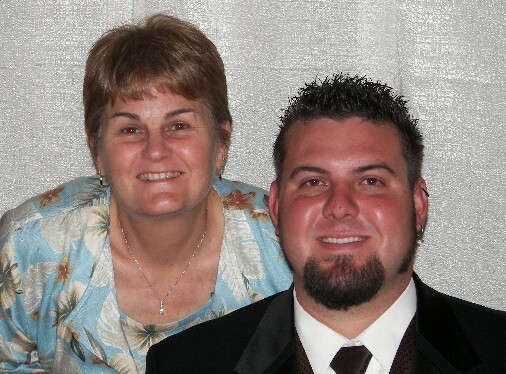 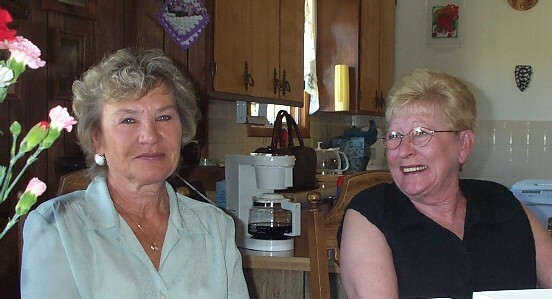 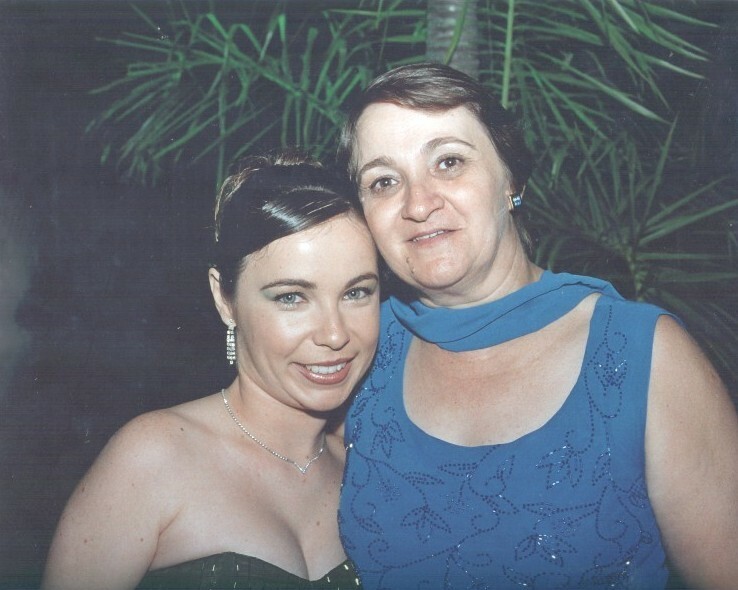 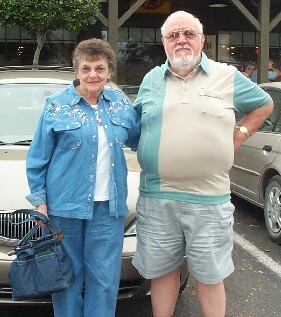 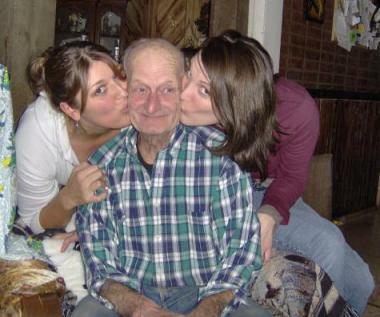 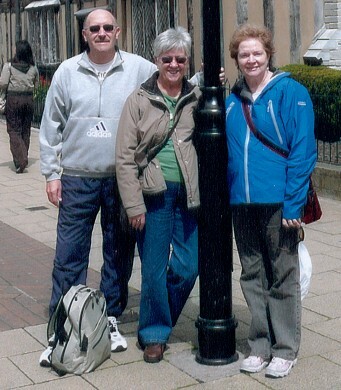 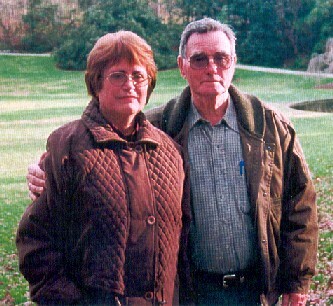 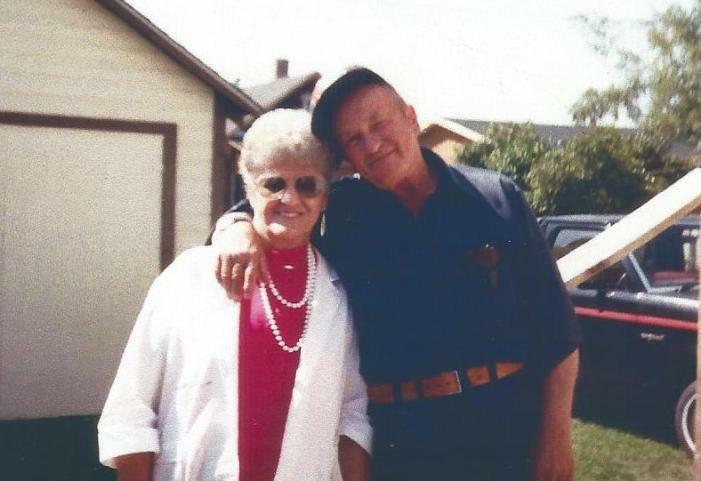 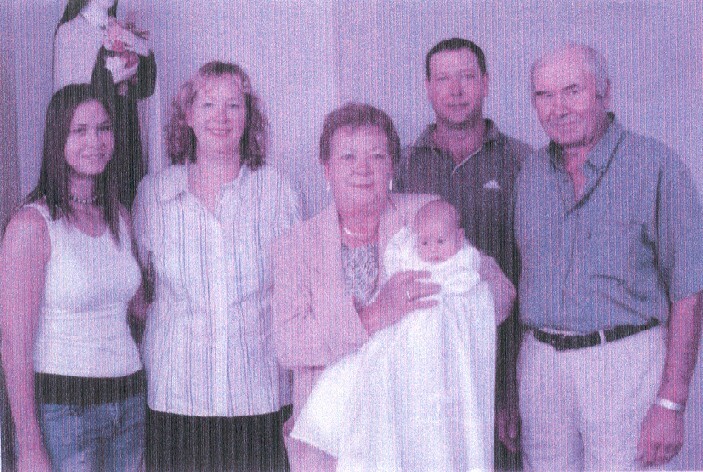 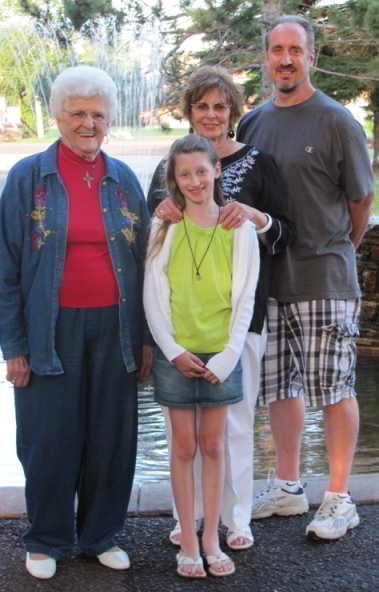 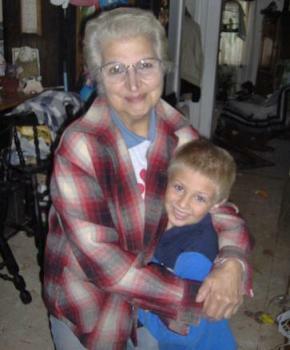 Pictures were provided by granddaughters (and sisters) Coreen Compton and Doreen Severin. 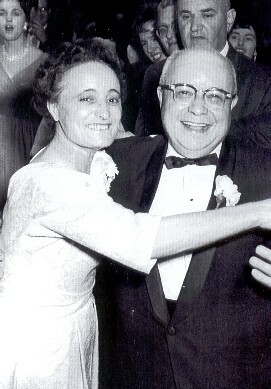 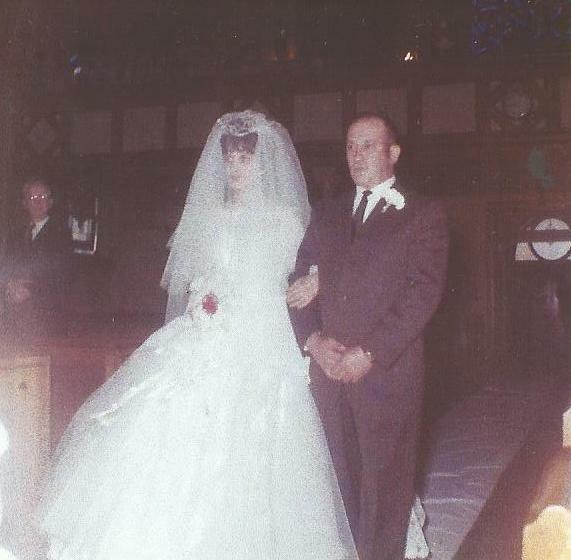 Ezio13 - Giuseppina & Luigi (Ezio's Aunt & Uncle) at the marriage of Louis S. Cunico & Roseann McGovern 19 Nov 1960. 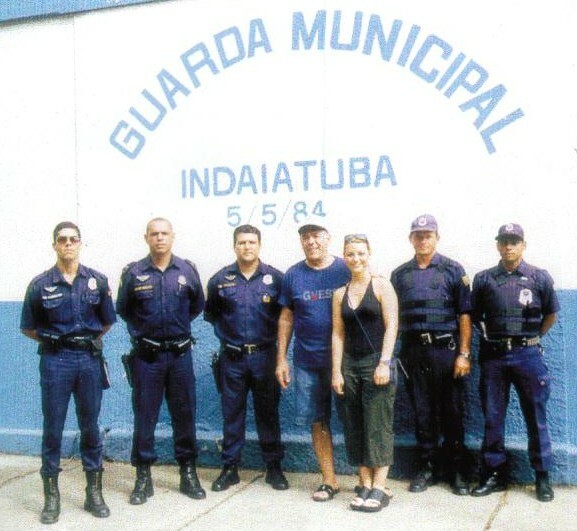 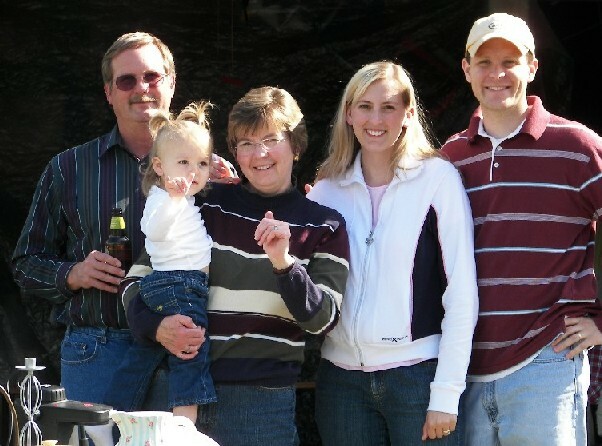 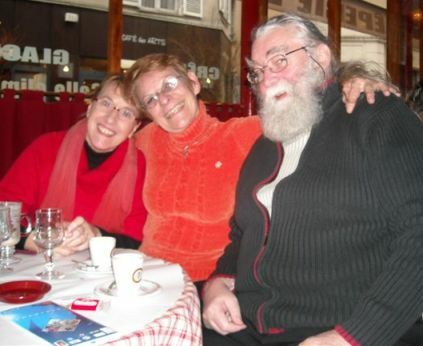 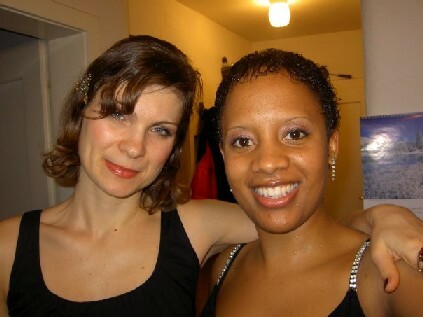 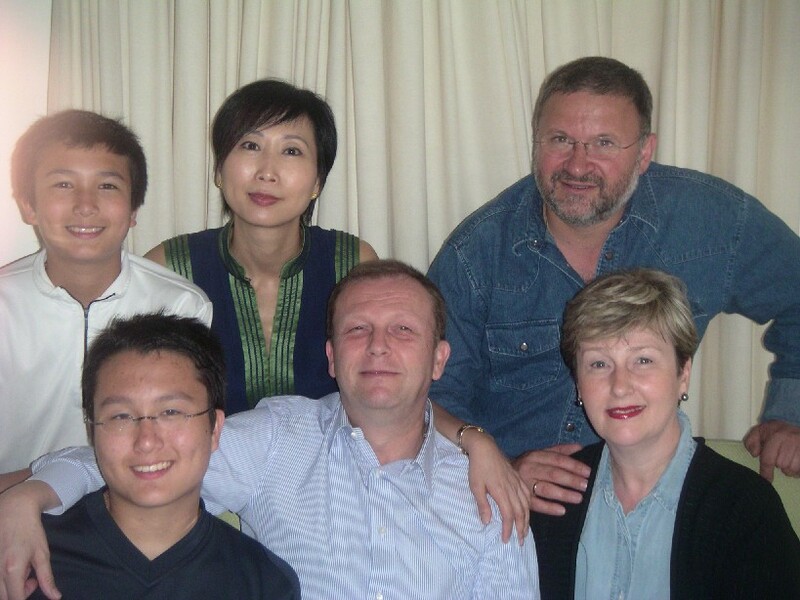 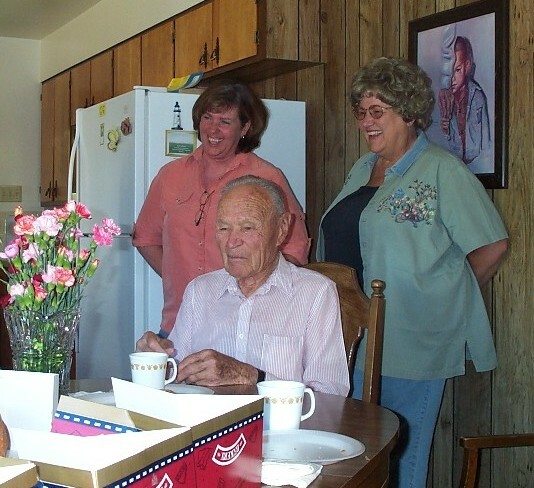 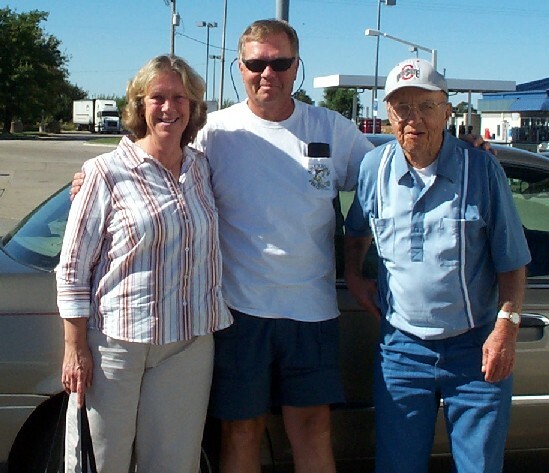 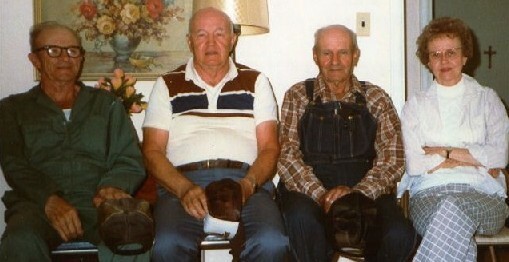 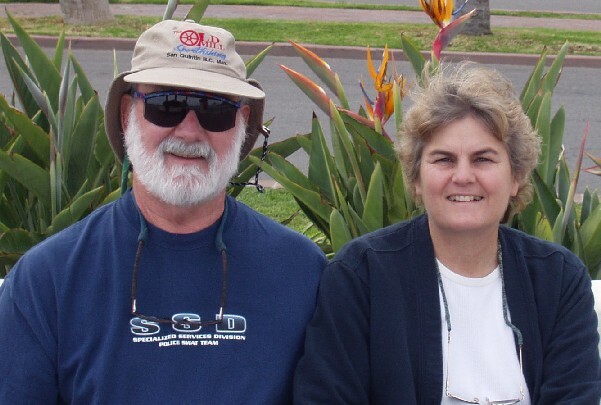 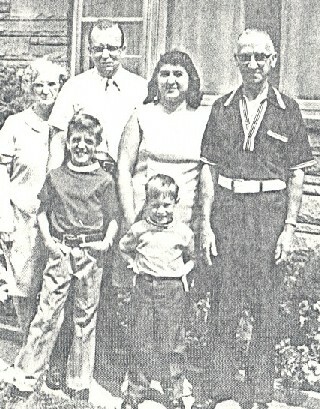 Note from Louise Schwaegler: I looked at this picture and thought I know those people! 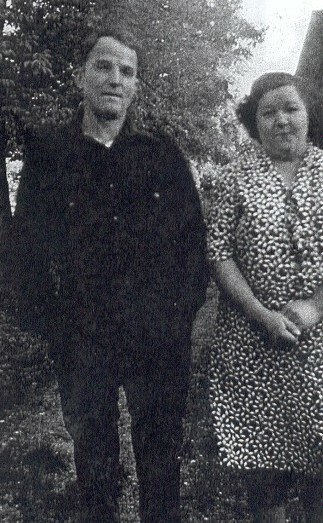 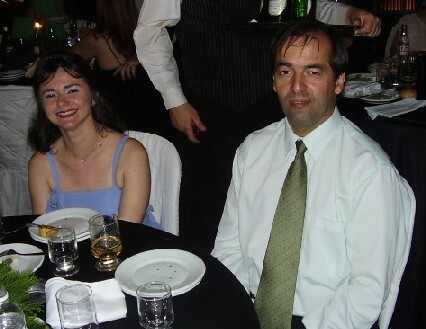 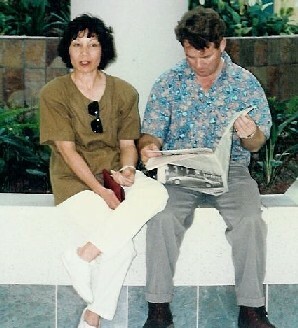 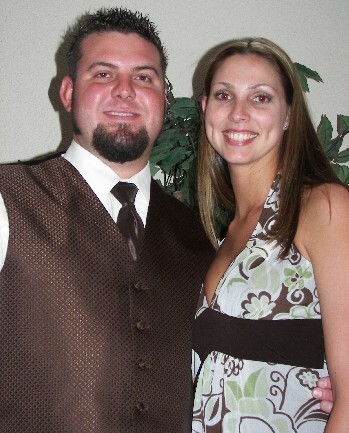 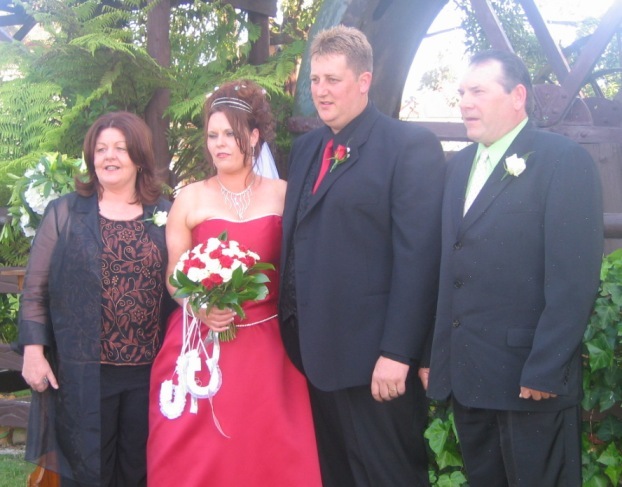 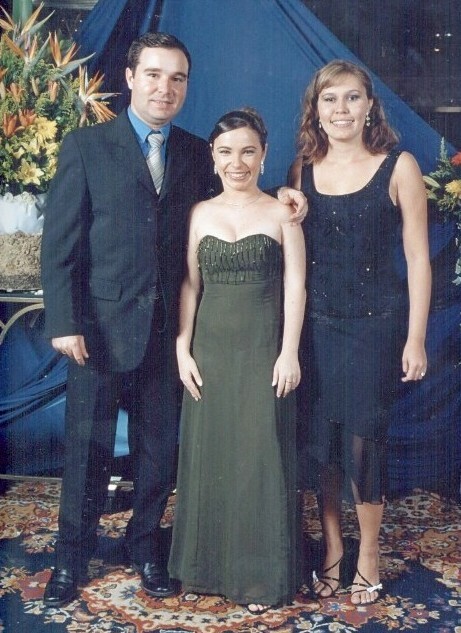 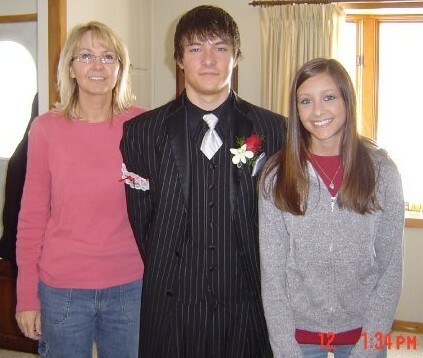 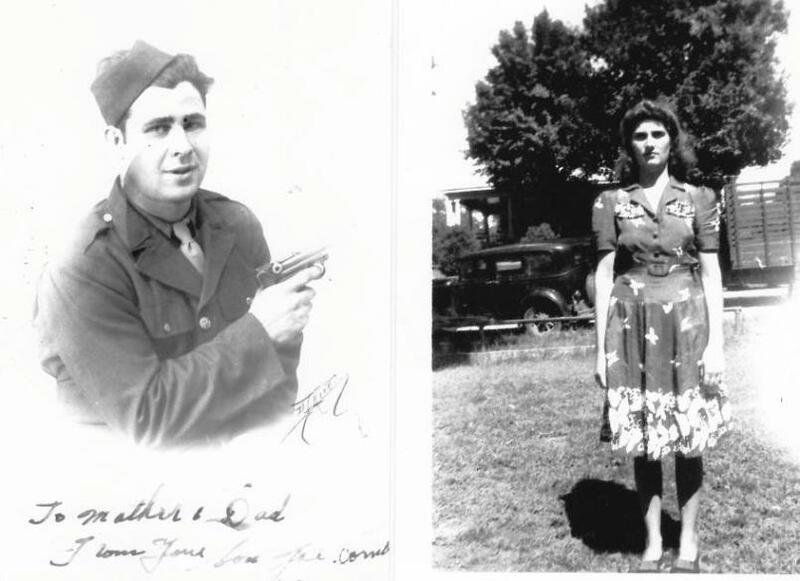 They are brother and sister, and I and my family were most likely at that wedding. 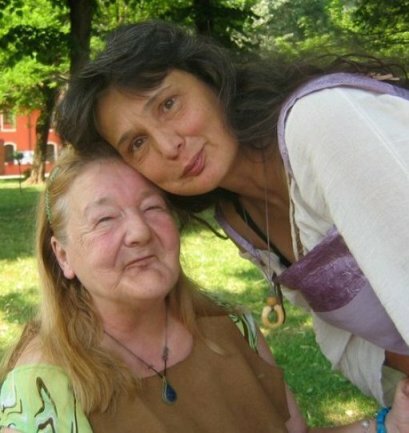 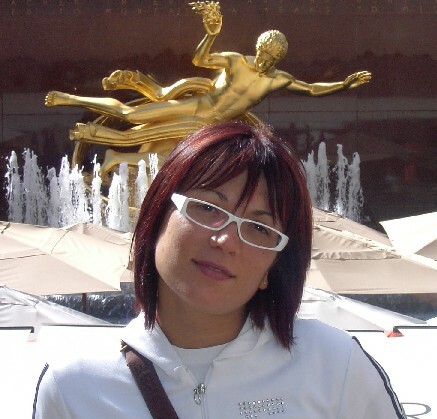 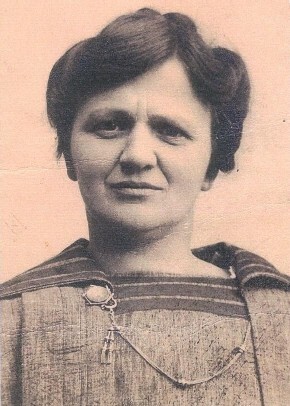 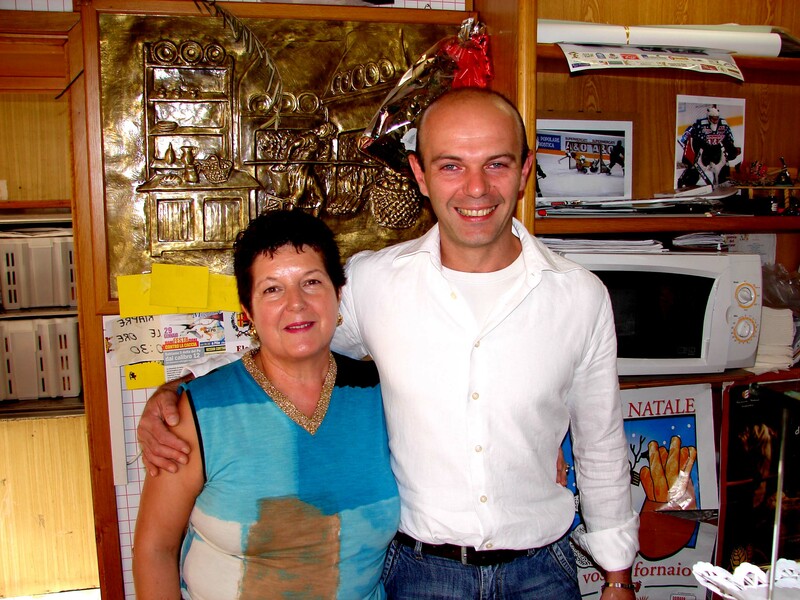 Florence Wire is the woman you see over Giuseppina's right shoulder. 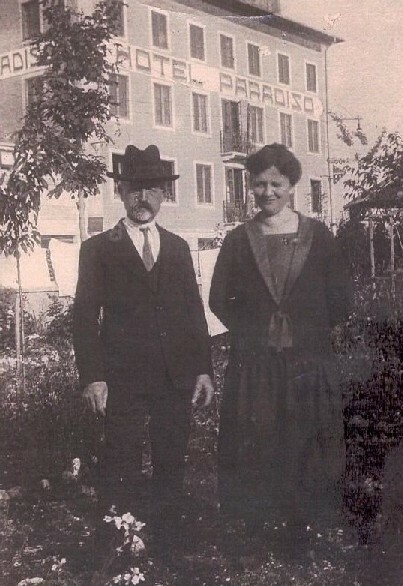 Giuseppina's brother Luigi (we called them Pina and Louie) owned a tavern on Grand Avenue in Chicago back in the late 1930's. 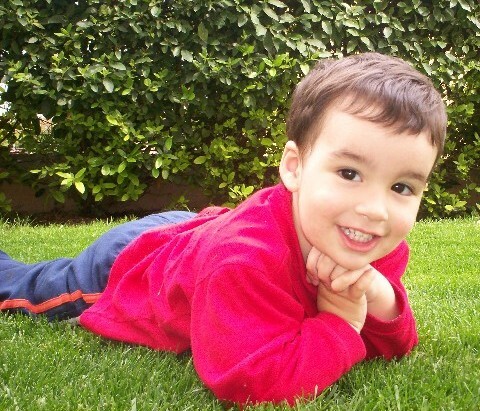 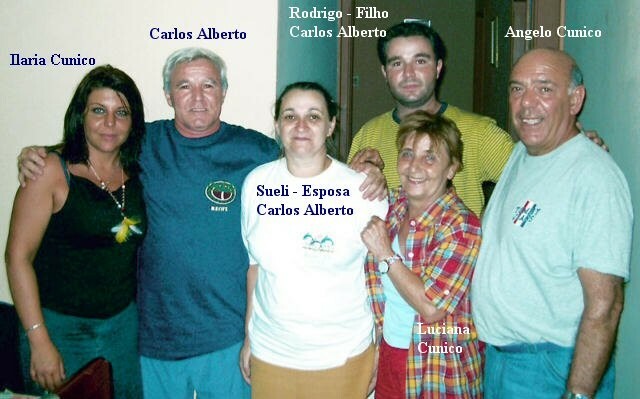 We knew Augusto as well. 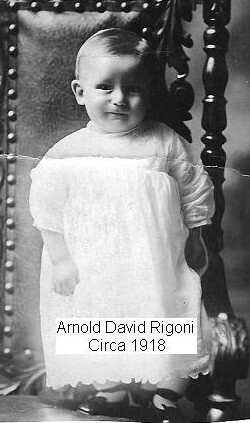 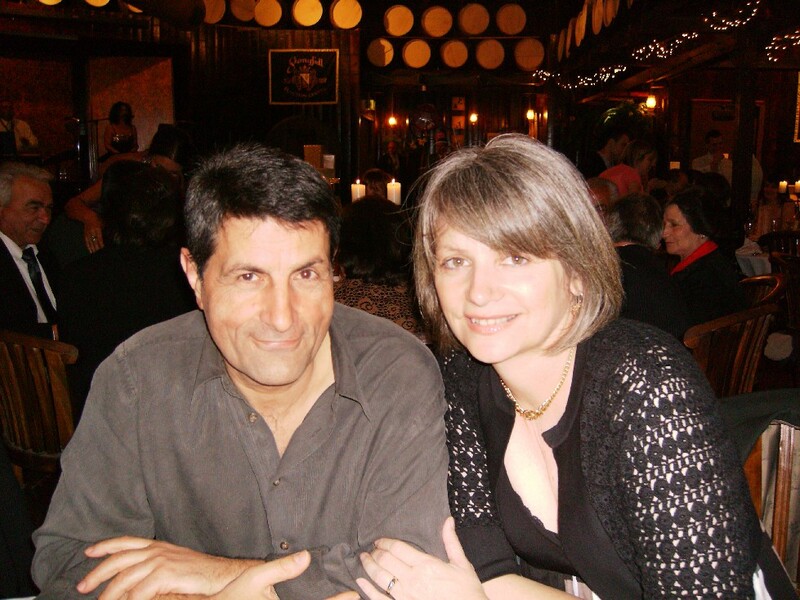 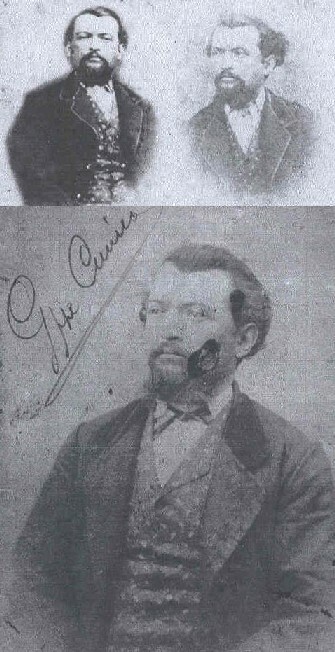 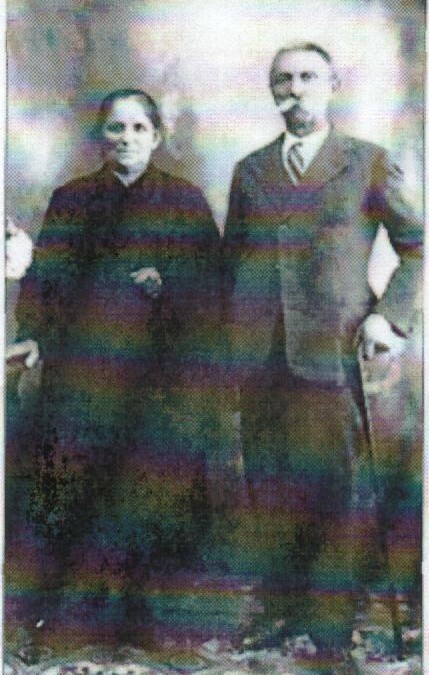 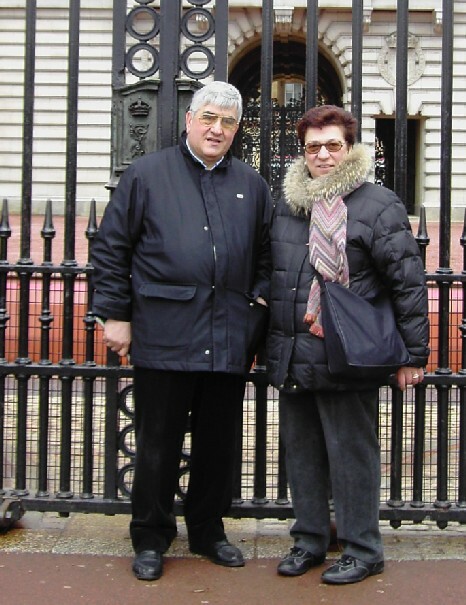 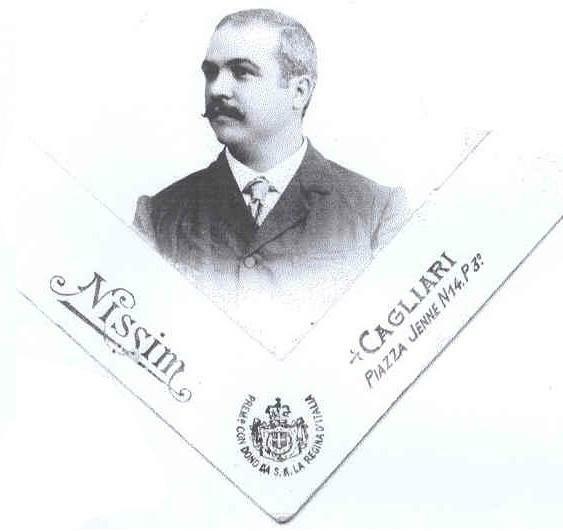 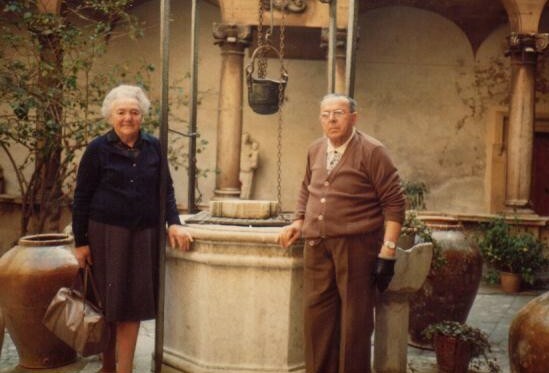 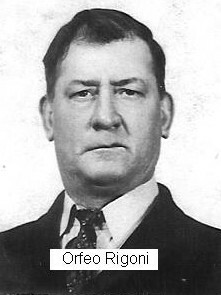 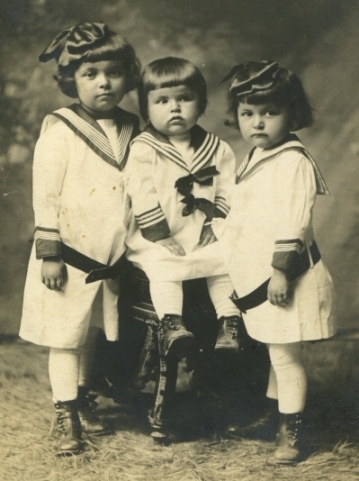 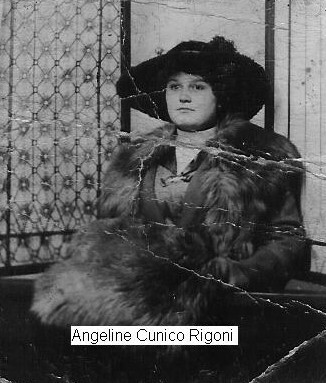 Denise and Georges J (Giorgio) Cunico were the children of Giovanni Battista Francesco Cunico (1898) & Lucia Rigon. 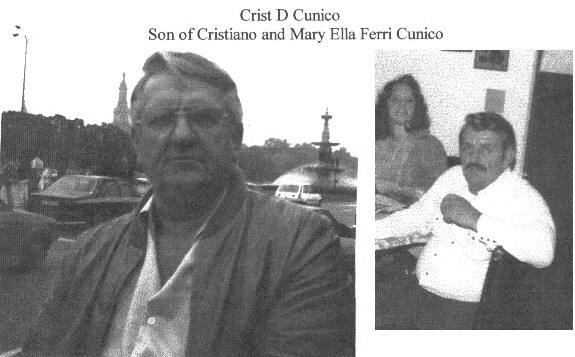 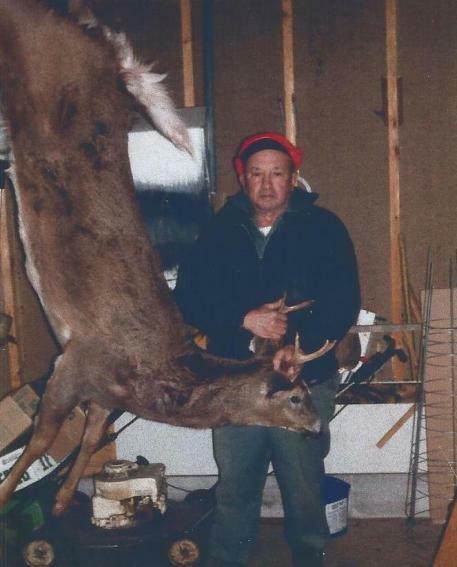 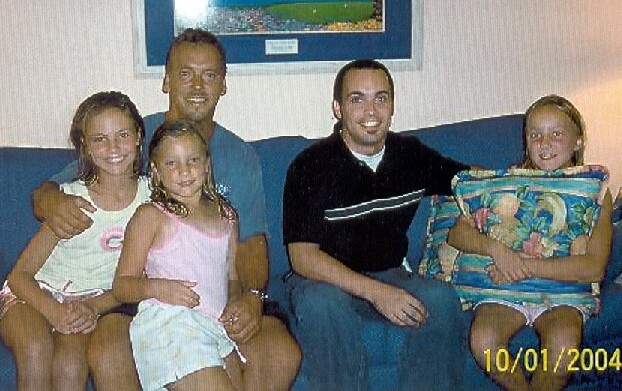 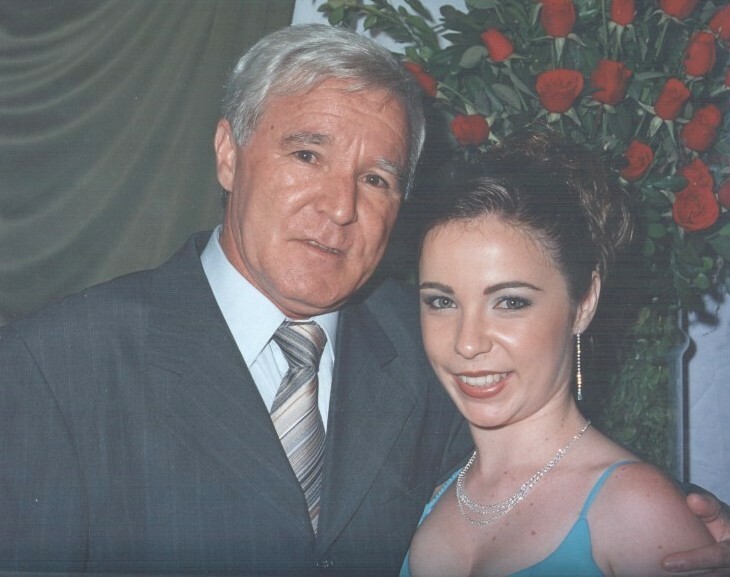 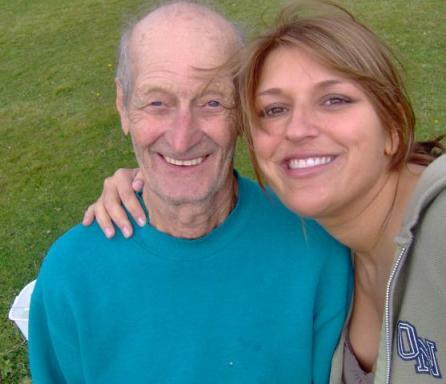 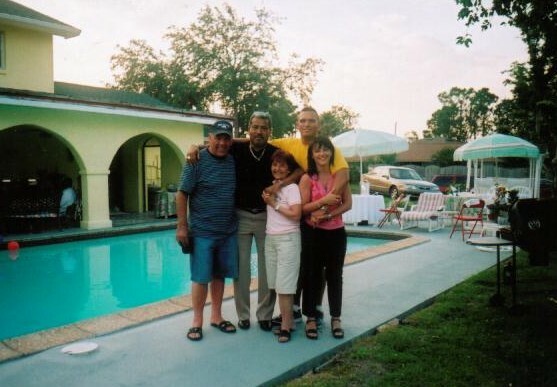 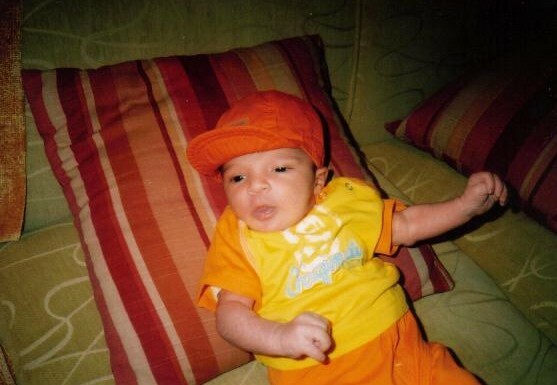 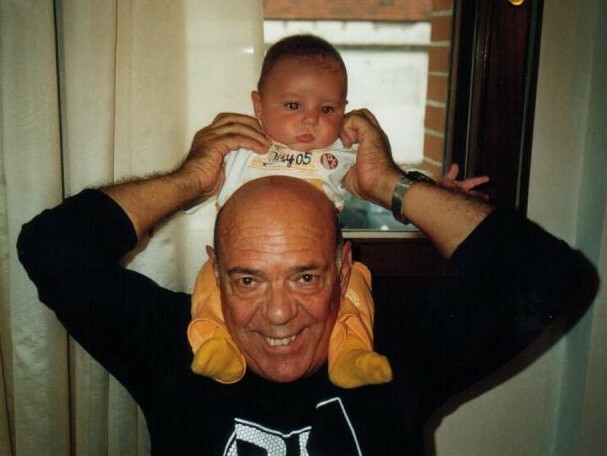 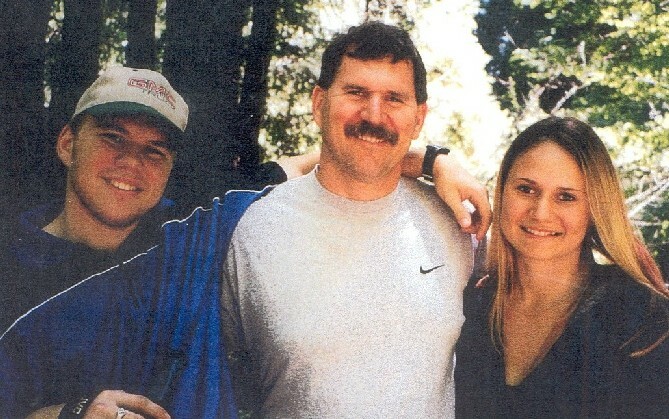 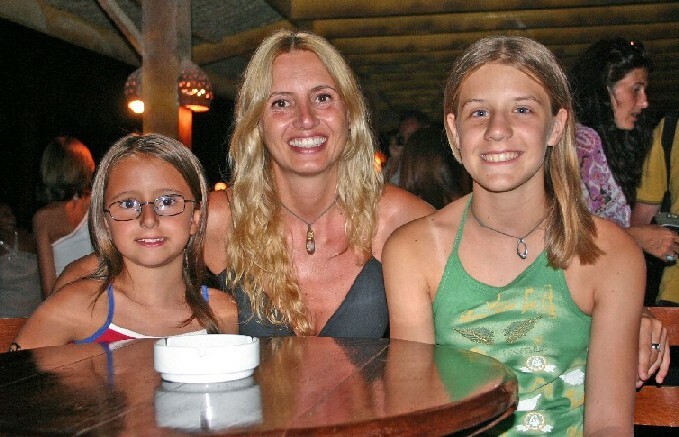 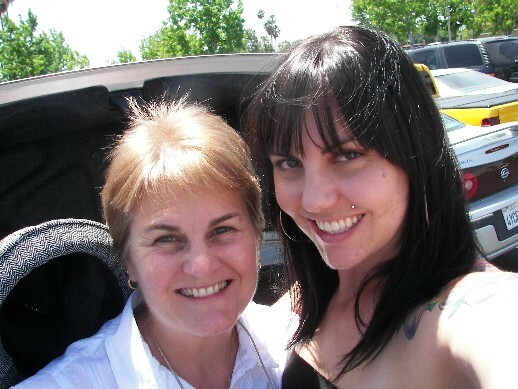 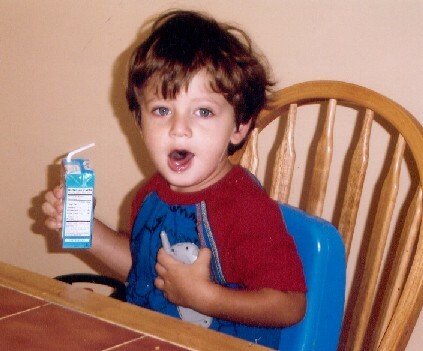 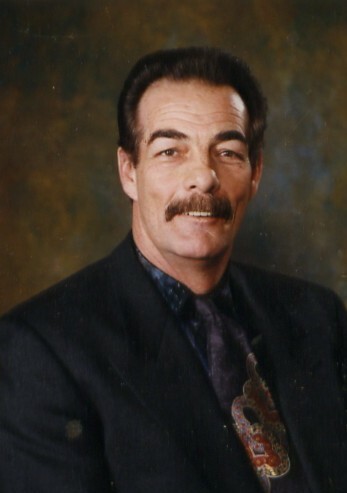 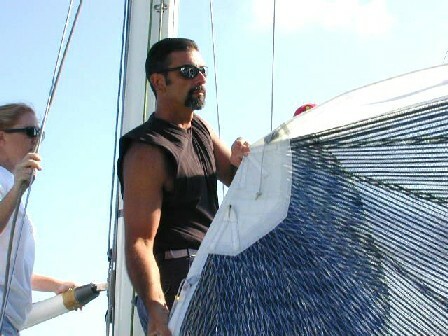 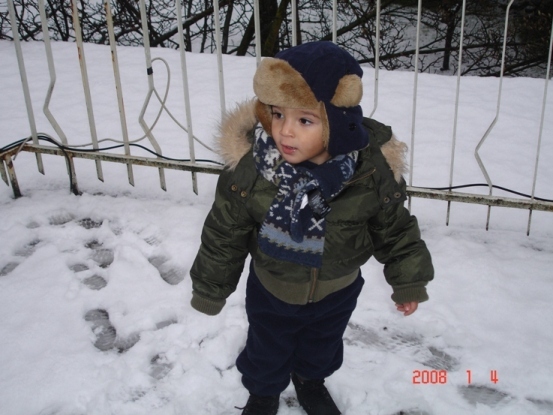 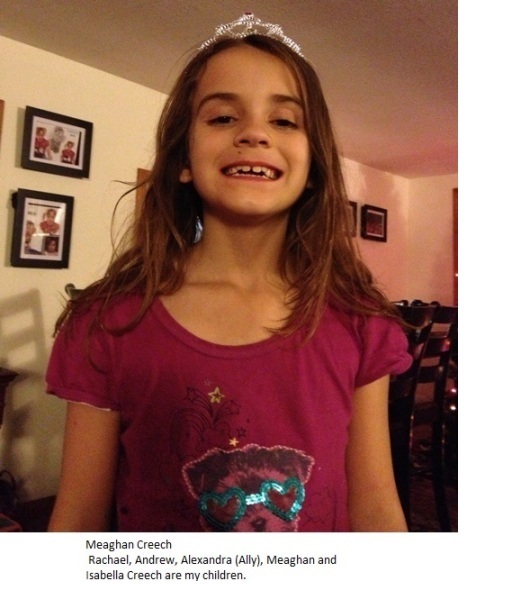 All pictures below were supplied by Marina (daughter of Denise Cunico). 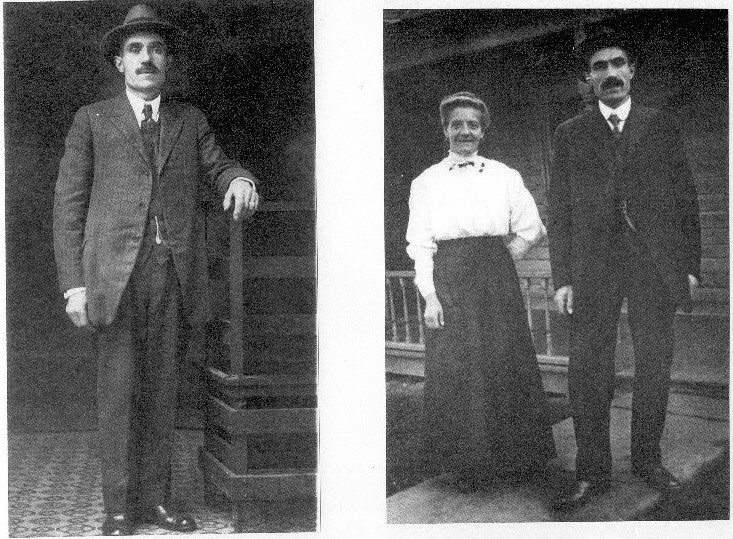 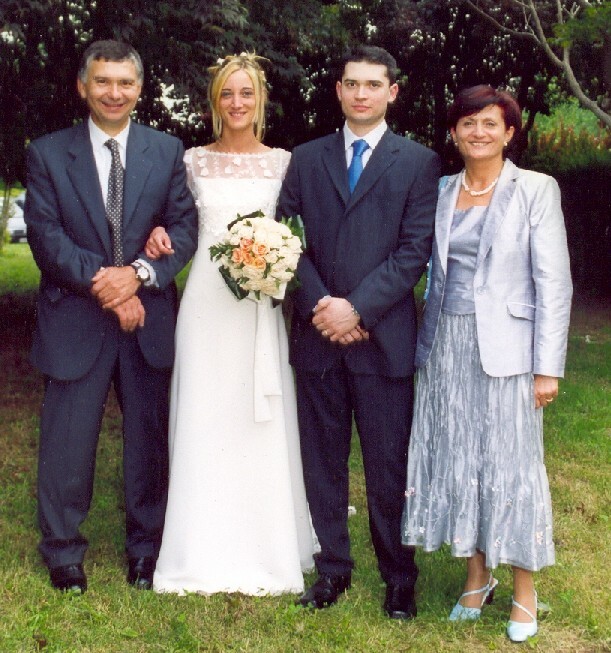 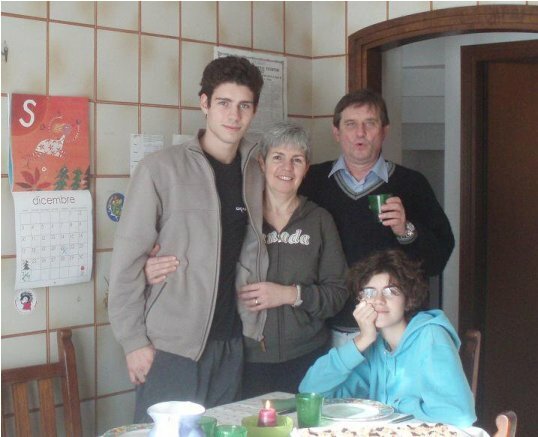 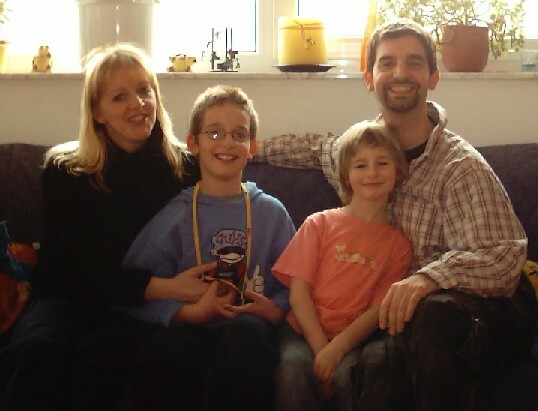 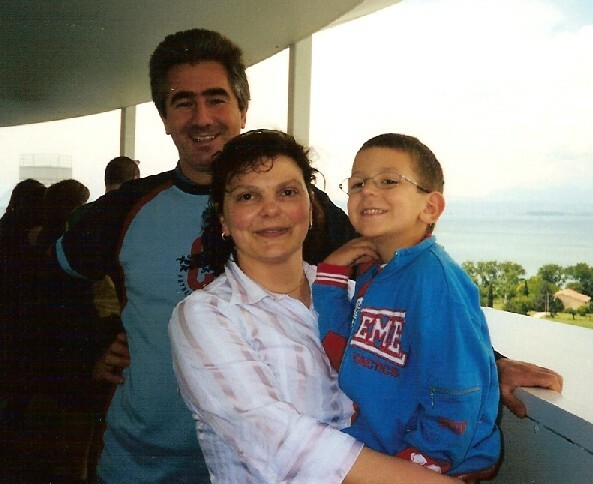 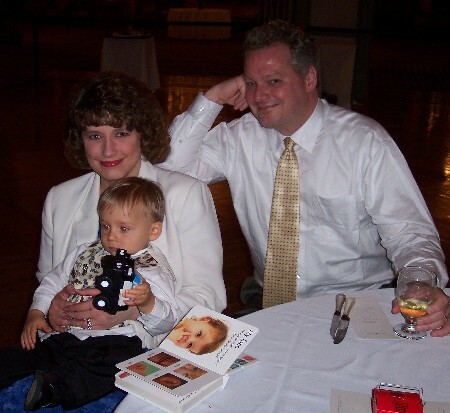 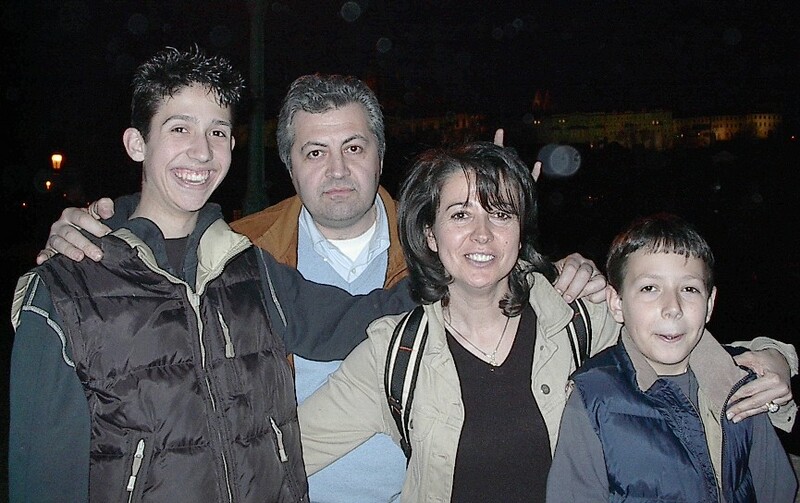 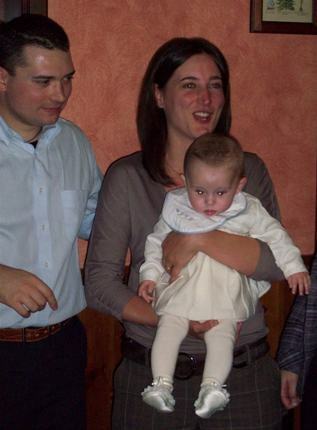 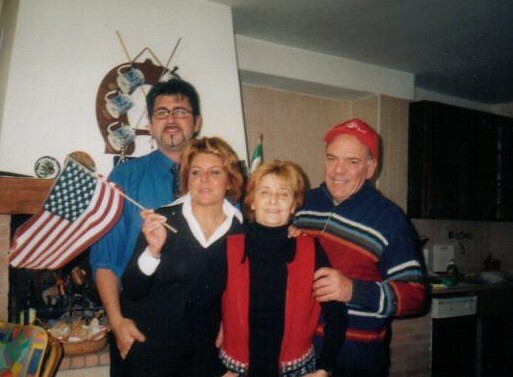 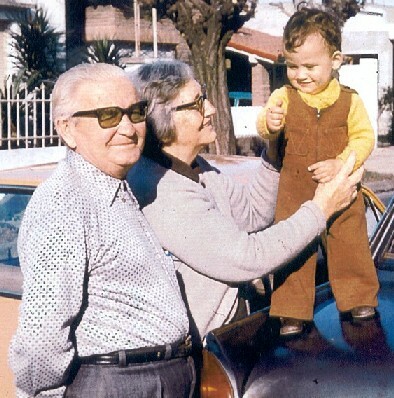 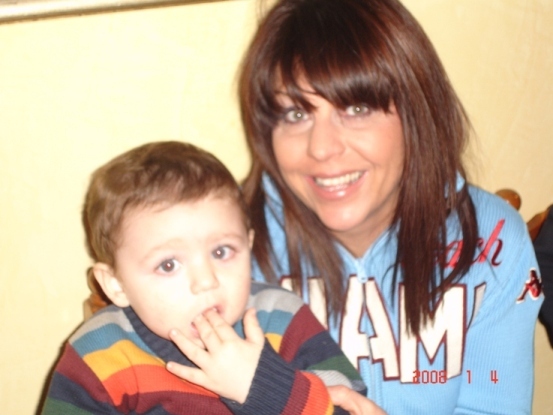 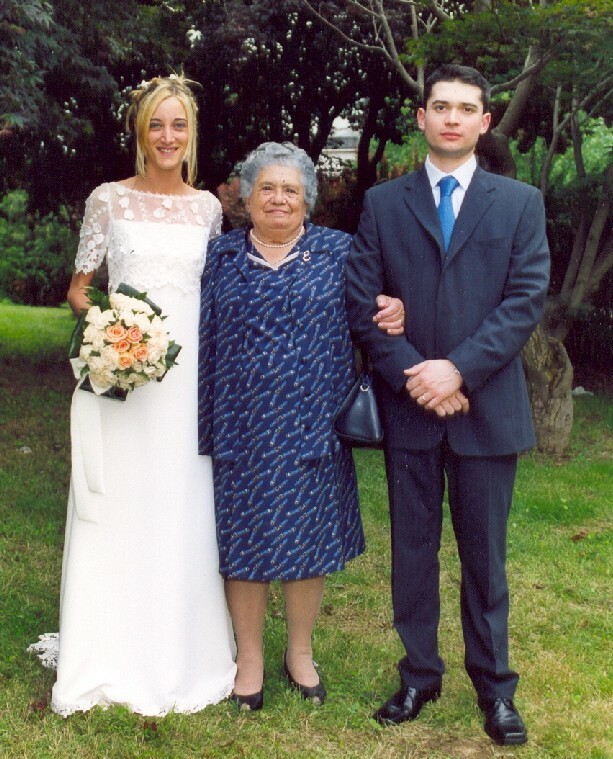 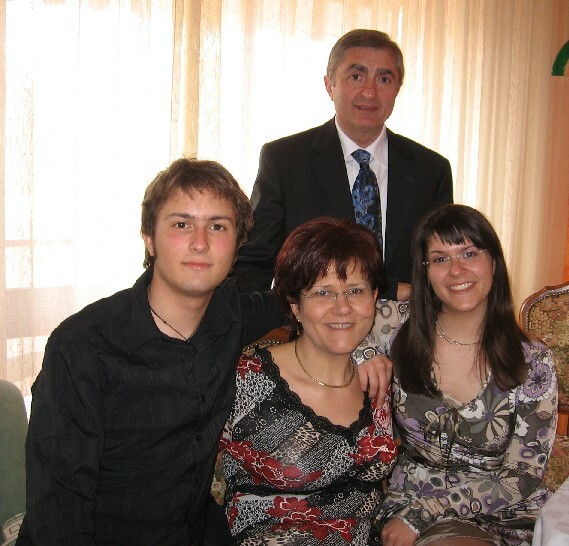 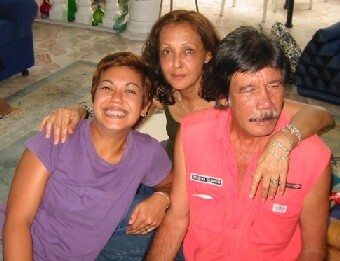 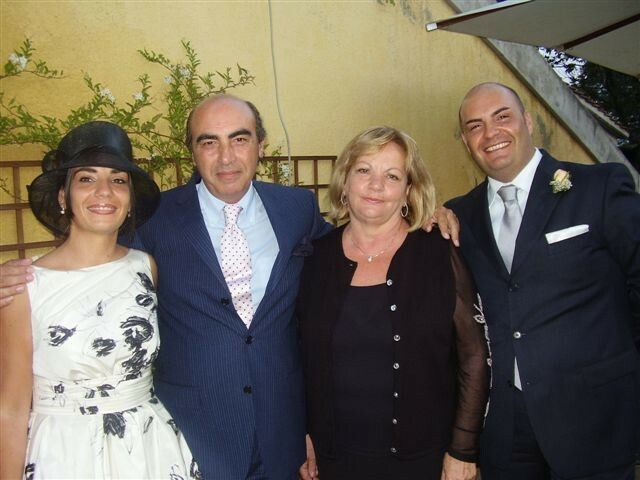 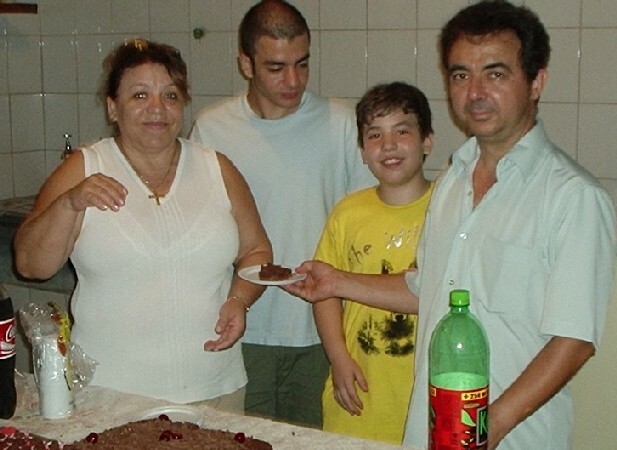 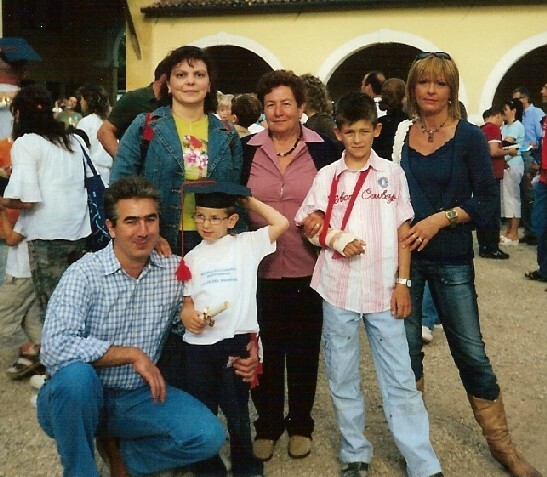 Louise8 - Attilio's sister Rina, her husband Antonio, and their son Andrino. 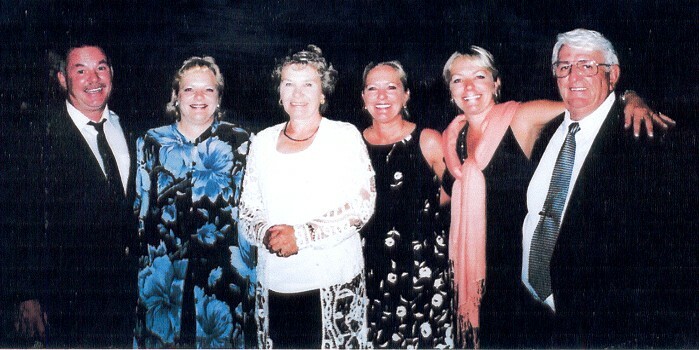 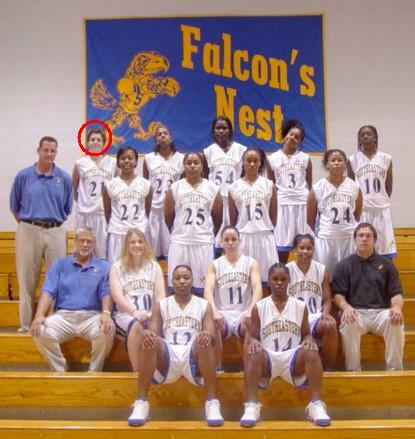 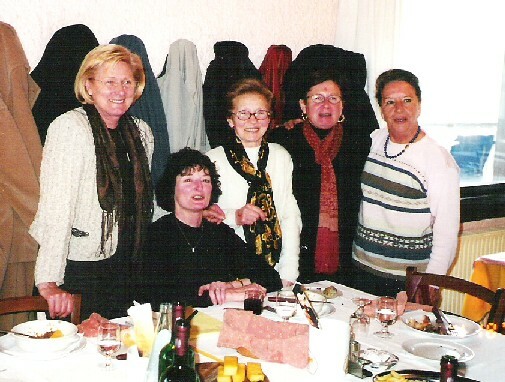 Louise9 - Rina is standing next to Luigia in the top row. 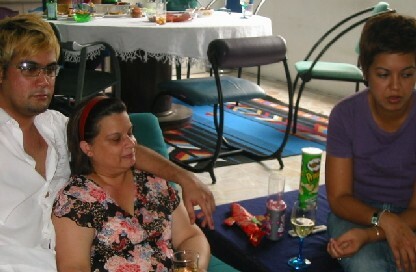 Don't know the rest. 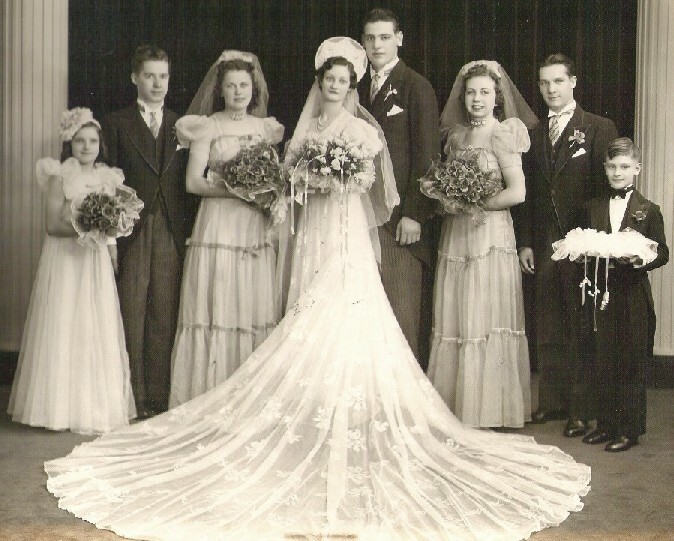 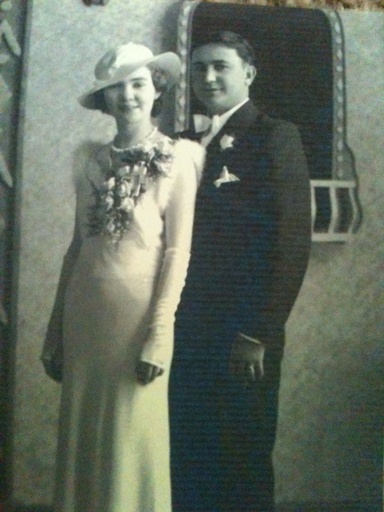 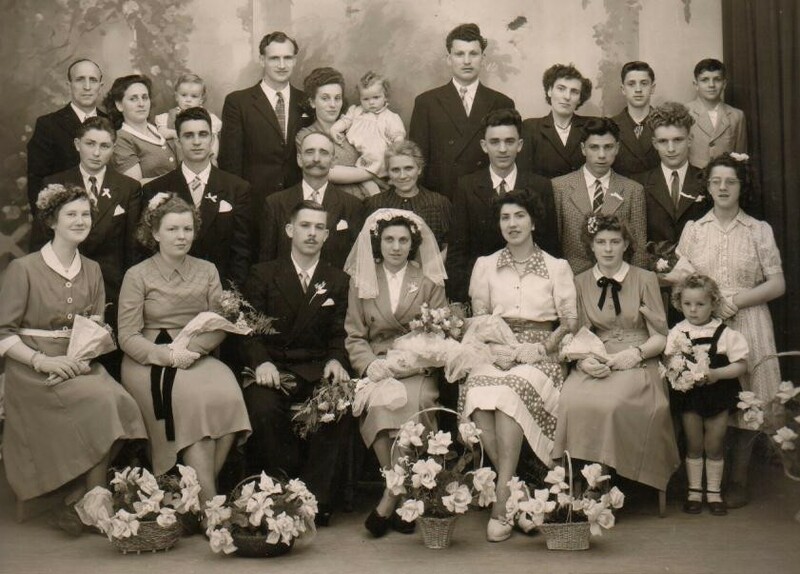 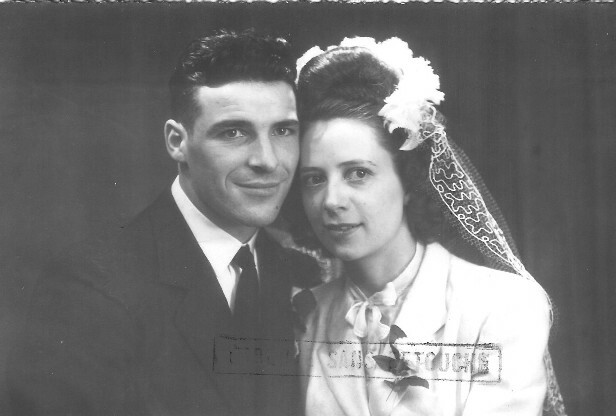 Louise12 - In this wedding picture of my parents, the woman next to my mother is Lillian Munari, Giovanni's daughter. 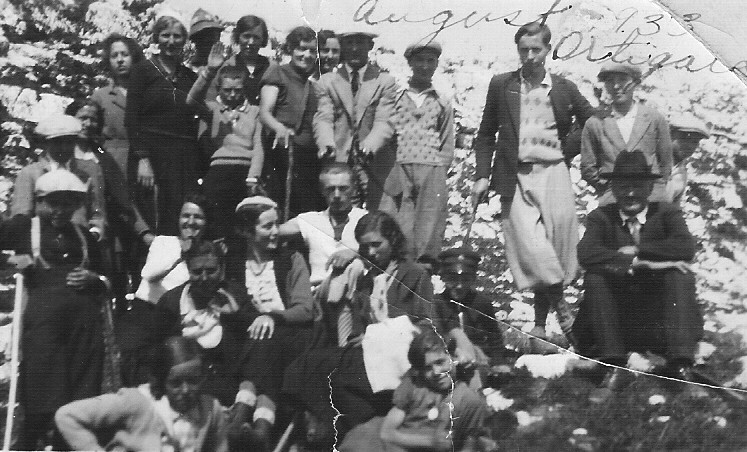 The girl to the far left is Florence Weir, and the young man to the far right is my uncle Ottilio. 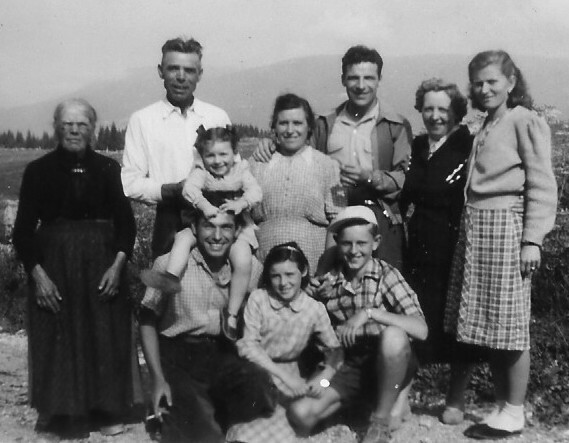 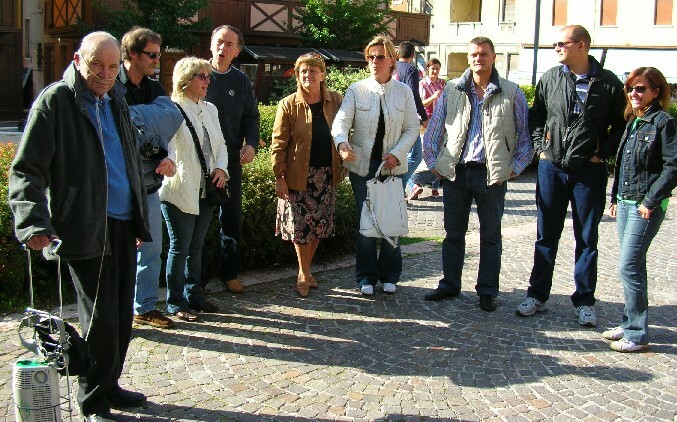 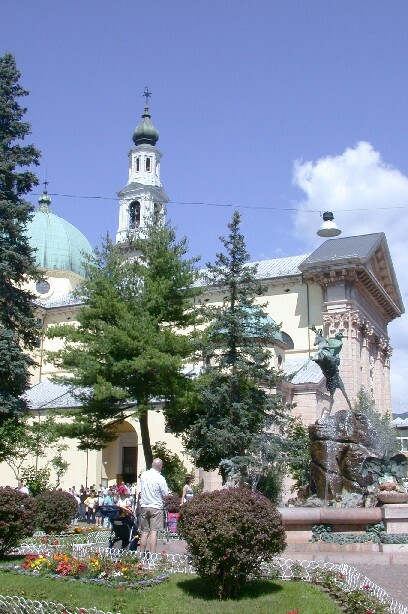 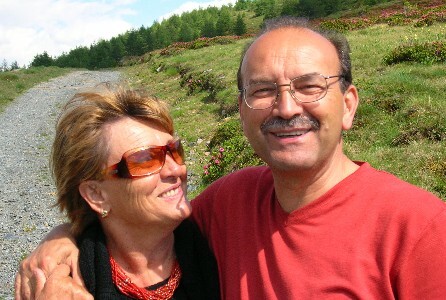 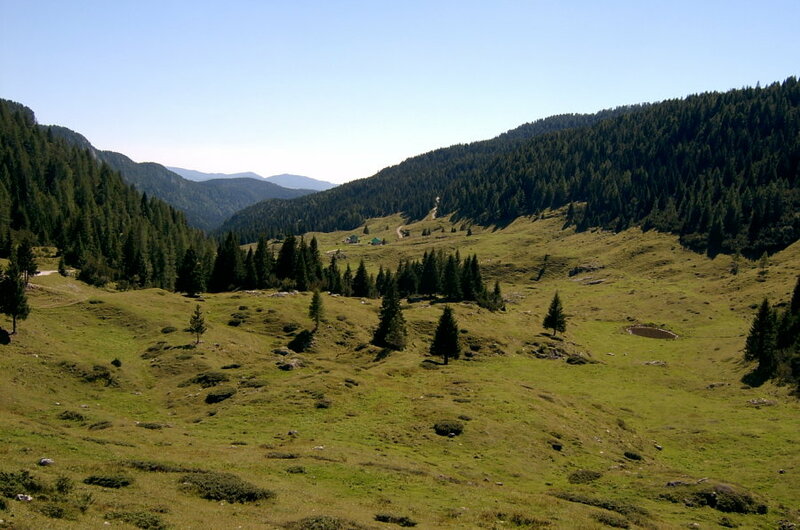 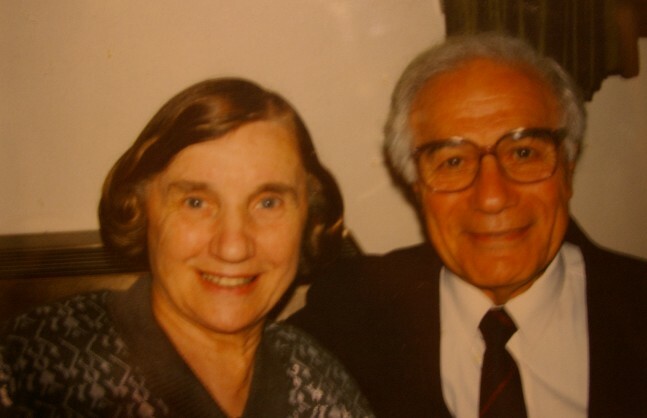 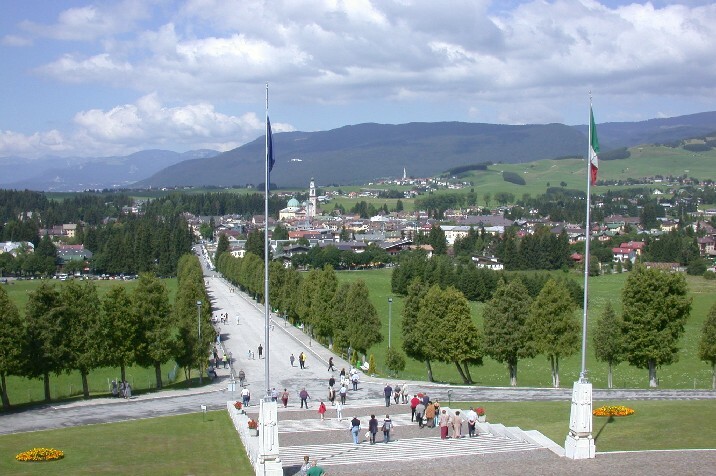 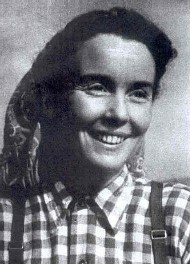 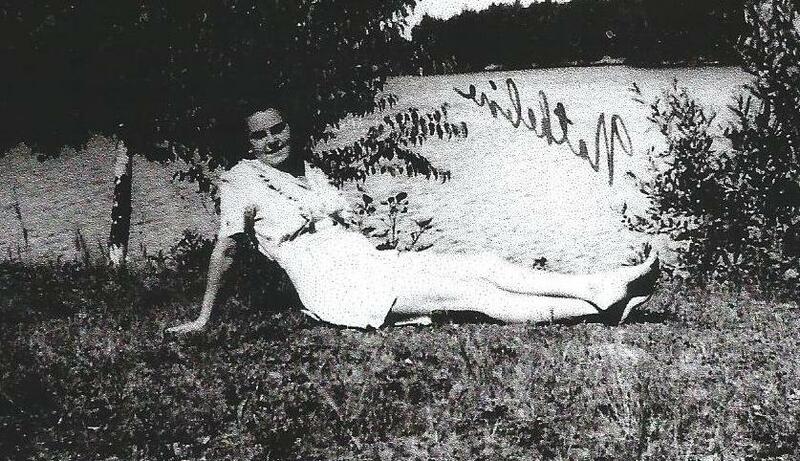 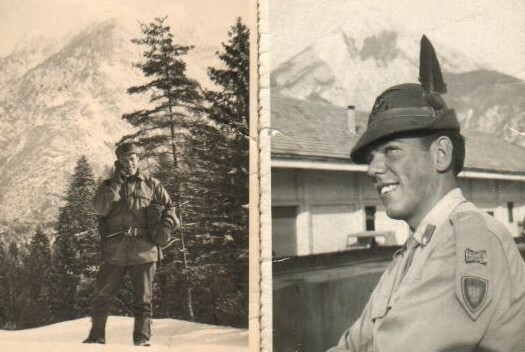 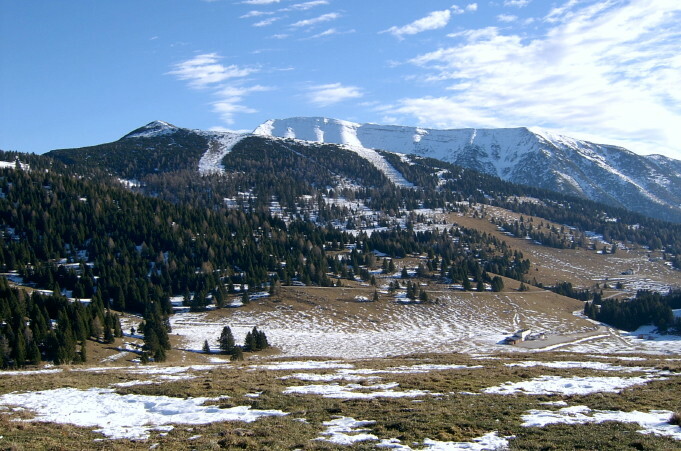 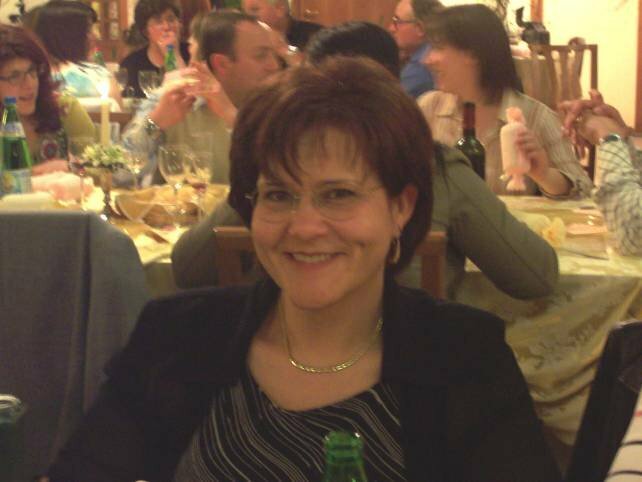 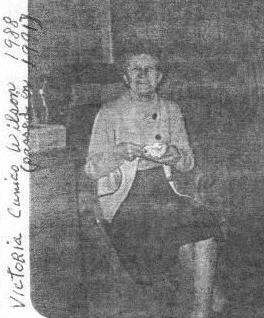 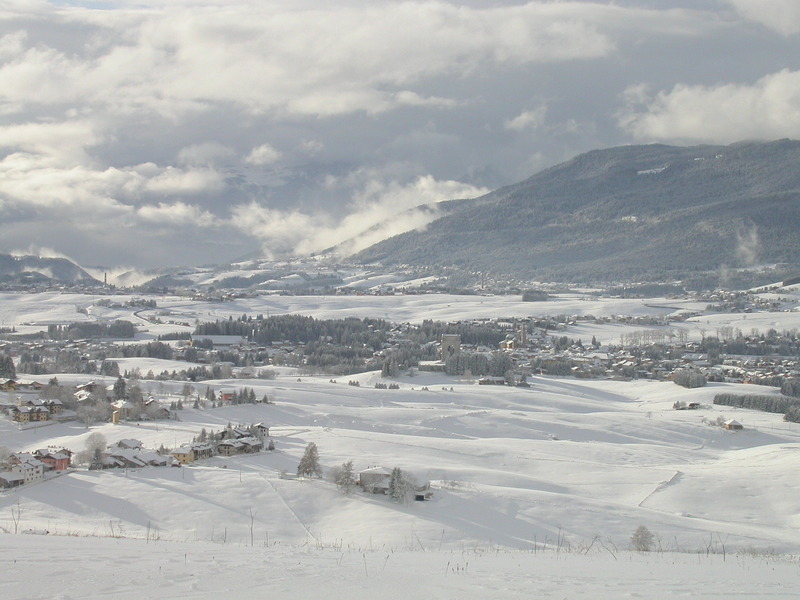 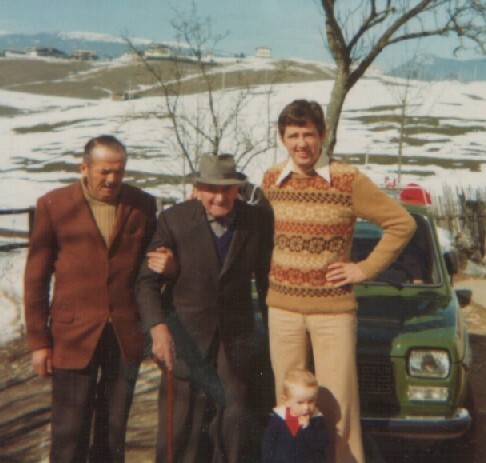 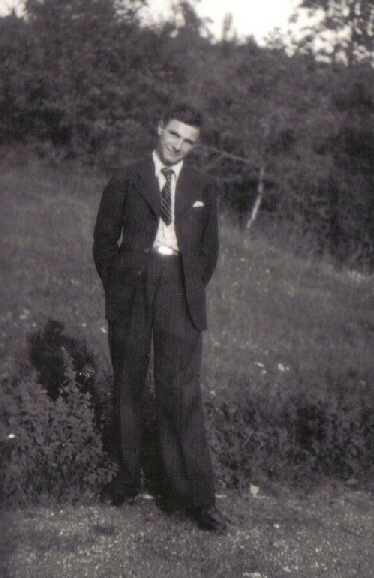 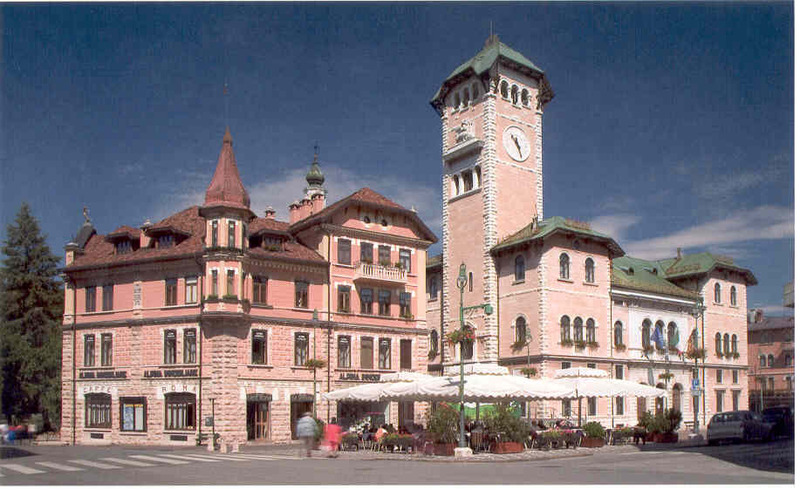 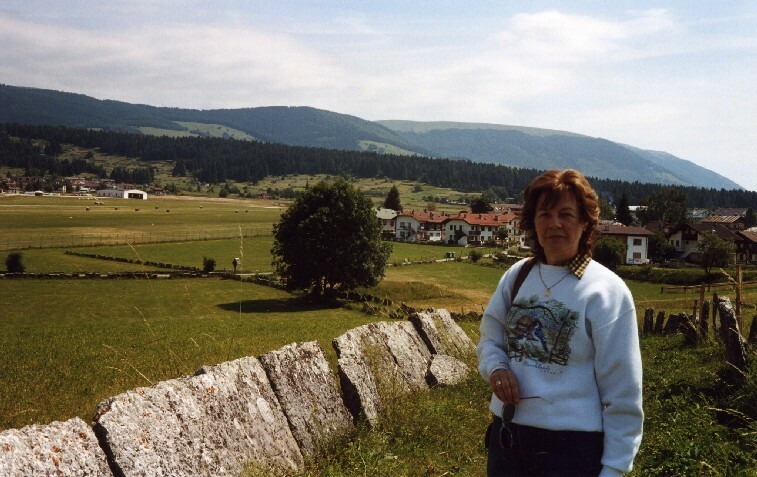 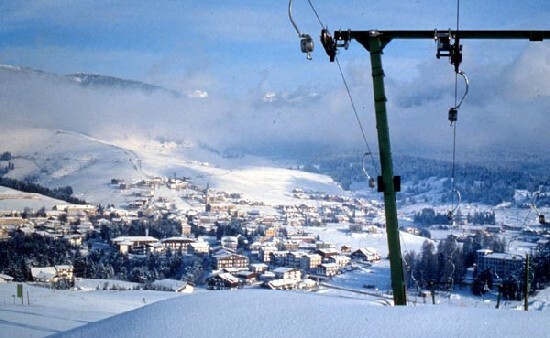 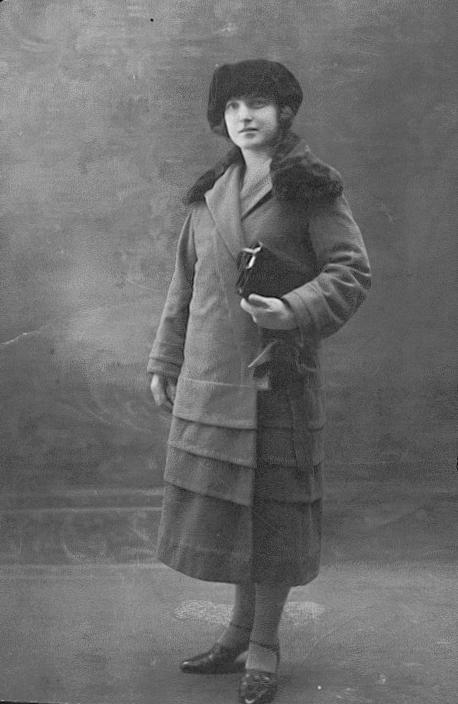 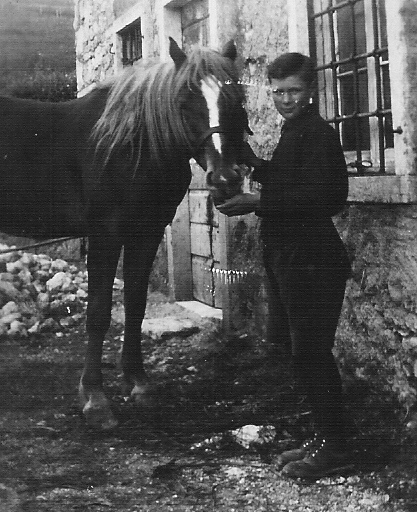 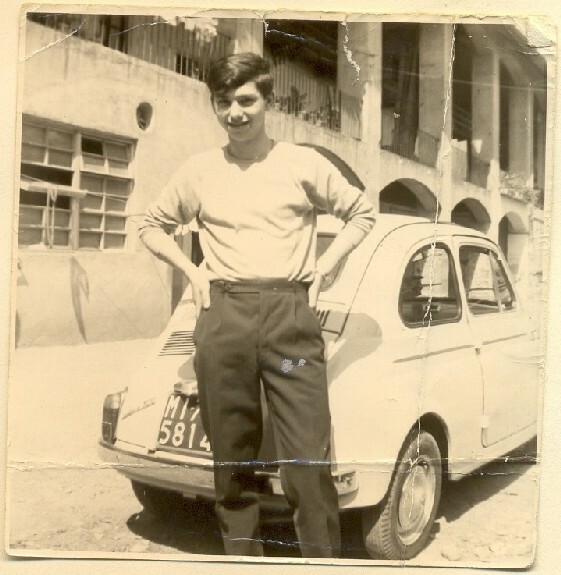 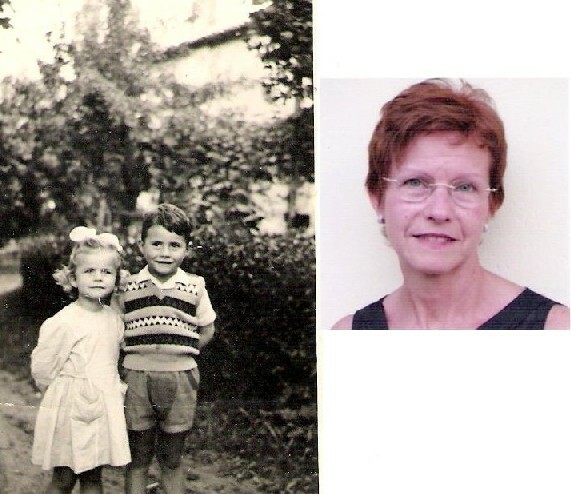 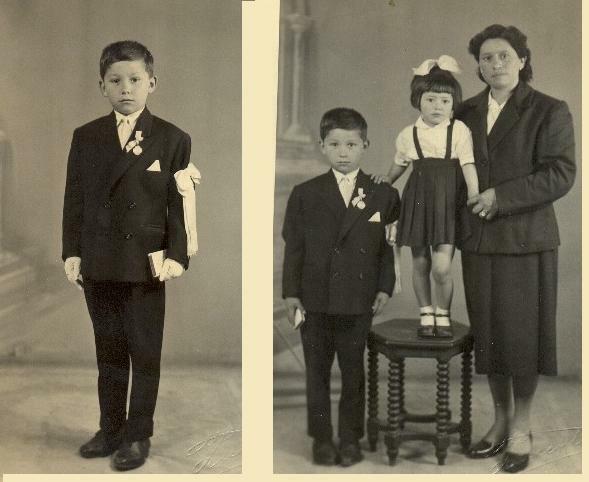 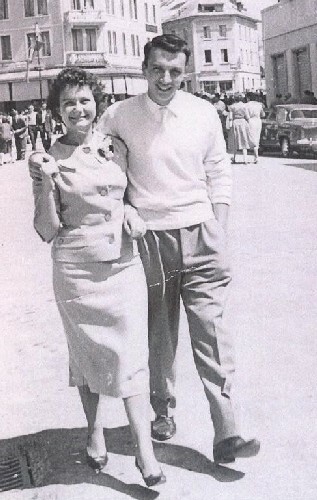 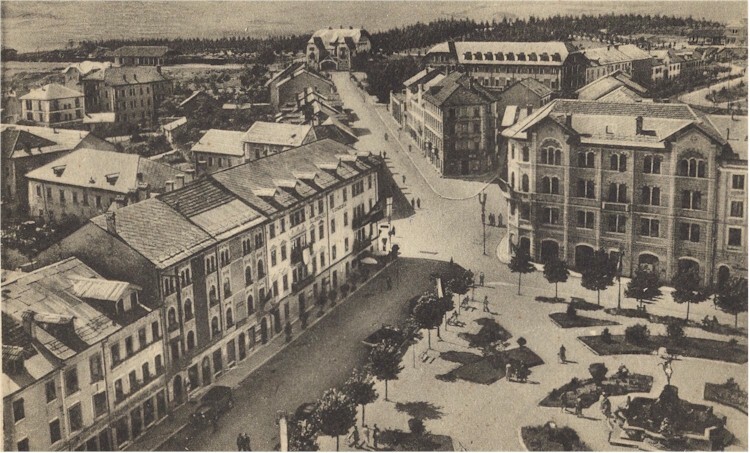 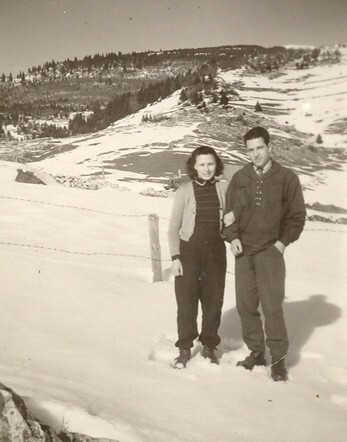 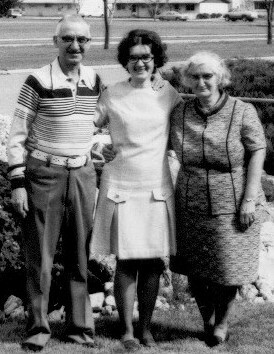 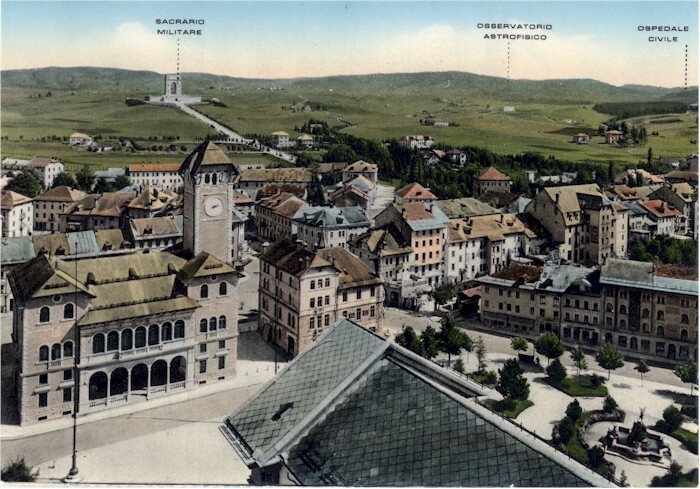 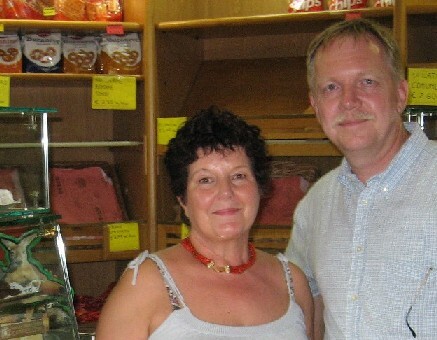 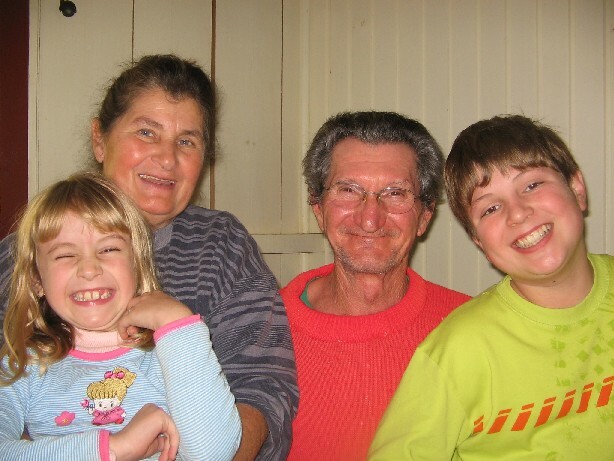 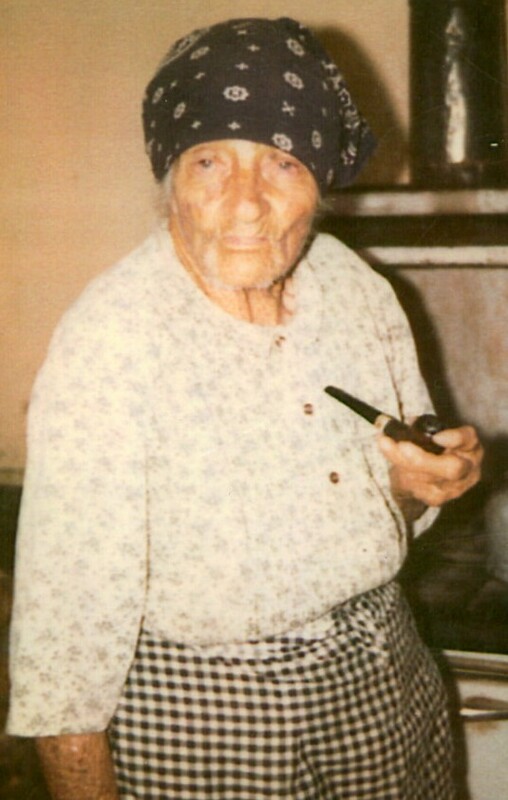 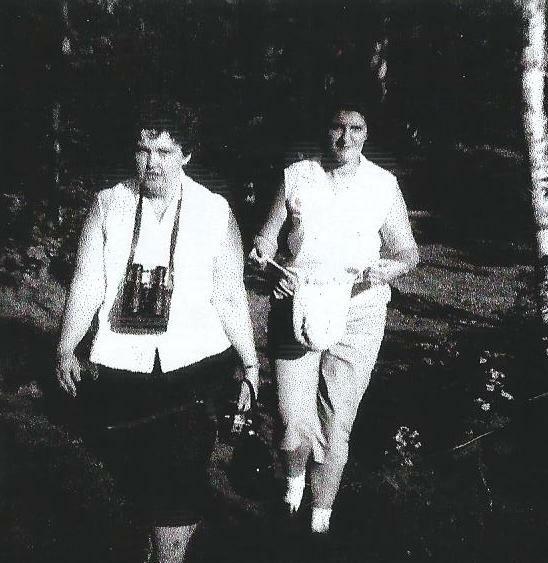 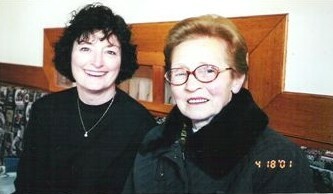 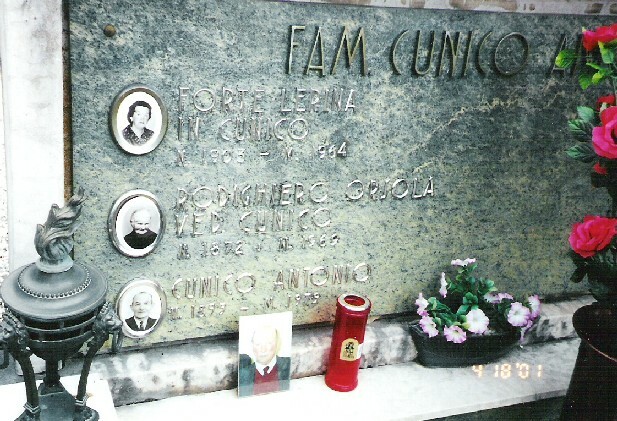 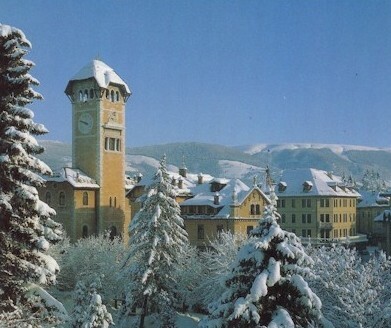 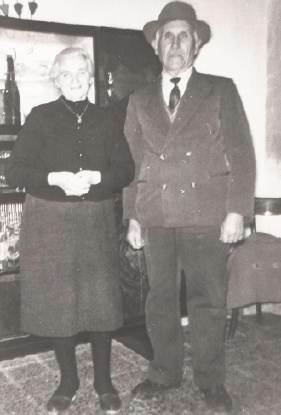 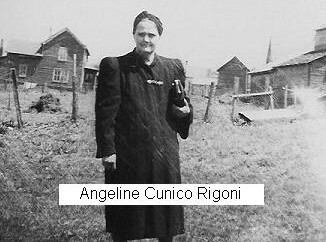 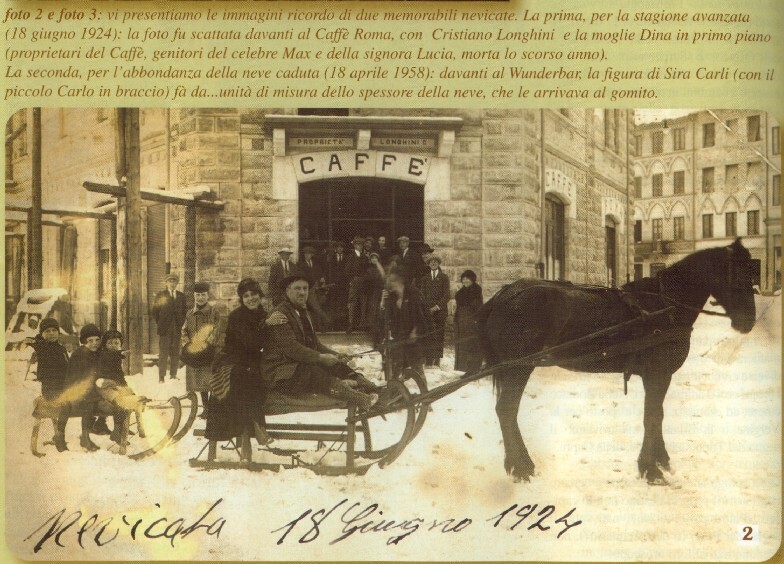 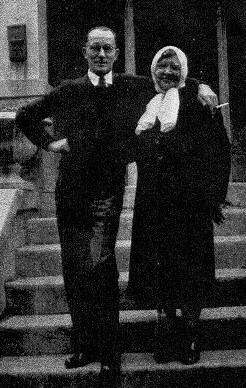 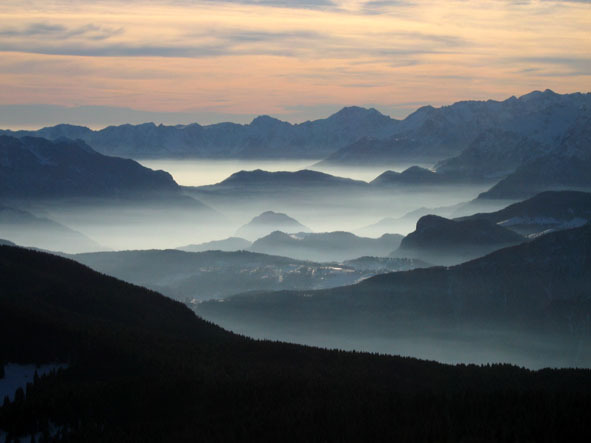 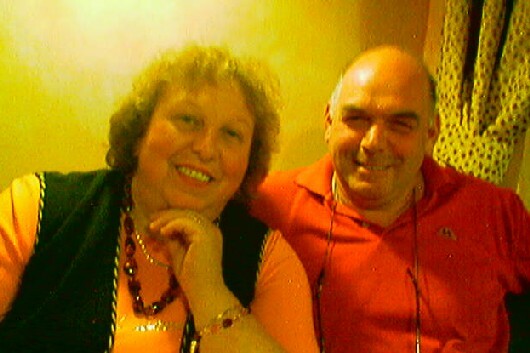 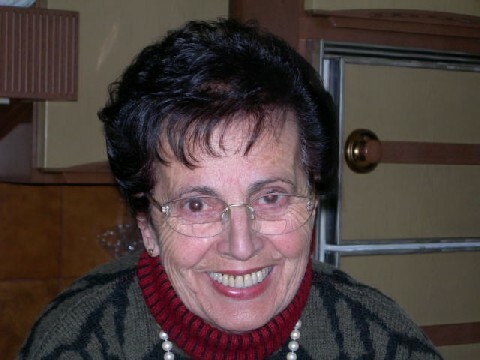 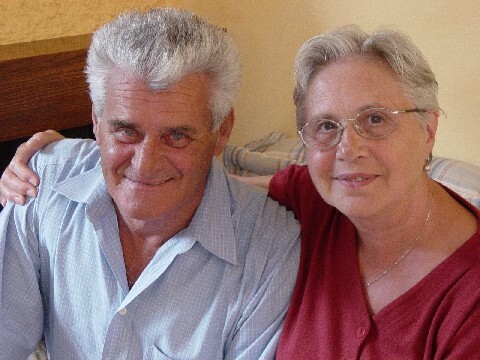 Louise14 - In 1968, Attilio & Luigia, along with Fortunata (Florence's mother) went to Asiago to see his mother. 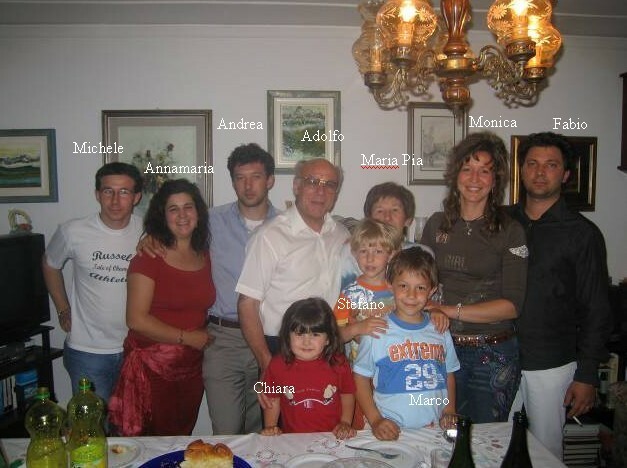 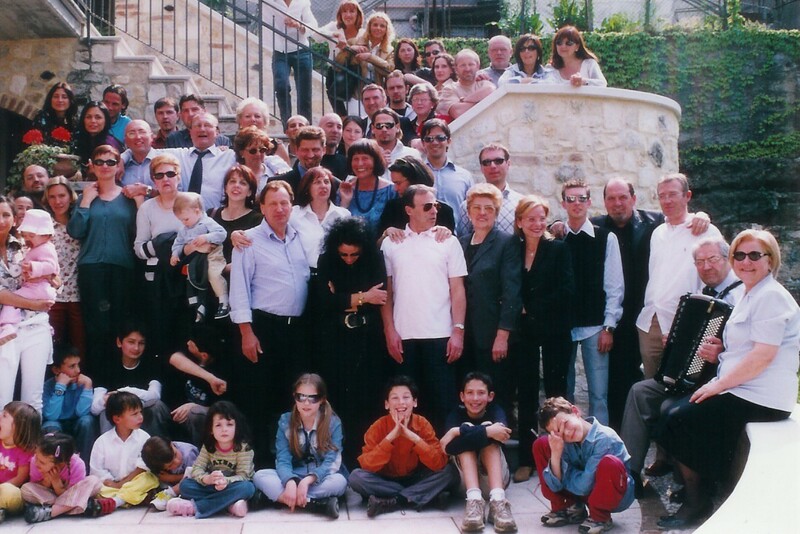 In this picture, Antonio is kneeling in the first row, next to Attilio, and then there is Nadia. 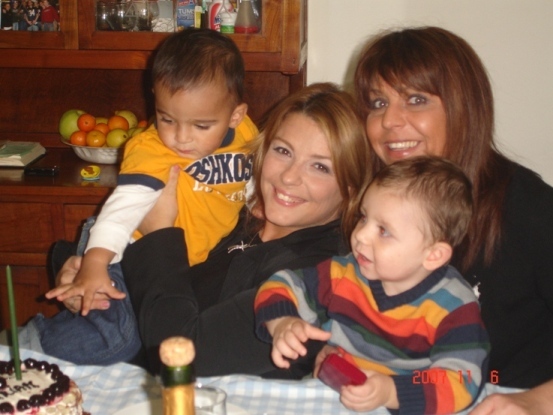 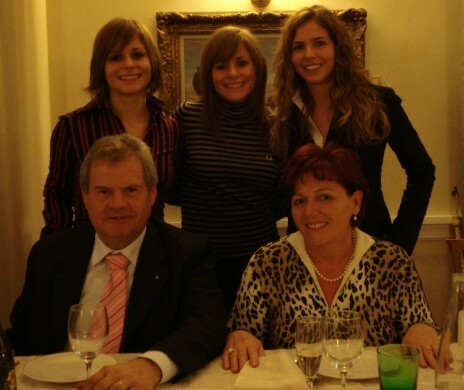 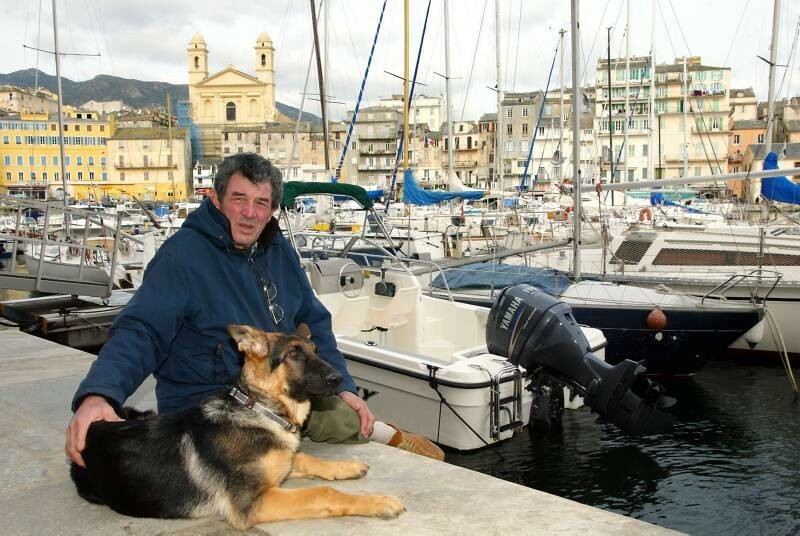 With Nadia is Maurizio and their two children. 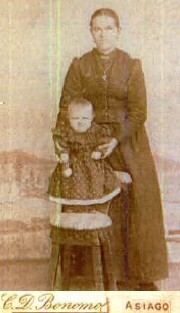 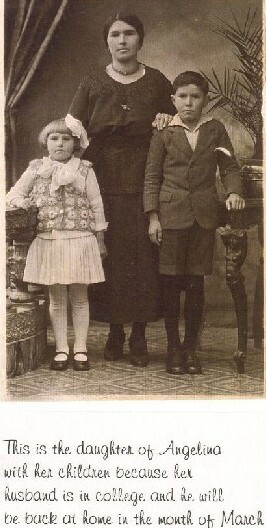 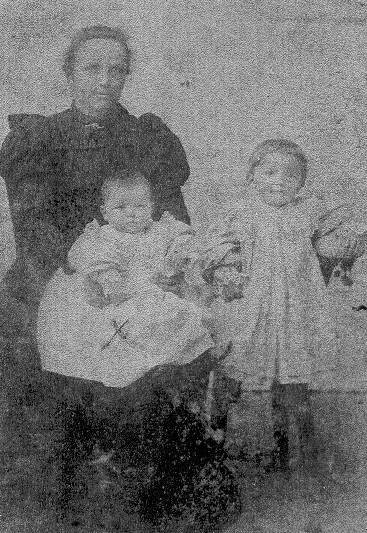 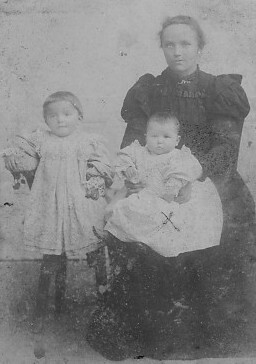 Behind her little boy is Fortunata and behind her is Ada (from Milan) Behind Attilio is Emilia (Beatrice). 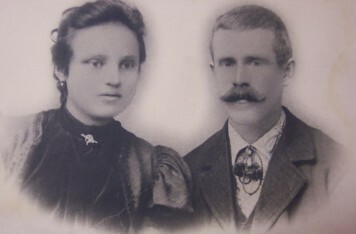 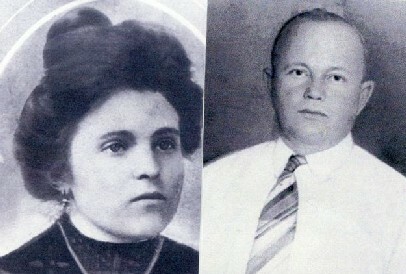 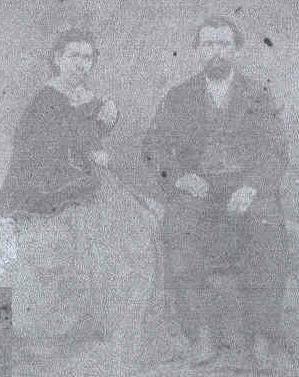 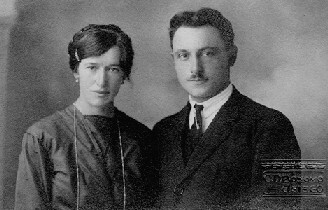 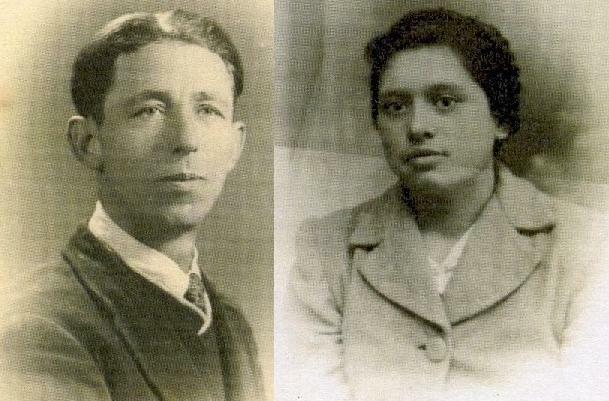 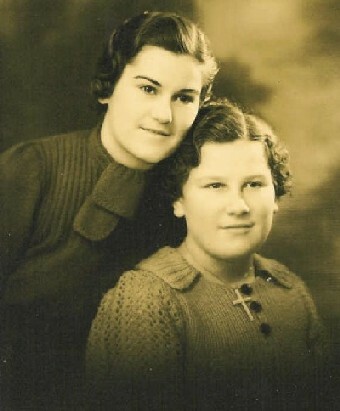 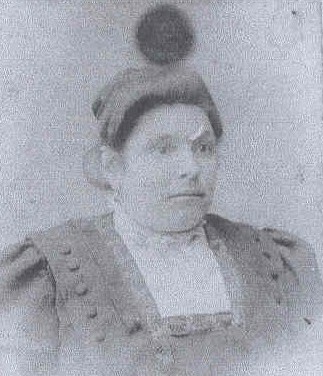 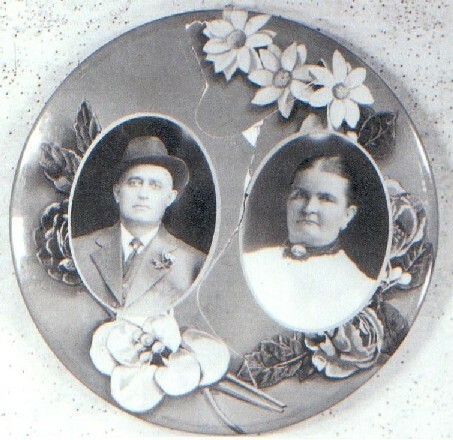 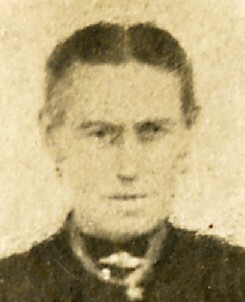 Behind and to the right of Luigia is her brother Vittorio, who married Emilia. 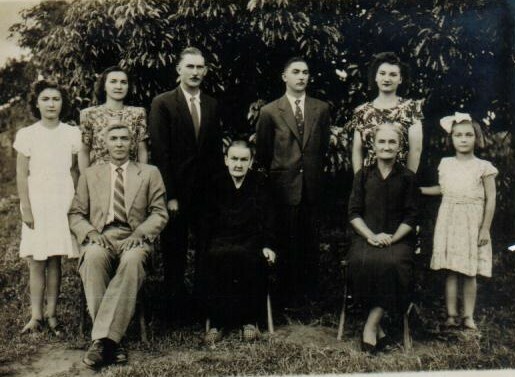 I'm thinking the man directly behind Ada is her husband, and I have no idea who the last couple is. 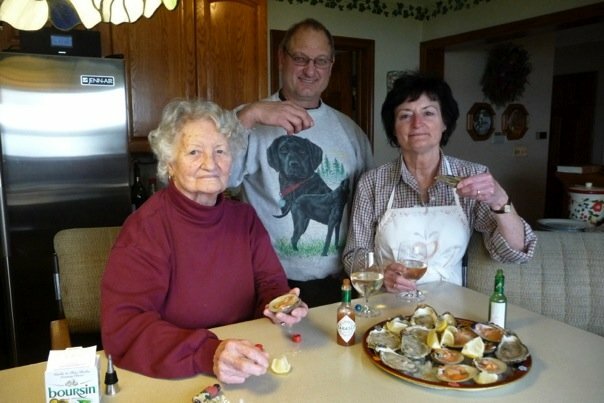 Brian-Schwaegler1 - Louise Schwaegler comments, You can call this photo "Thanksgiving oysters and clams - an annual tradition at our house". 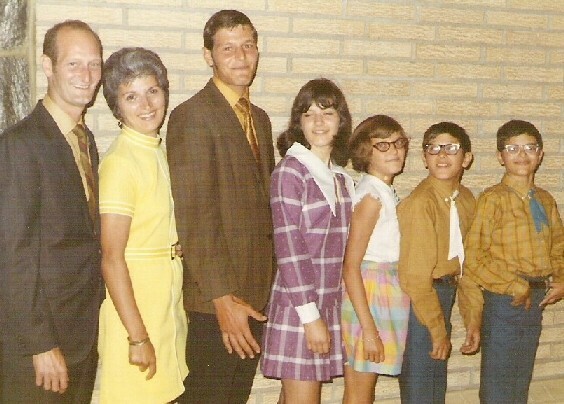 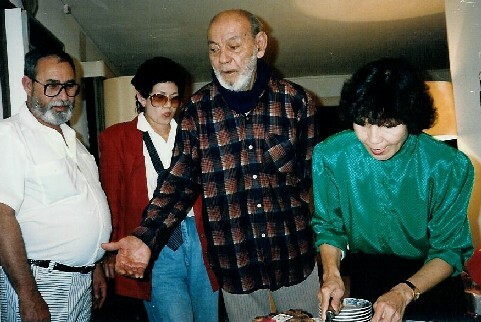 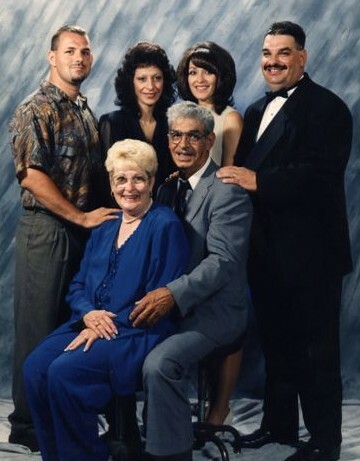 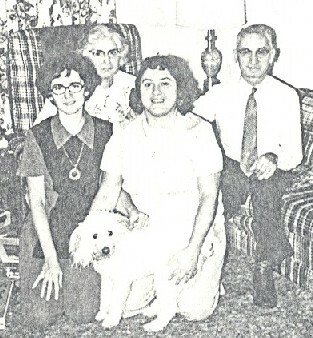 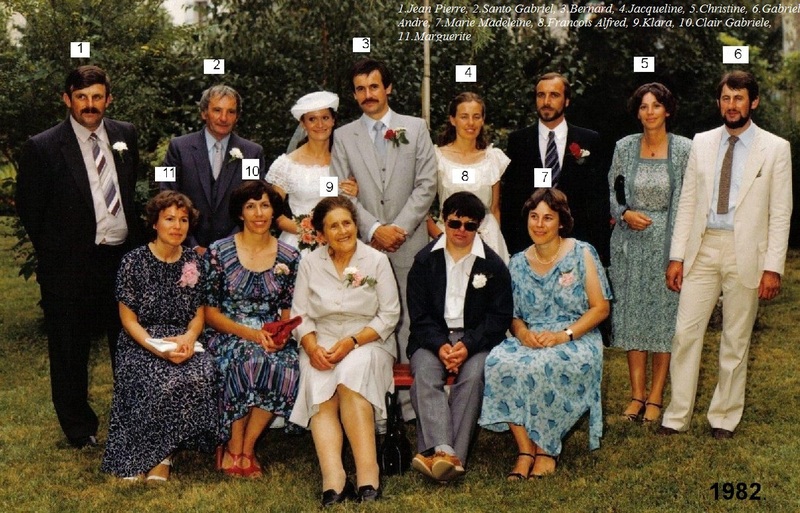 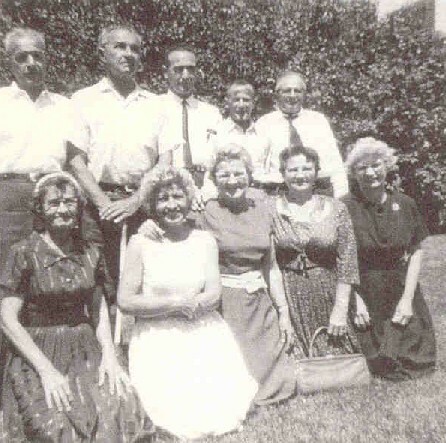 Ottilio1 - Ottilio and his family at Attilio's 50th wedding anniversary, in 1970. 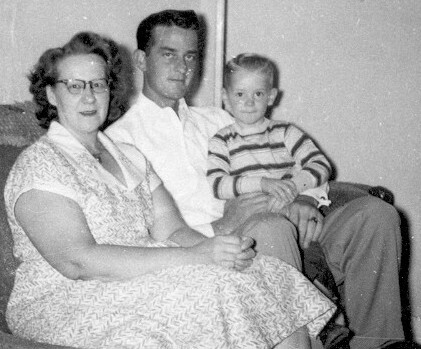 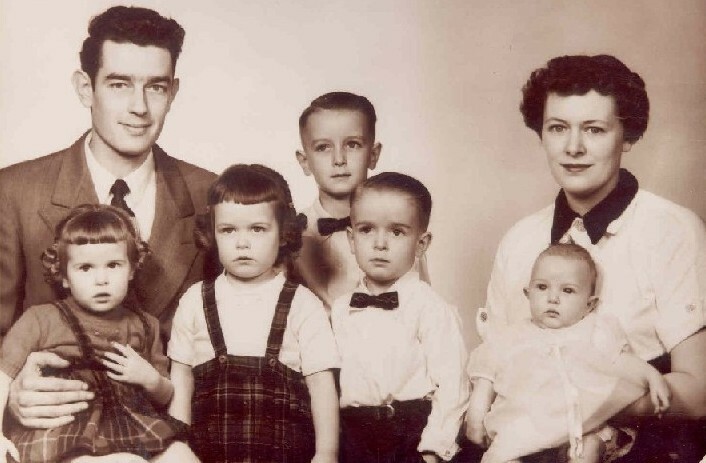 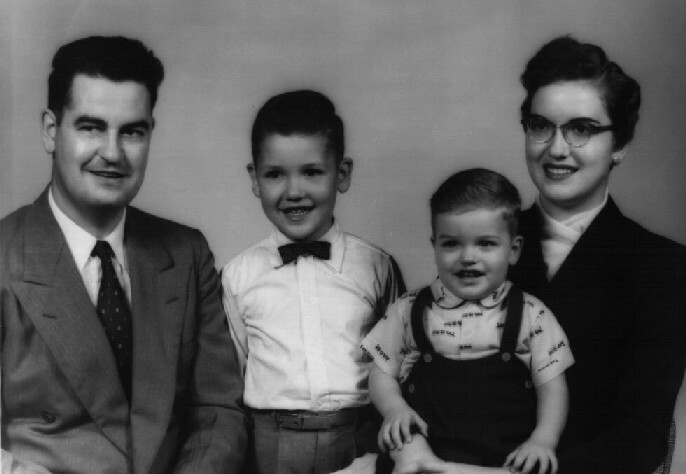 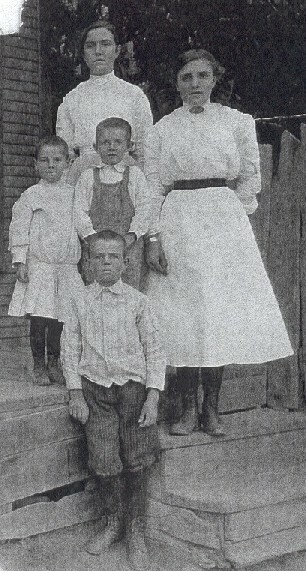 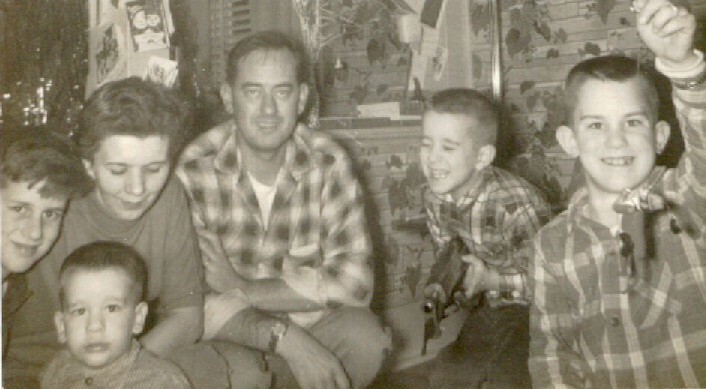 His wife, Mary Jane, and children, David, Barbara, Janine, Timothy, Richard. 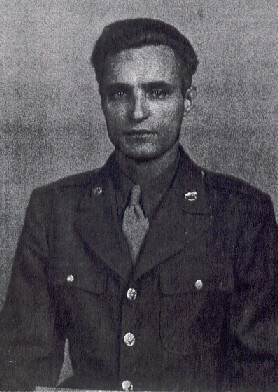 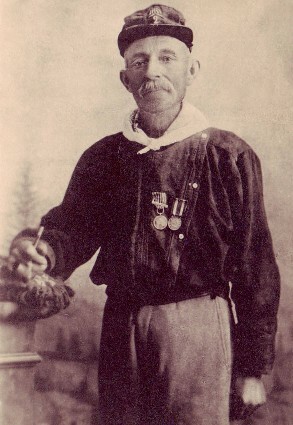 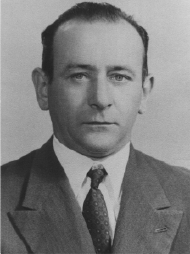 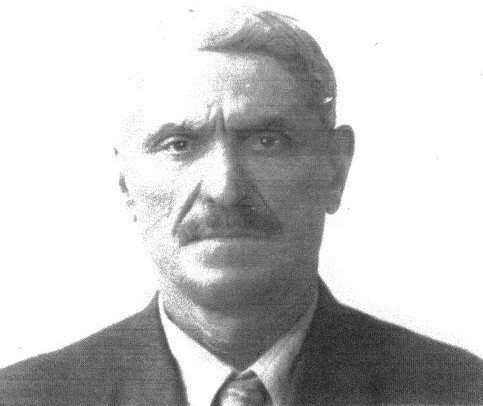 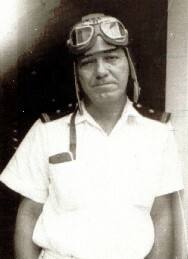 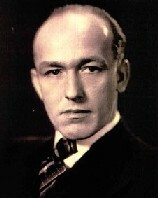 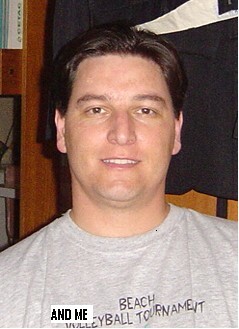 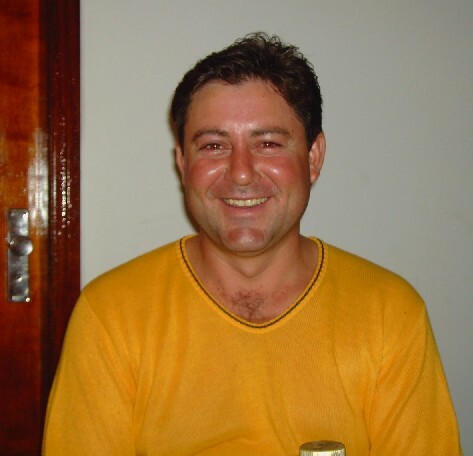 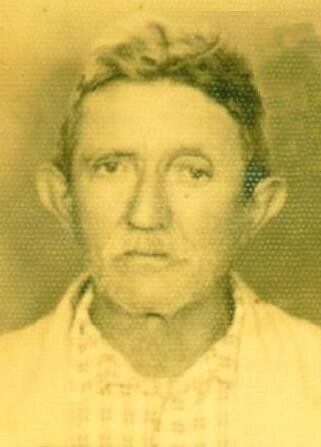 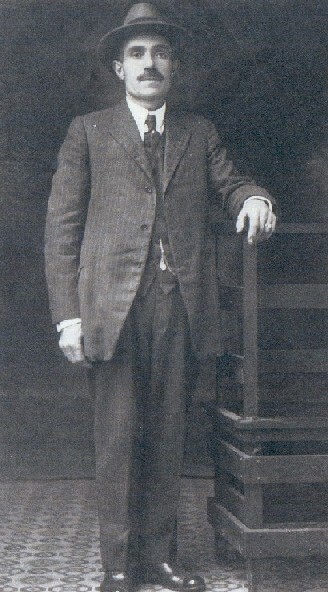 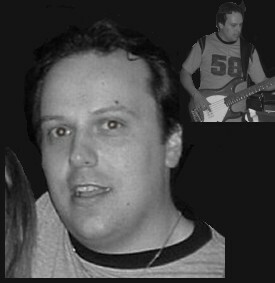 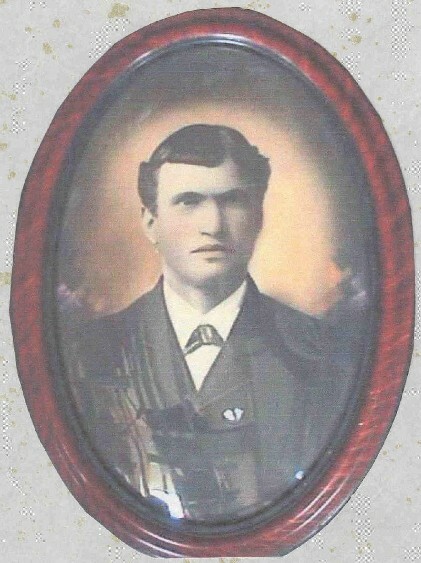 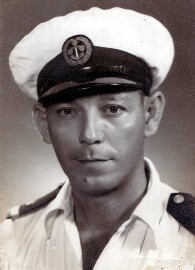 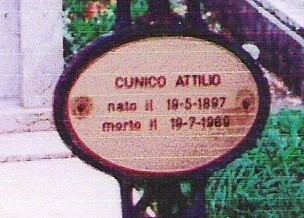 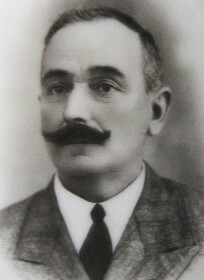 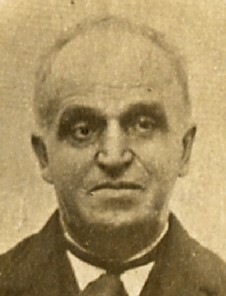 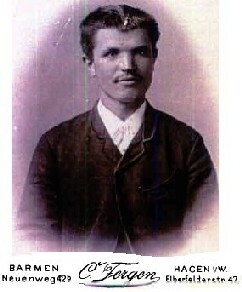 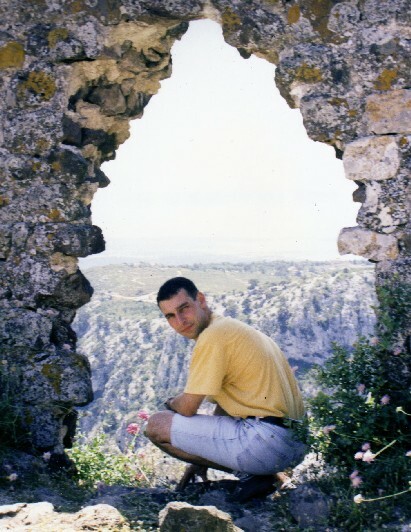 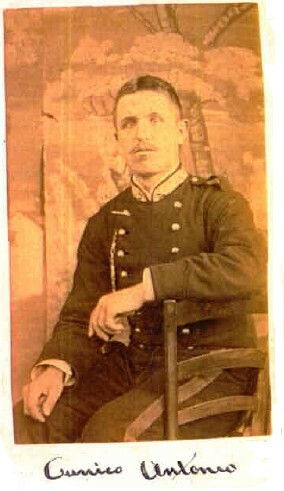 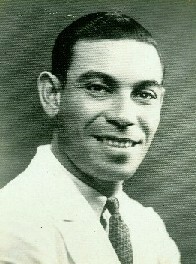 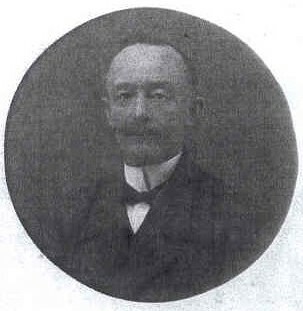 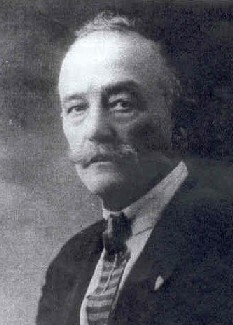 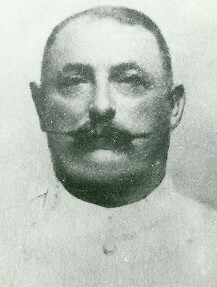 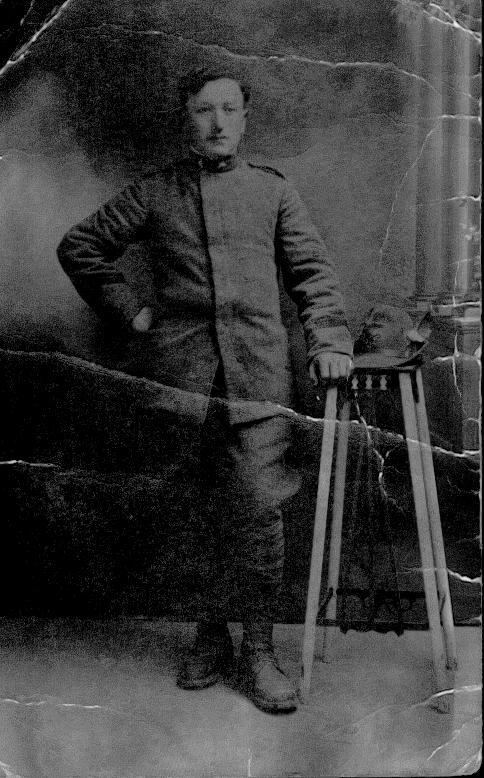 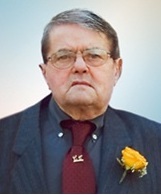 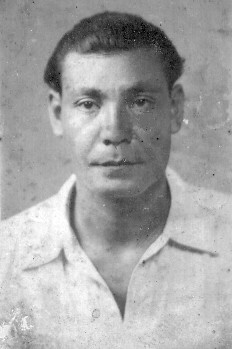 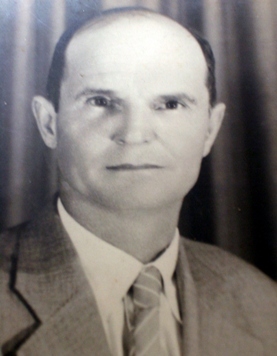 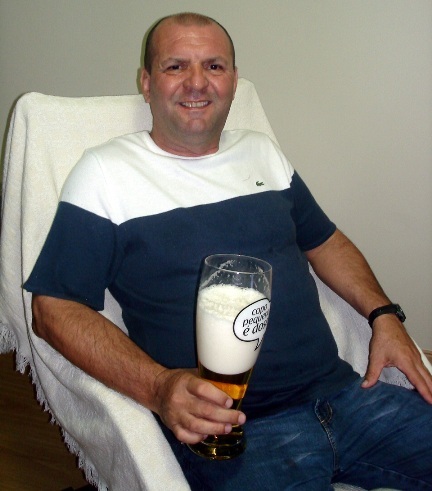 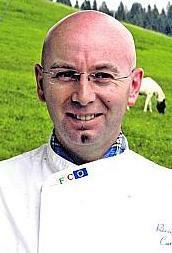 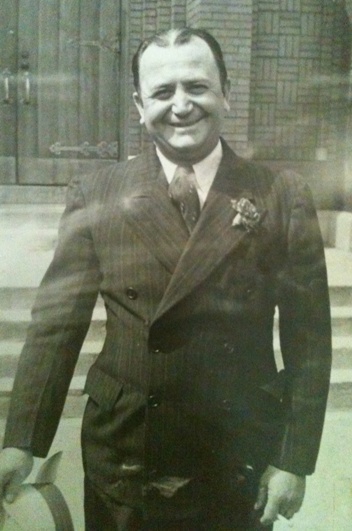 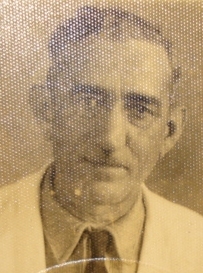 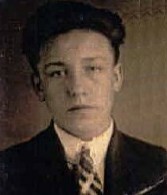 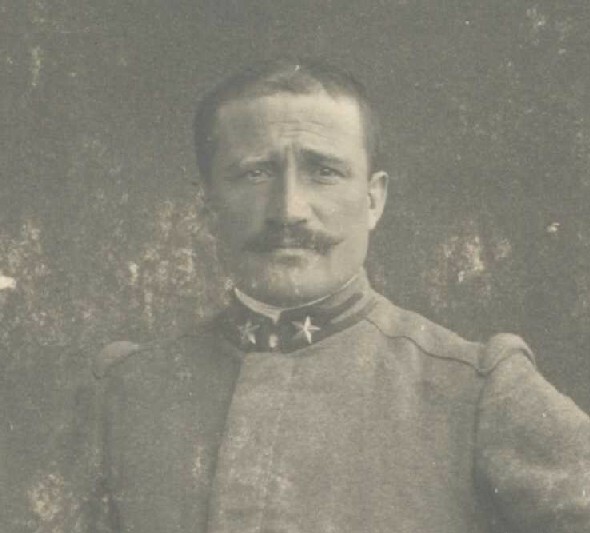 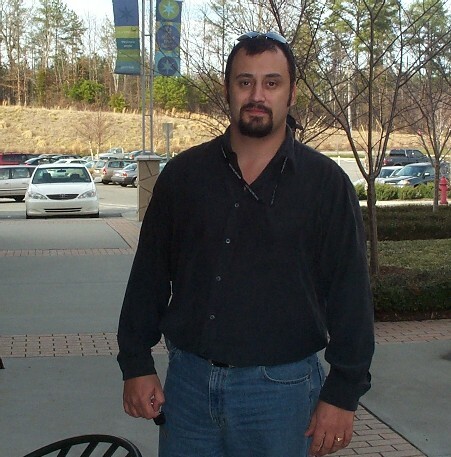 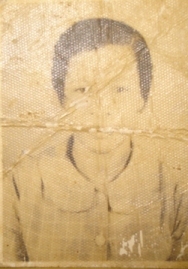 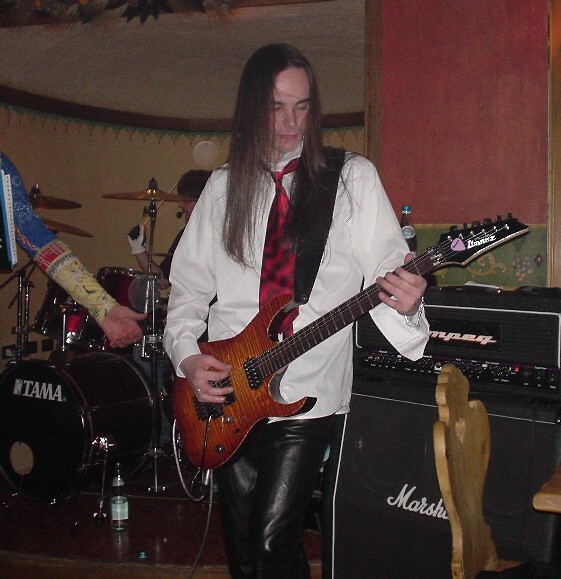 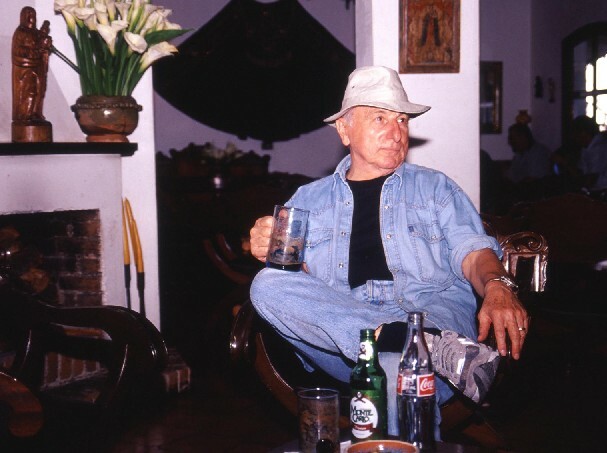 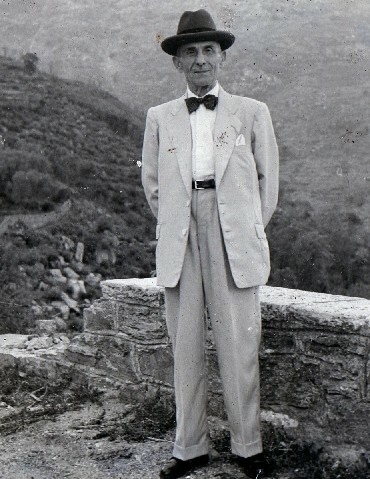 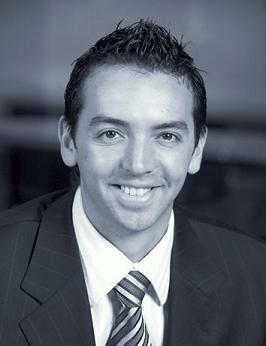 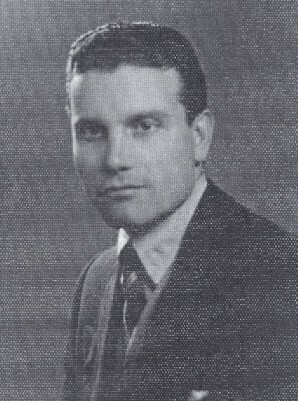 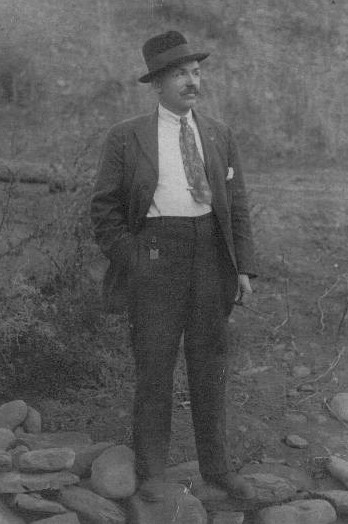 Adrino1 - This picture is of Adrino Cunico. 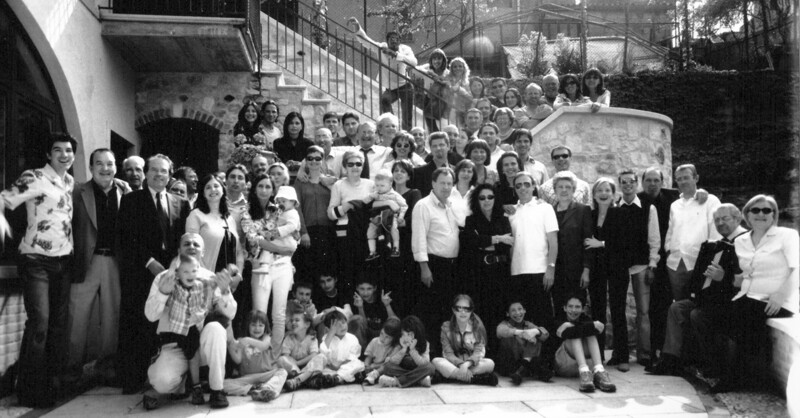 Adrino2 is the back of this picture. 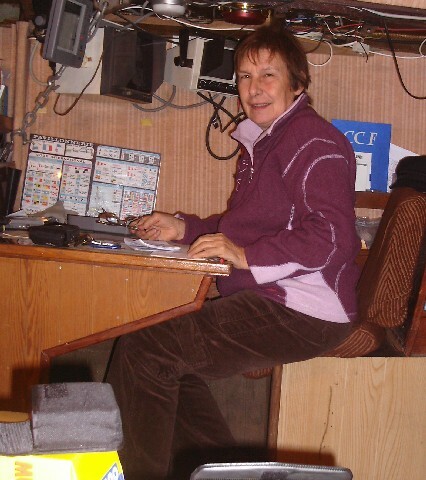 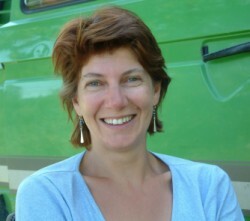 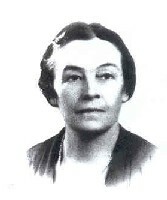 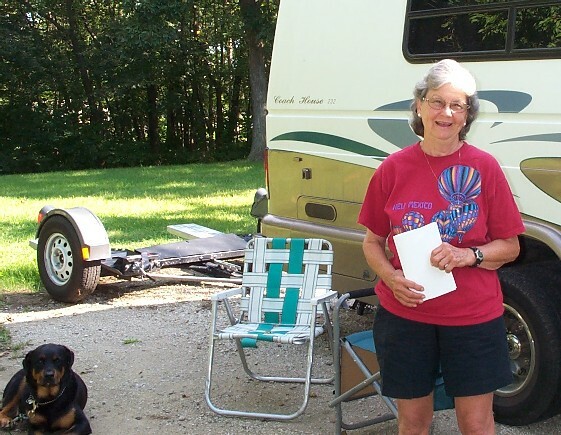 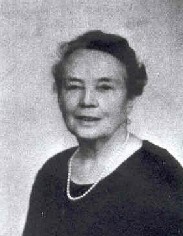 Both were supplied by Louise Schwaegler of the MICHIEL1 Branch. 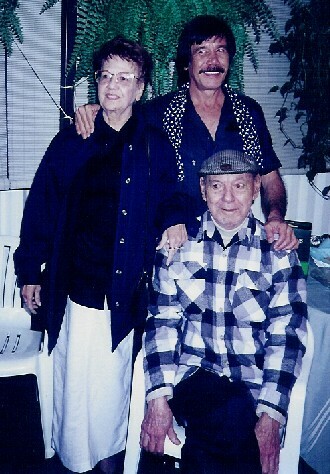 Tiffany5- Tiffany, Ottilio and ?? 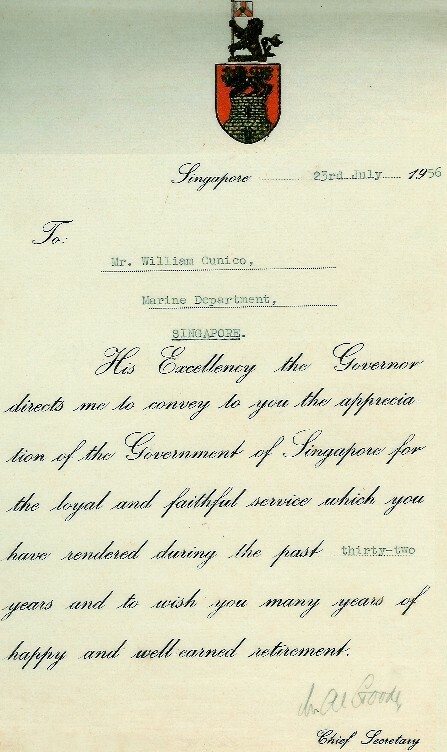 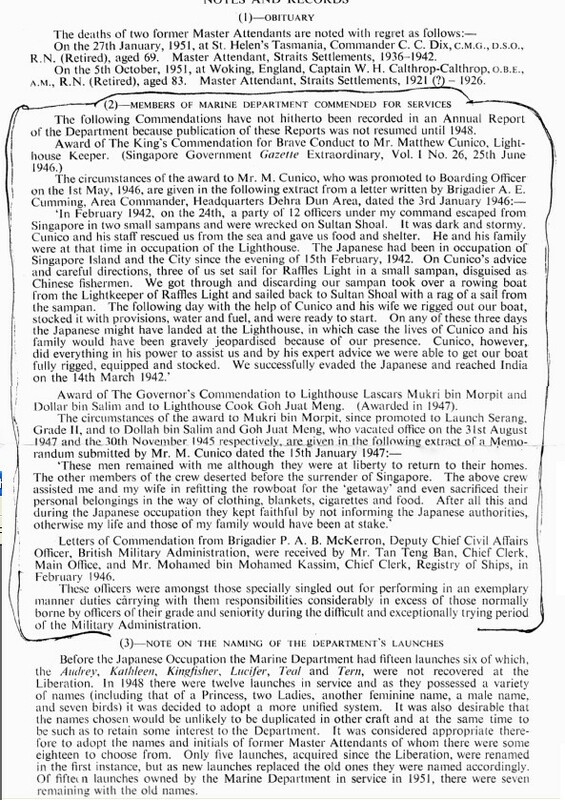 All photos below were furnished by Benito (Benjamin or Ben) Cunico - Singapore. 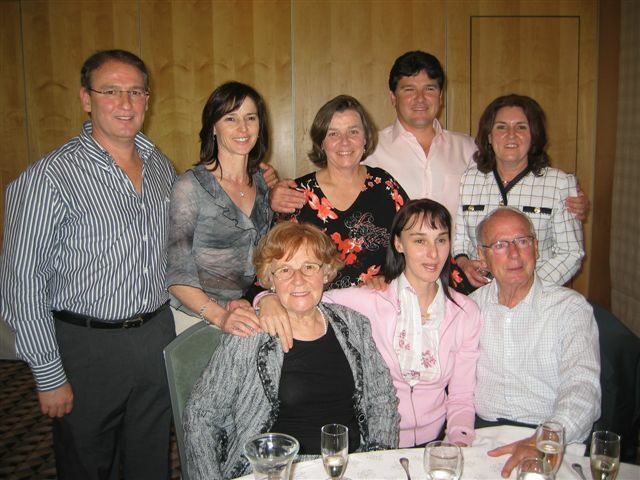 All photos below were furnished by Vian Cunico - Australia. 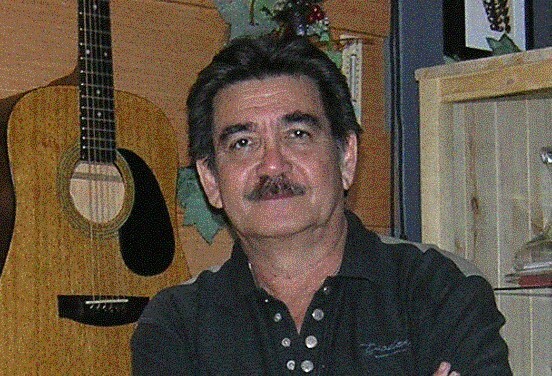 All photos below were furnished by Lou (Nash) Cunico - Singapore. 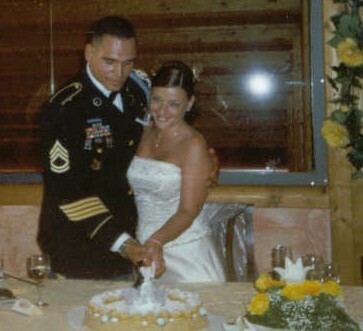 All photos below were furnished by Lisa A. Cunico - Singapore. 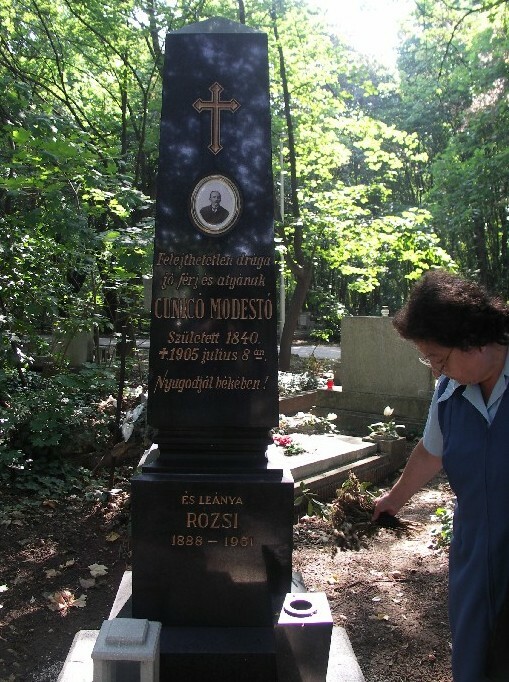 The following photos were furnished by Zsolt Szathmary - Budapest. 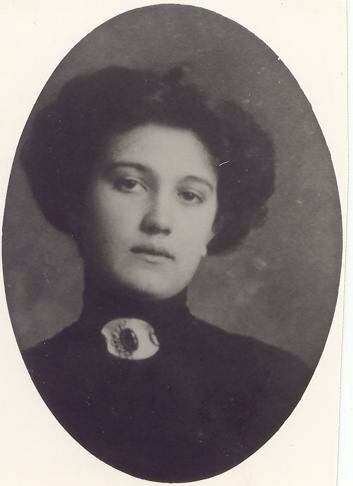 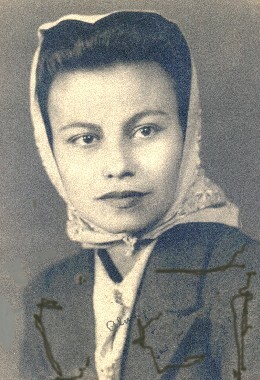 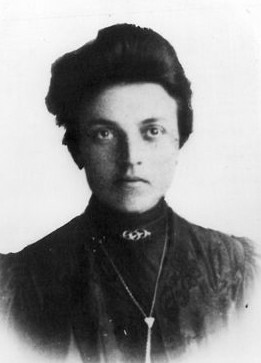 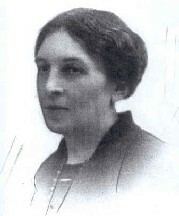 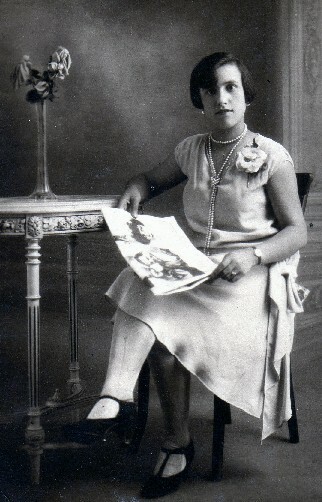 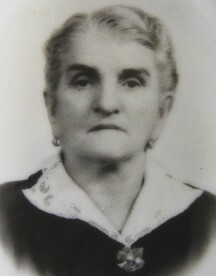 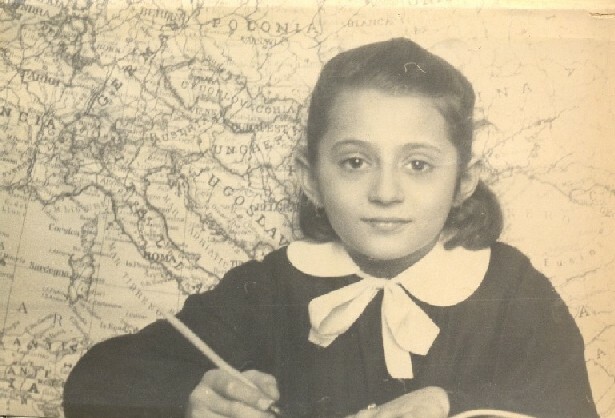 The following photos were furnished by Erika Lovas - Hungary (daughter of Erika Egervari, granddaughter of Erzsebet Cunico. 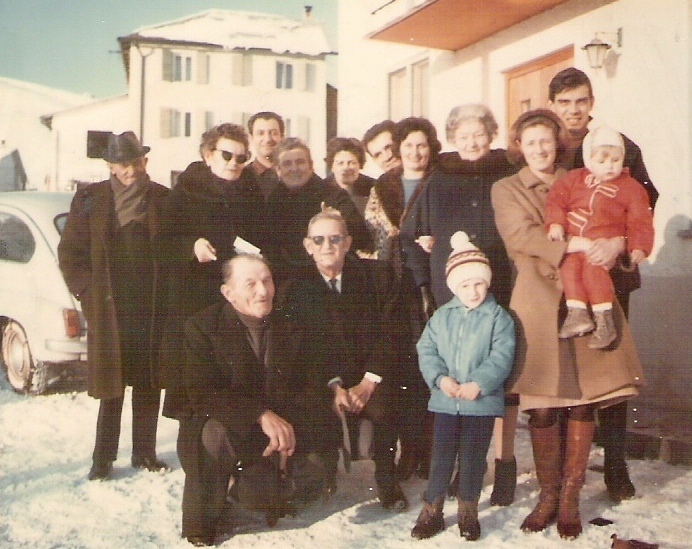 Antonella2 - Antonio Bortolo Cunico, who is sitting; on the right, standing, my aunt Elsa,; on the left, standing my father Arciso, four years old; then my uncle Bruno, and uncle Davide. 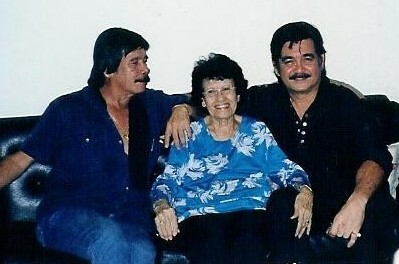 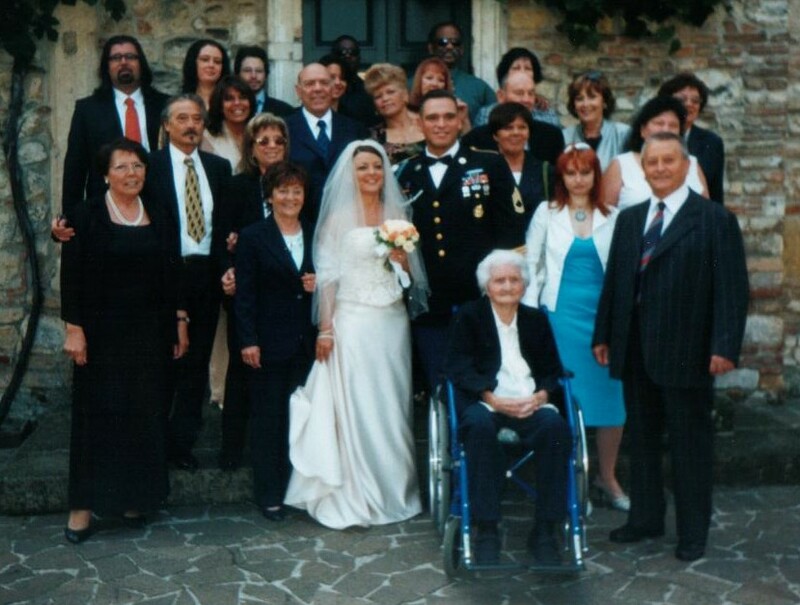 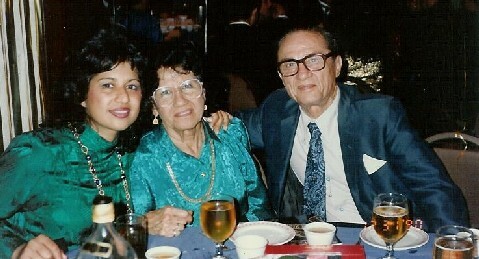 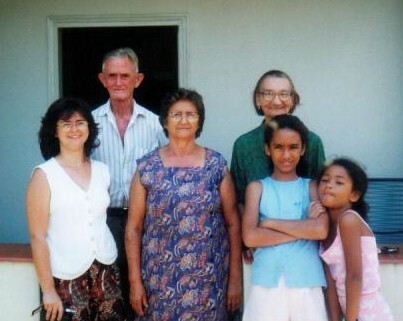 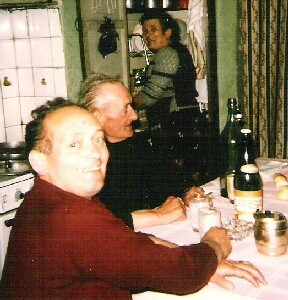 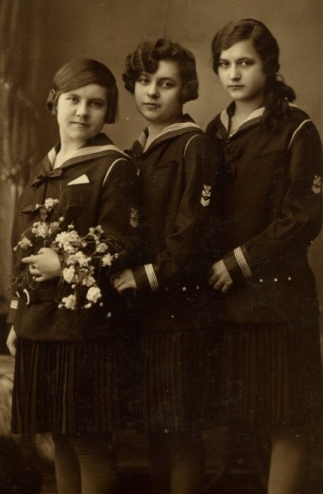 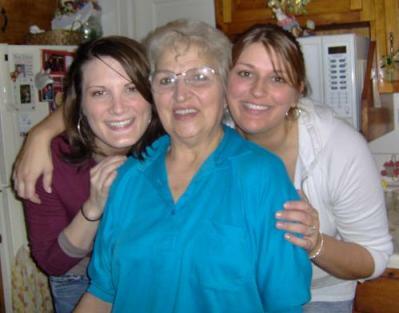 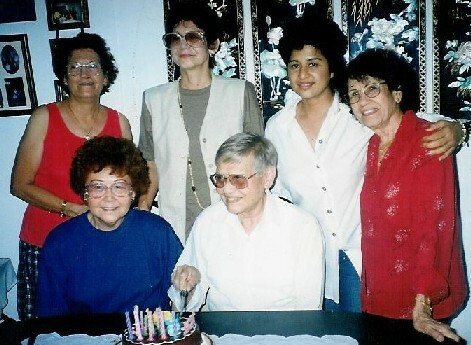 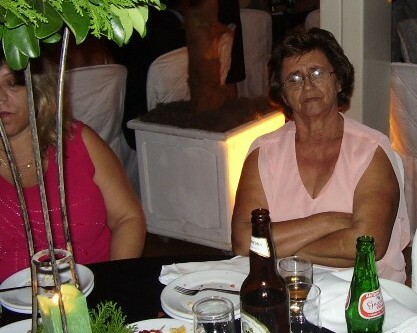 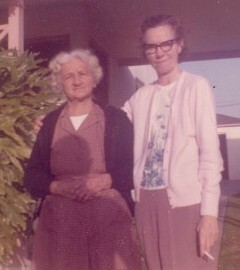 Last, on the left standing my grand mother Maria Bortoli. 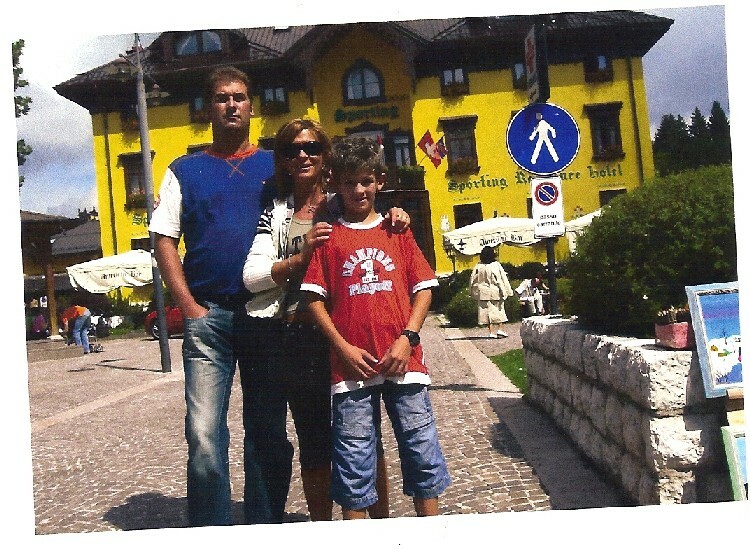 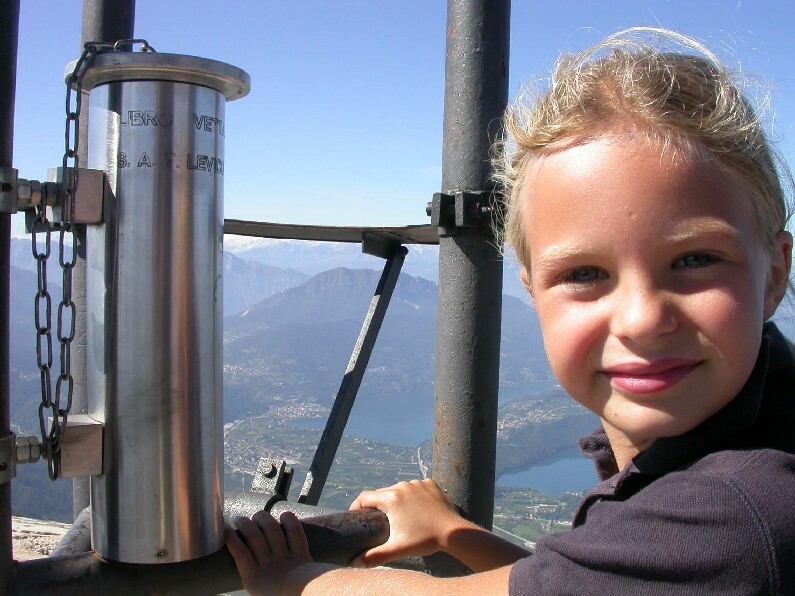 Andrea1 - Andrea's daughter Martina with Spitz Verle (mountain at north Altopiano di Asiago) in background. 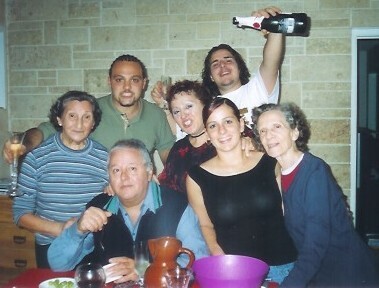 Lucrezia1 - Lucrezia's 80th B-day (standing) Antonio, Tiziana, Emilia,Davide, Giuliana, (sitting) Mom Lucrezia, Giovanna and Dad Angelo. 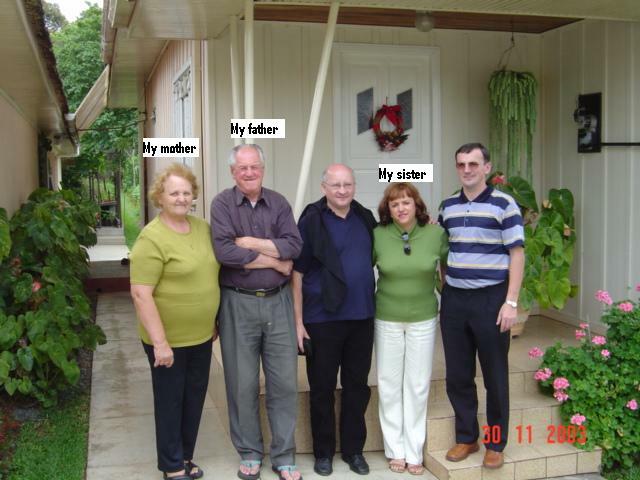 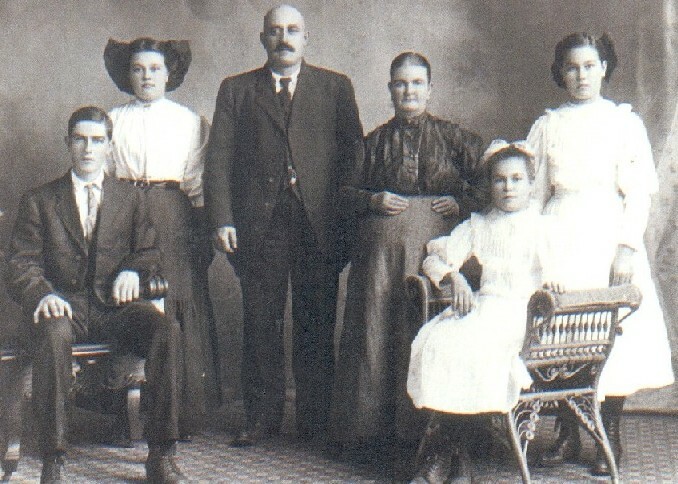 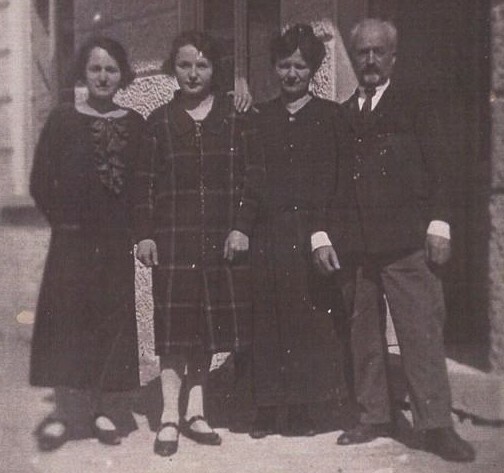 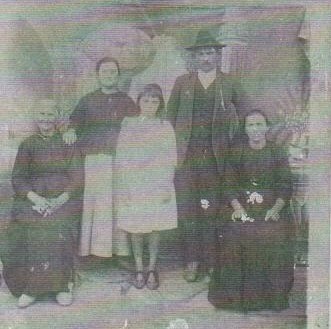 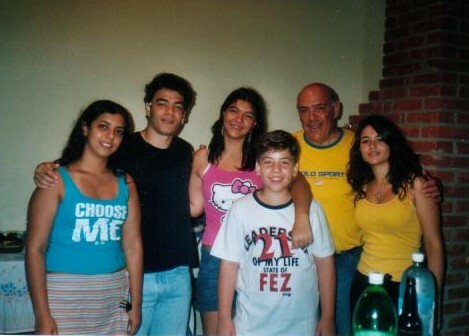 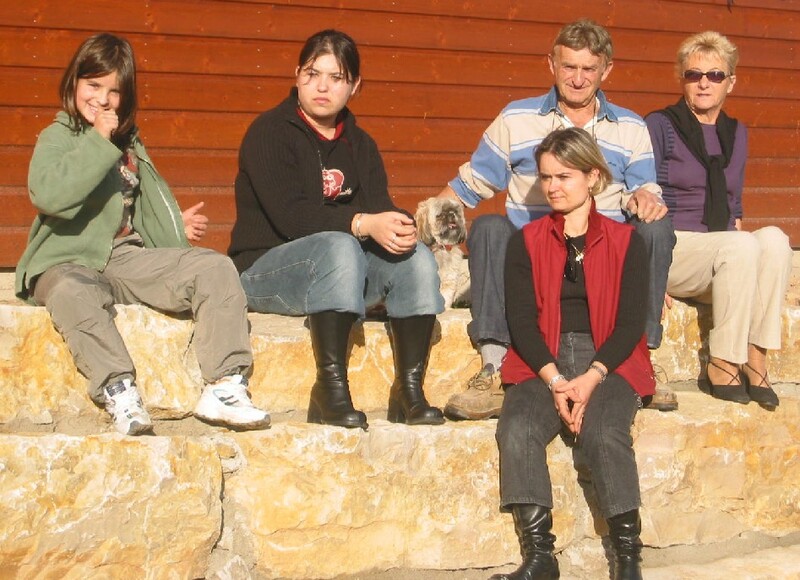 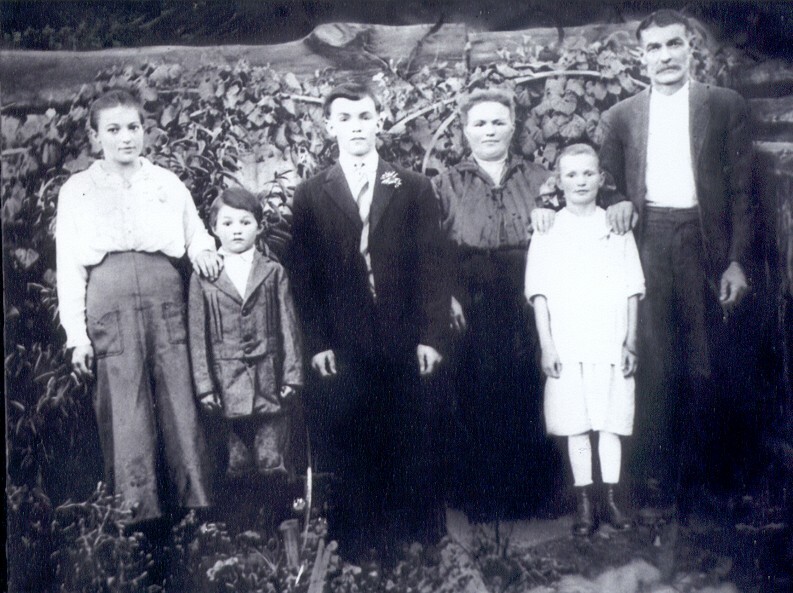 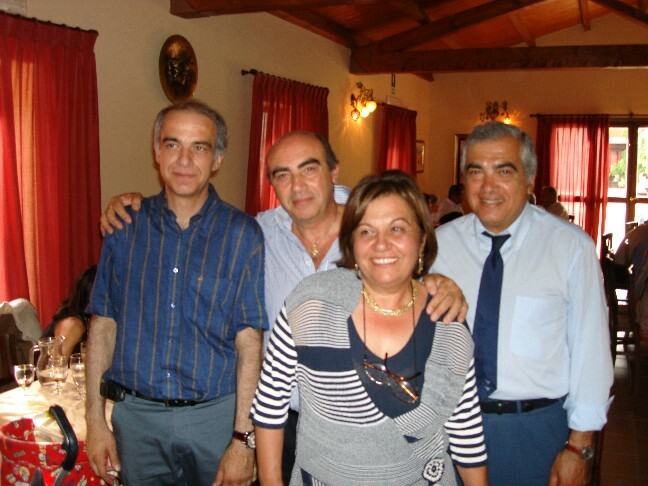 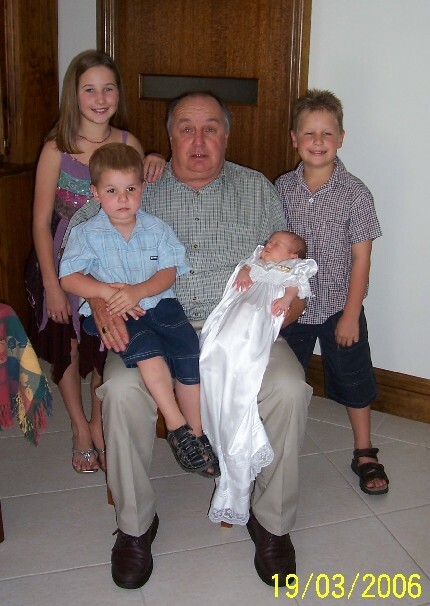 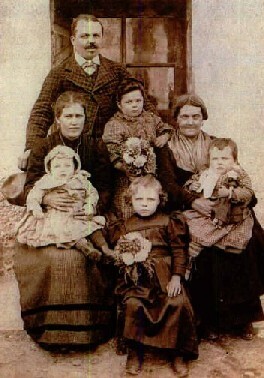 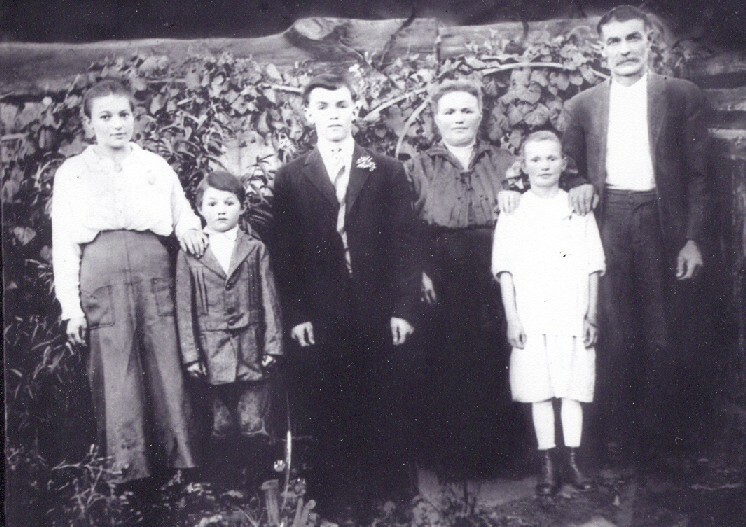 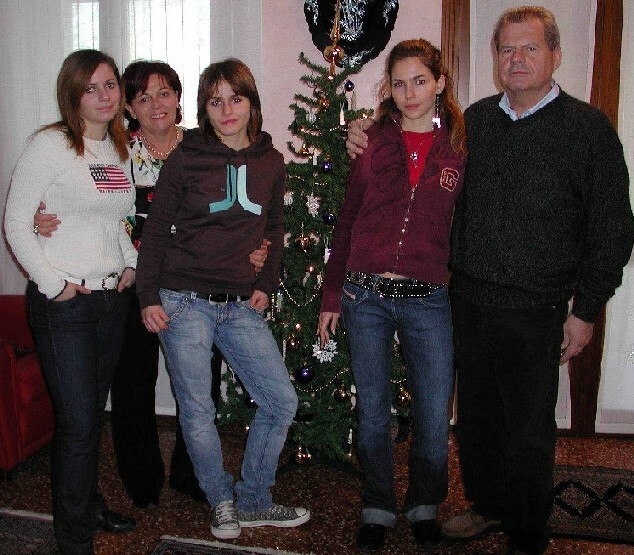 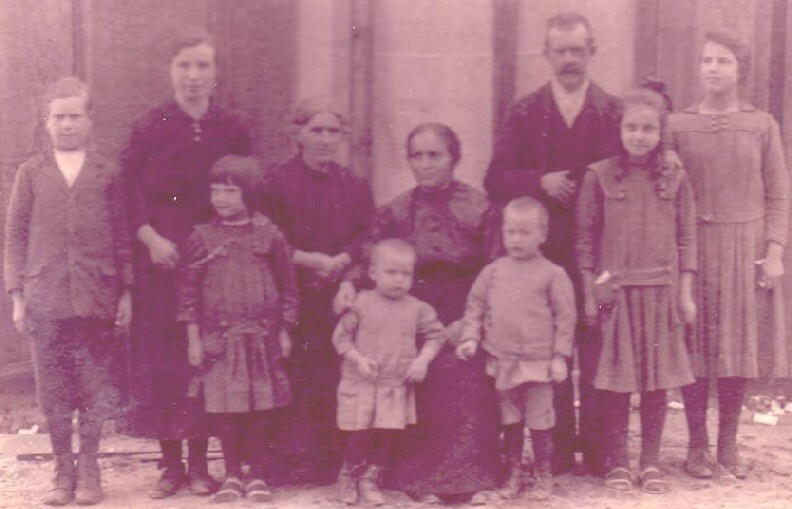 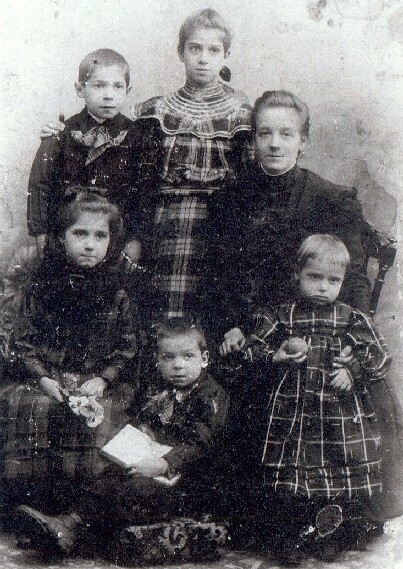 Carlos5 - Family of Albino Angelo Creato (back row l to r) Emilia, Sestiglia, Giuseppe, Dosolina, Giuseppina. 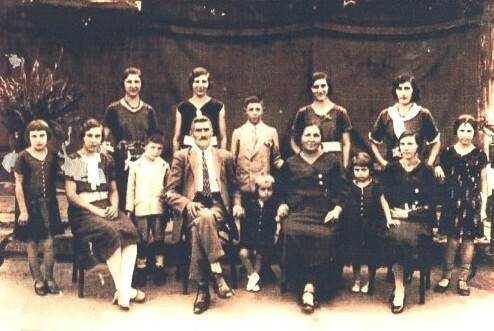 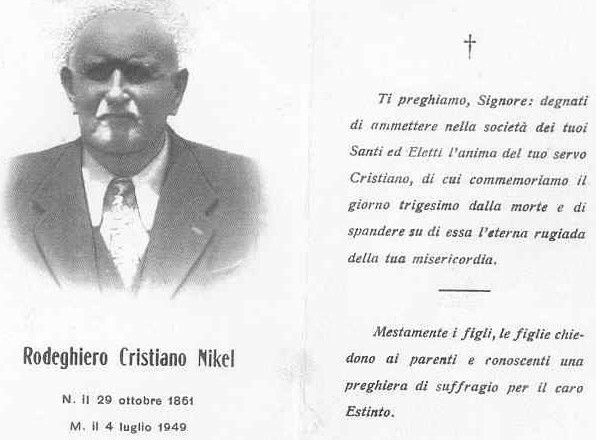 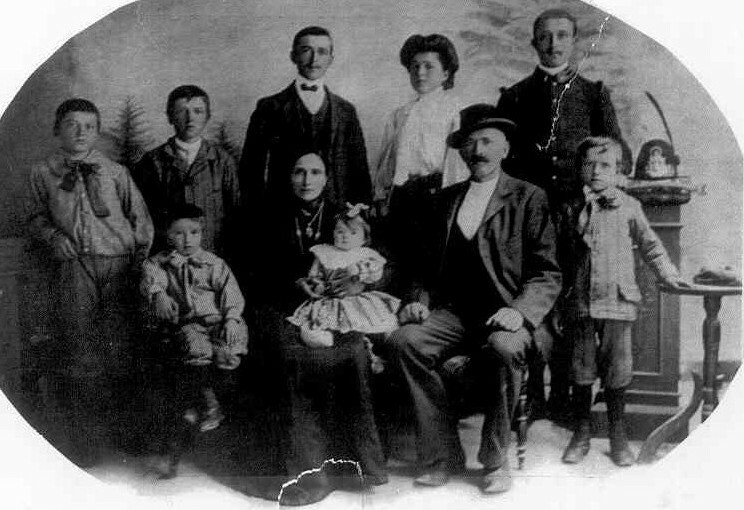 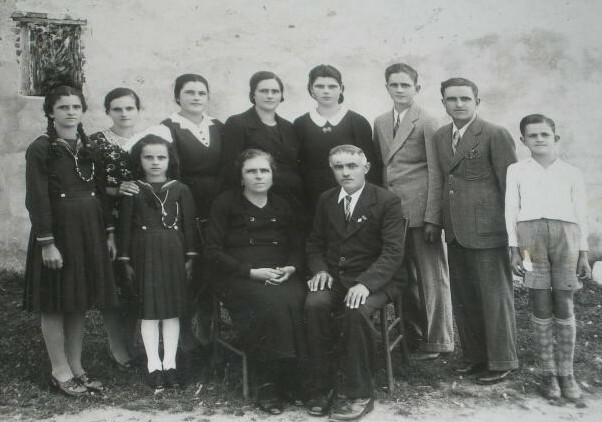 (front row l to r) Aparecida, Elena, Luigi, Albino Angelo Creato (Grandfather of Carlos), Francesco (Father of Carlos), Antonia Cunico (Grandmother of Carlos), Lourdes, Maria & Teresa. 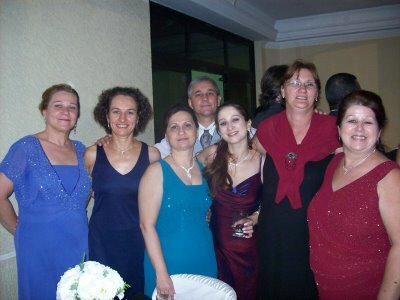 Angelo14 - Valeria Cunico, Mario Bossolan, Teresighna Cunico, Ianaina, Lilian Arruda & ?? 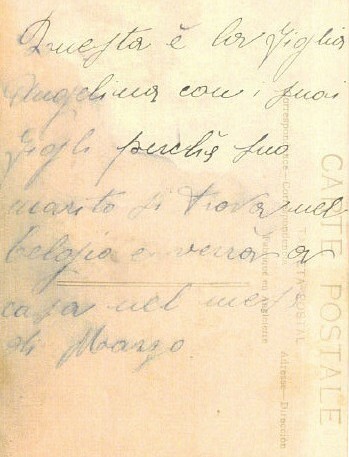 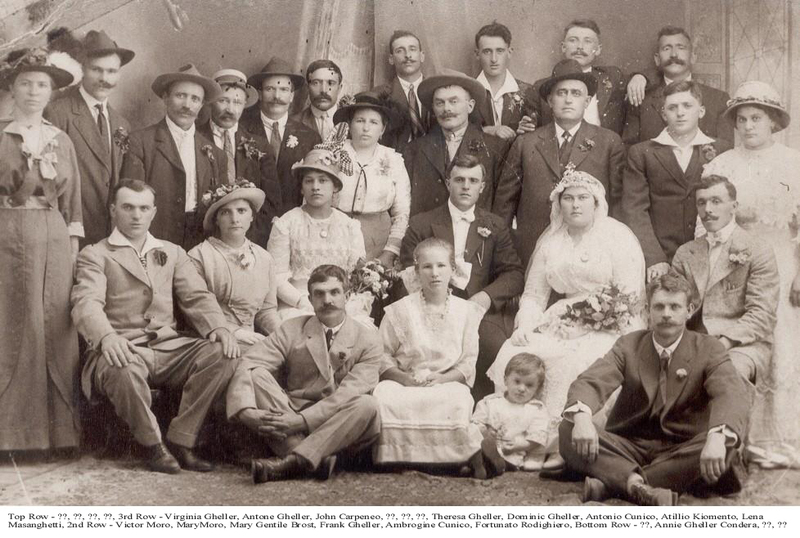 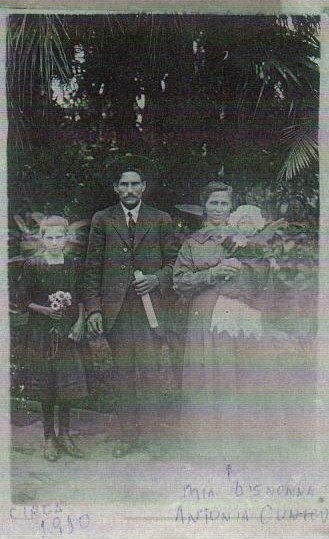 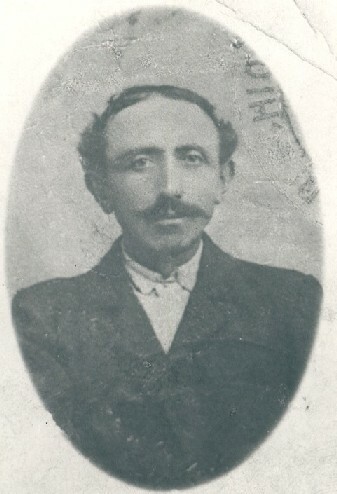 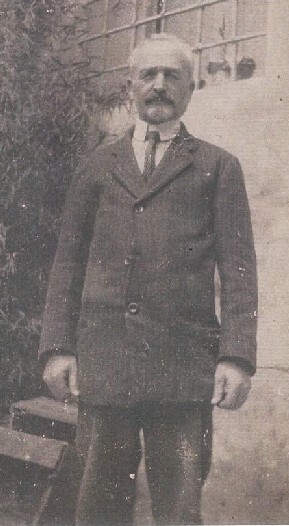 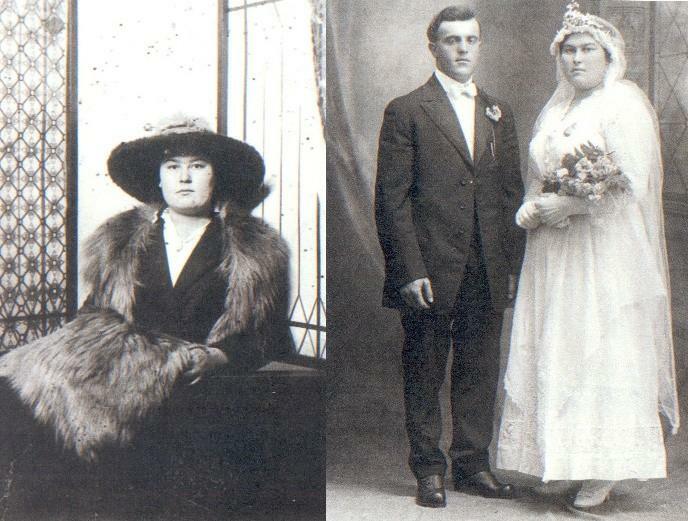 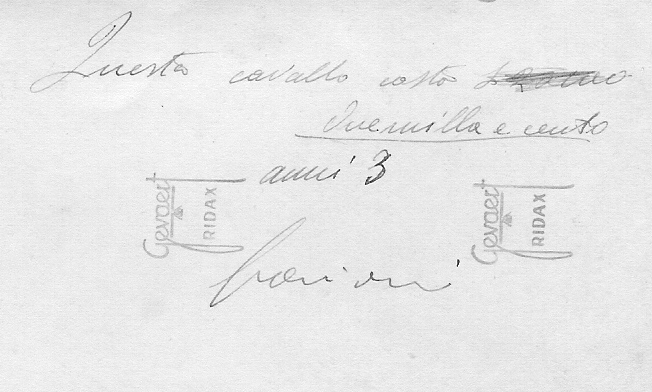 Angelo28 - Wedding of Flora Cunico - family of Antonio Beria and Maria Cunico (Masny France).Maria was born in 1901 in Capivari Stato di San Paolo - Brasil. 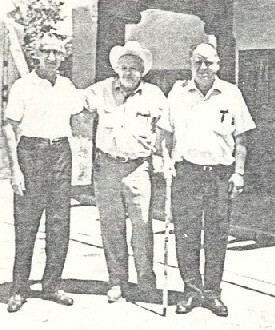 Betty Jane 6 - (7-20-70) – Adolph, Mike, Jim Cunico – Taos New Mexico in front of “the Sleeping Boy” which Mike & his brother owned. 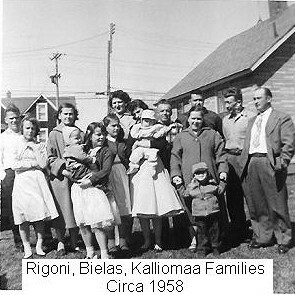 Nicole2 - 1951 before leaving for Venezuela (top row l to r) Antonia, Domenico, Rosa, Nicolo, French grandmother Jeanne, friend (bottom row) Bruno (Nicole on shoulders), Maria Antonietta, French Uncle Jean Claude (Betty taking picture). 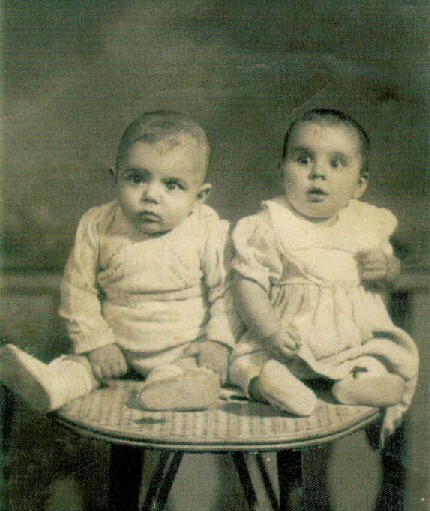 Bortolo2-3 - not sure who they are? 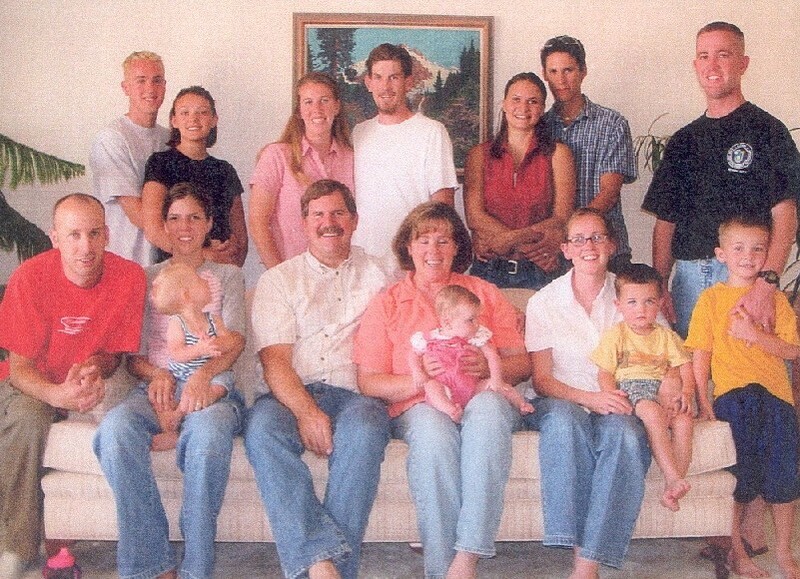 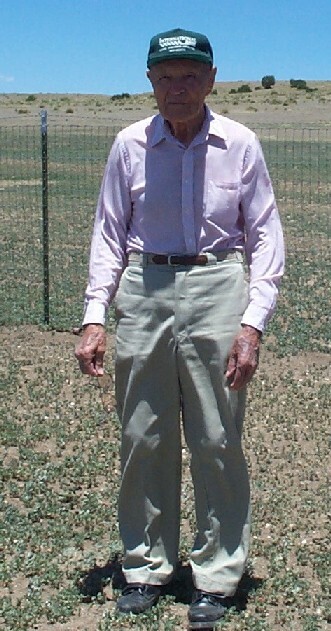 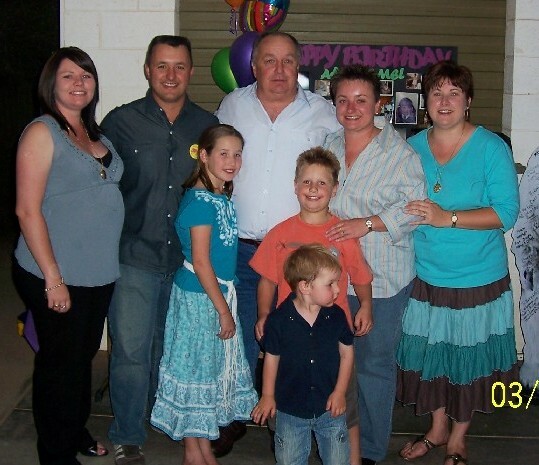 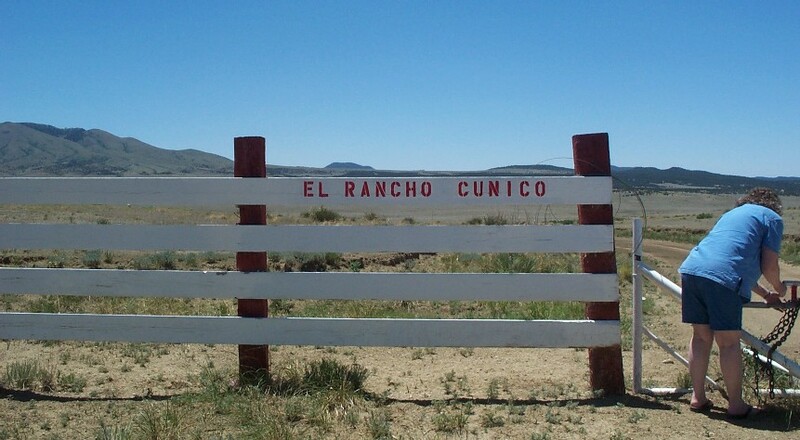 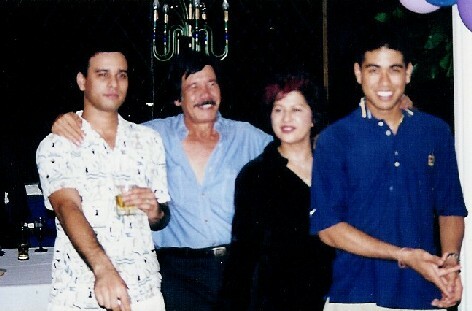 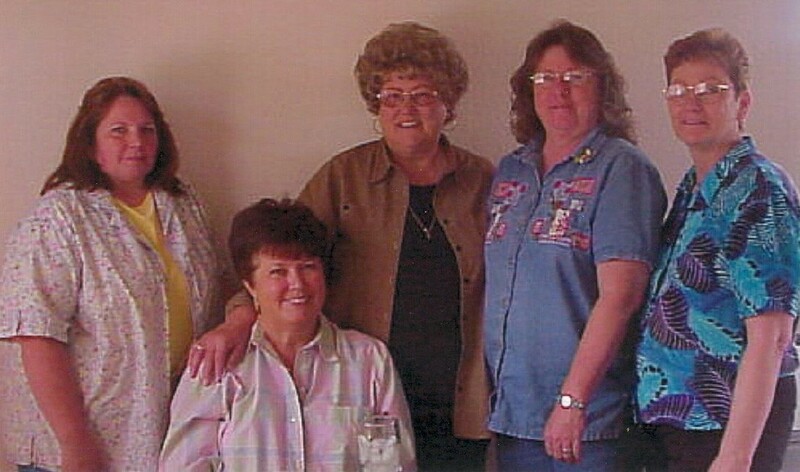 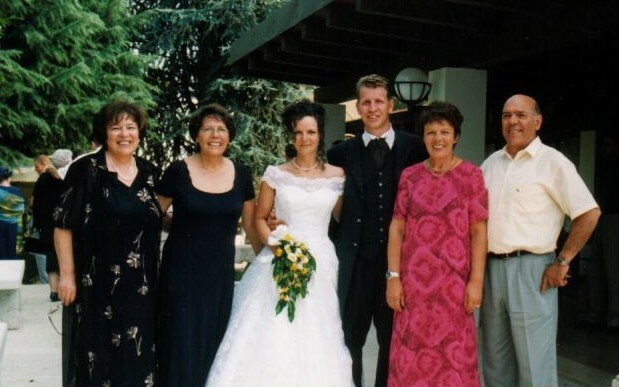 Most of the "Cunico Cousins" met for the first time in Raton, New Mexico in the summer of 2004. 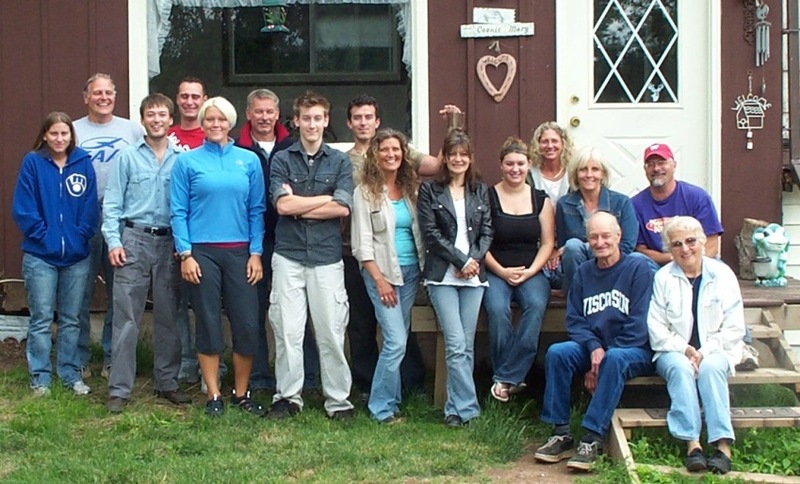 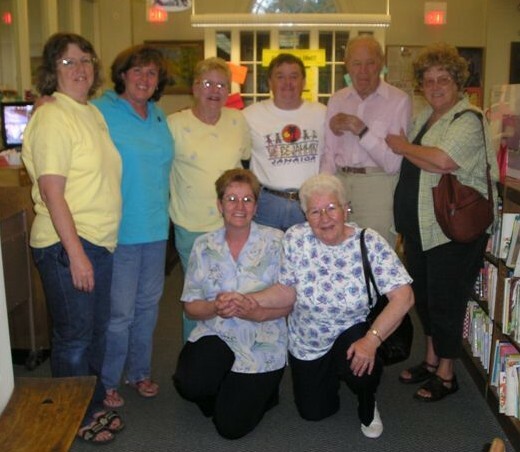 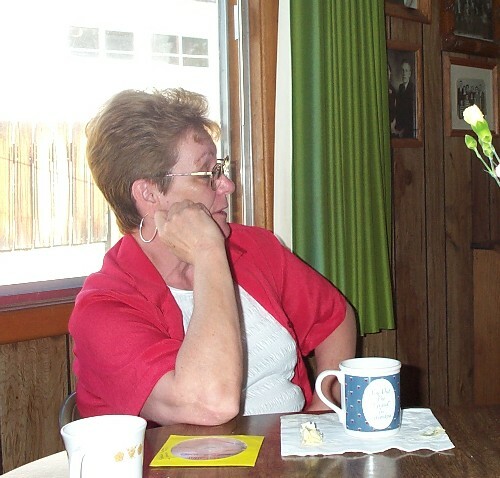 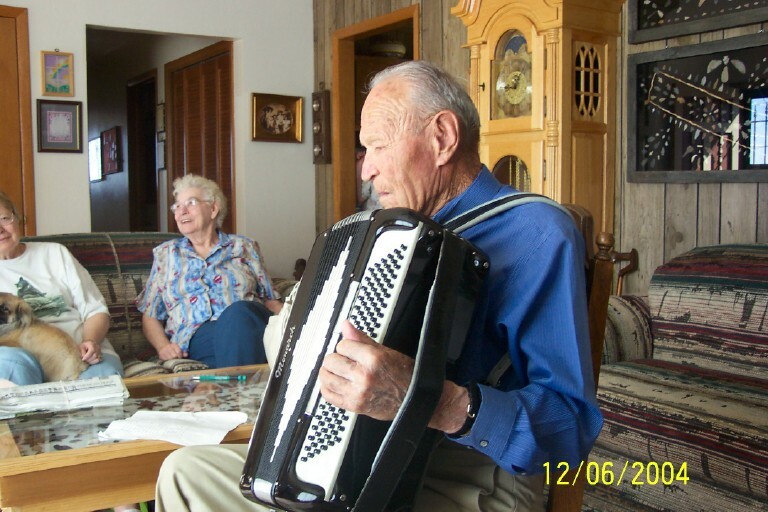 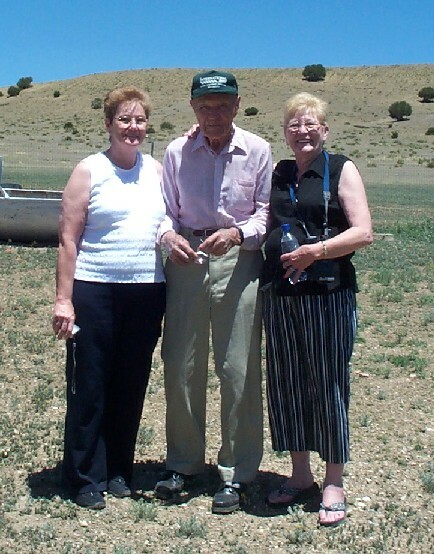 We gathered again at the Sopris, Colorado reunion in July of 2005. 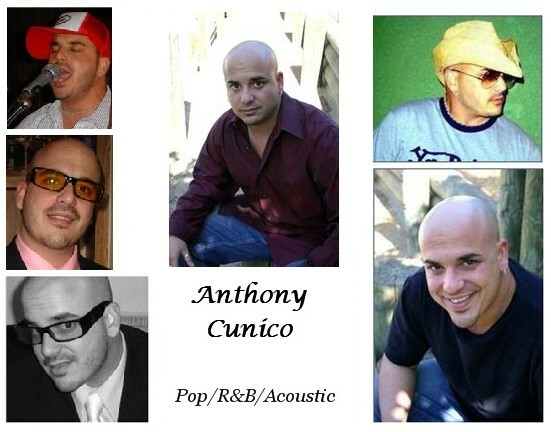 We fondly refer to ourselves as the "Cunico Cousins". 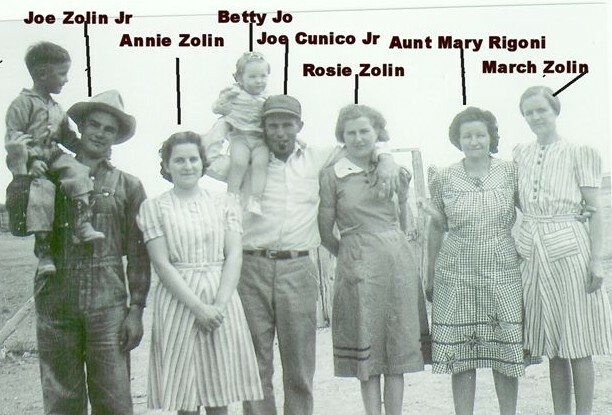 Even before we found an actual connection between our lineages, we knew in our hearts we were all cousins!!!!! 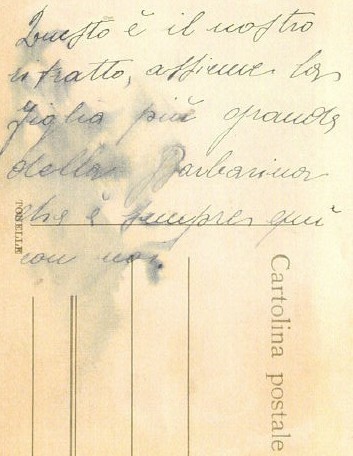 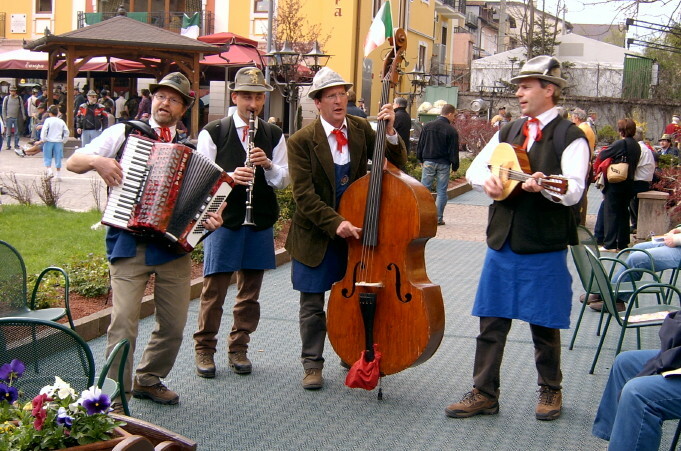 All notes are from Adriana of the Sporting Residence Hotel in Asiago. 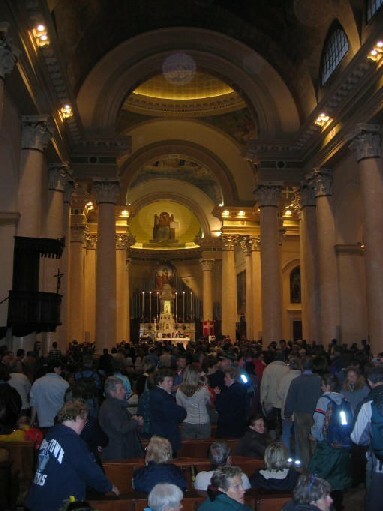 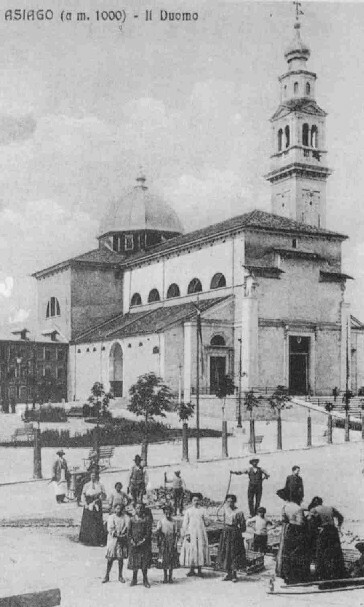 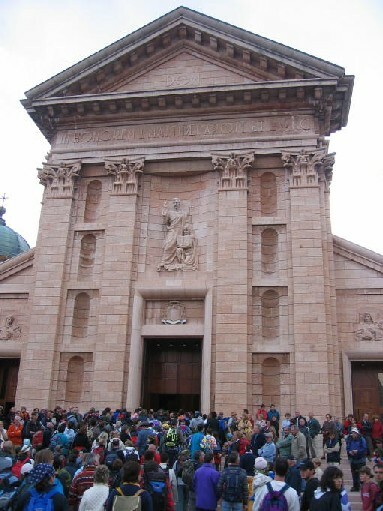 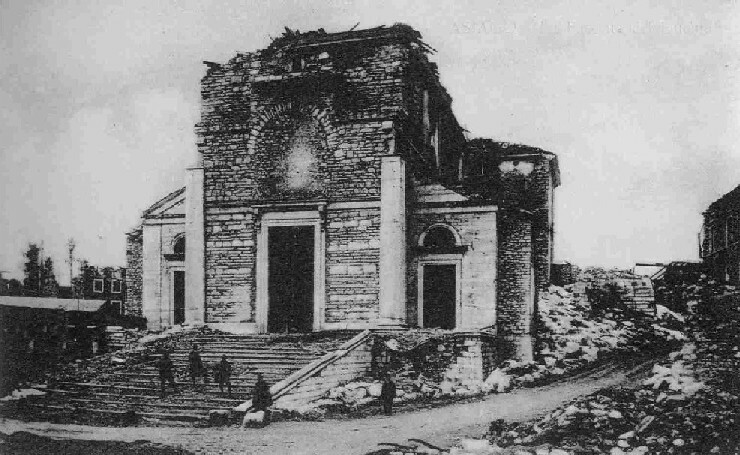 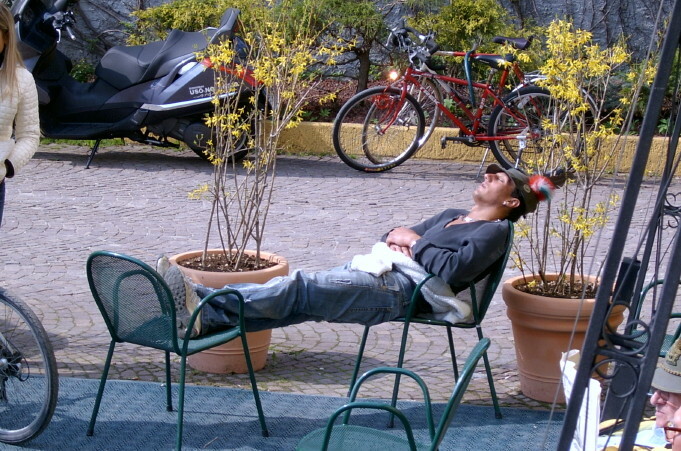 The rogazione takes place 40 days after Easter. 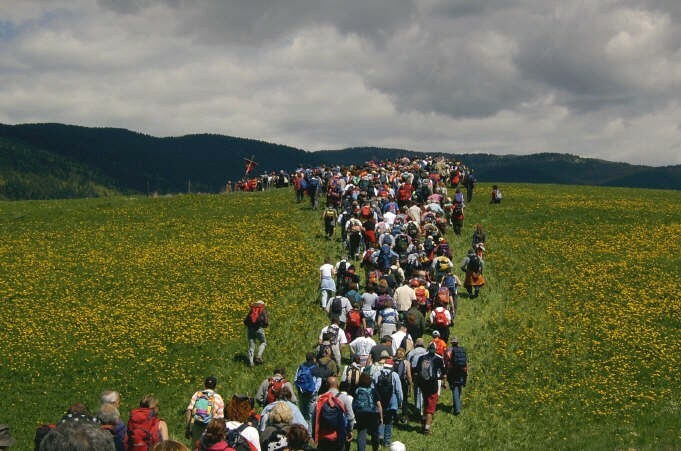 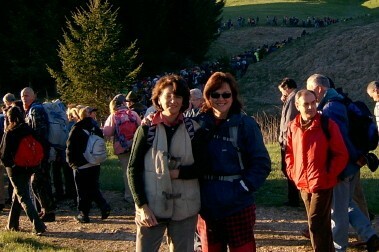 In 2005, 2500 people attended. 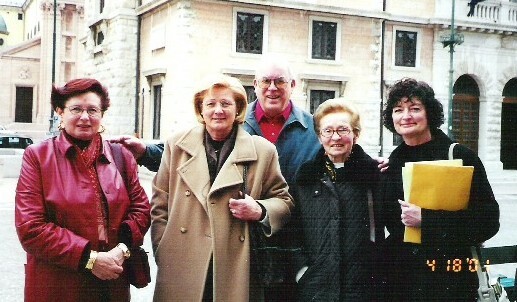 Rogazione2 - At the church before the walk and then the service at the end. 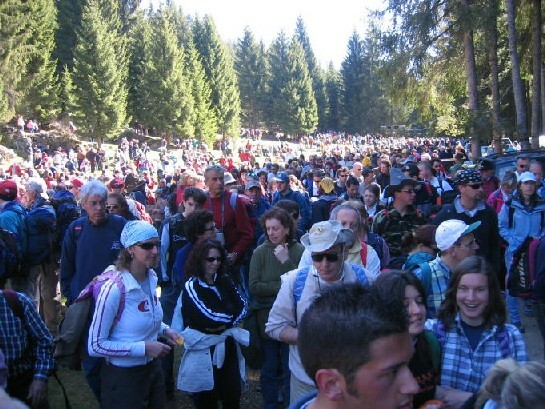 Half way through the walk at Lazzaretto, Don Antonio has a mass in the woods. 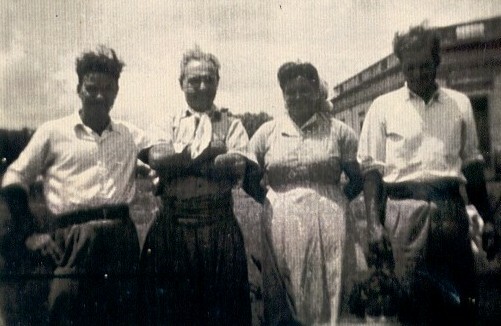 Everyone stops for a break and to eat, eggs are given by the women to the men they fancy. 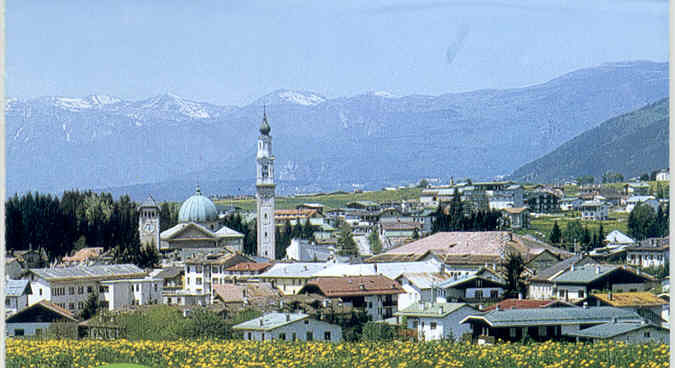 Rogazione4 - The hills are covered in dandelion flowers which locals pick before flowering as wild greens. 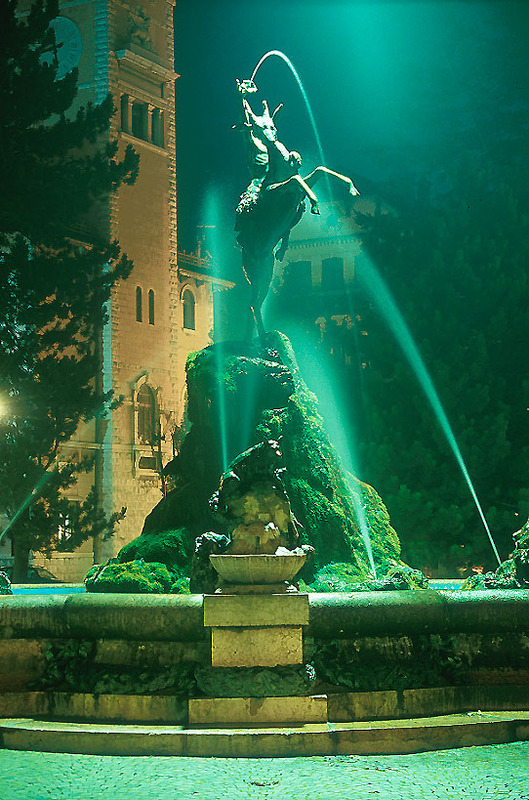 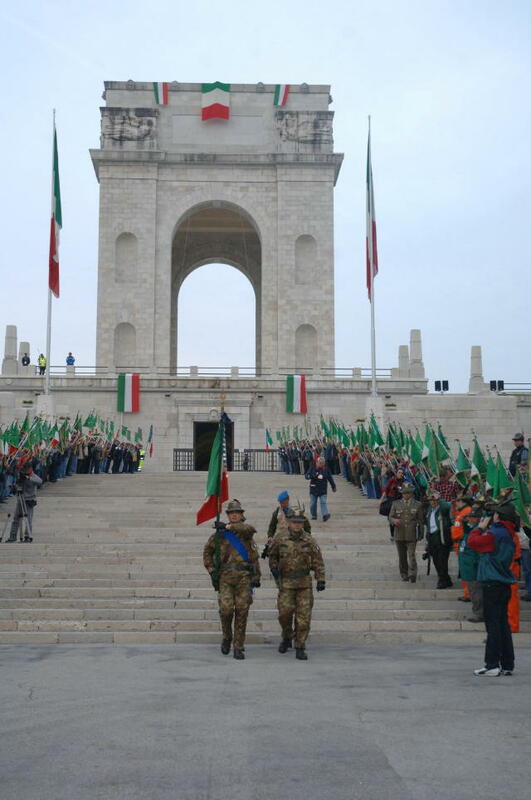 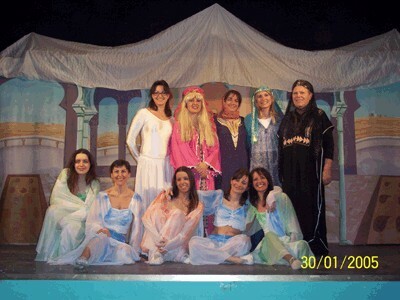 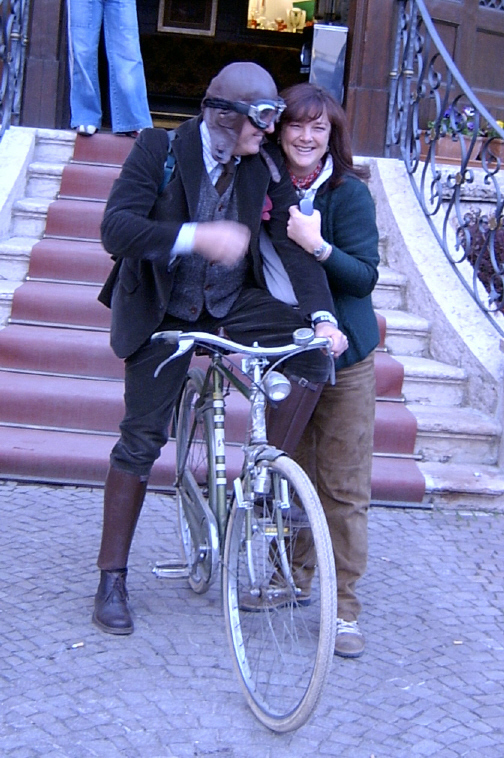 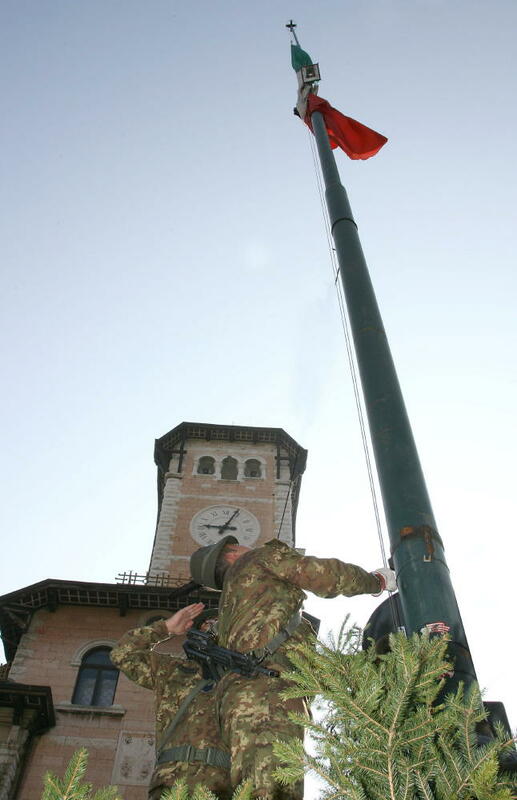 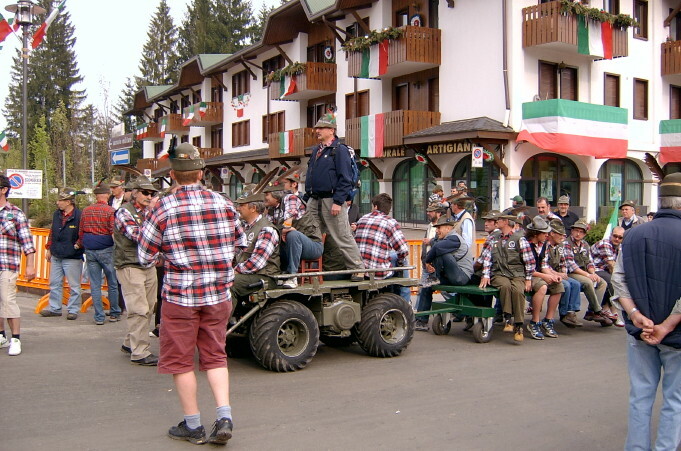 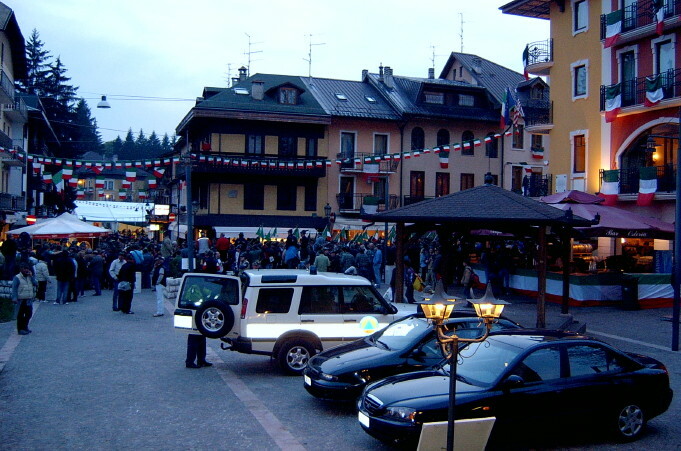 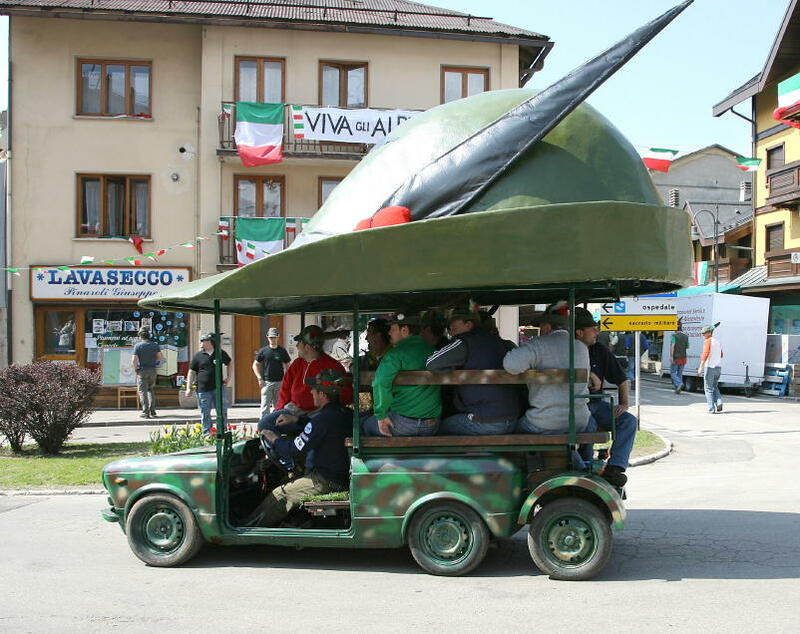 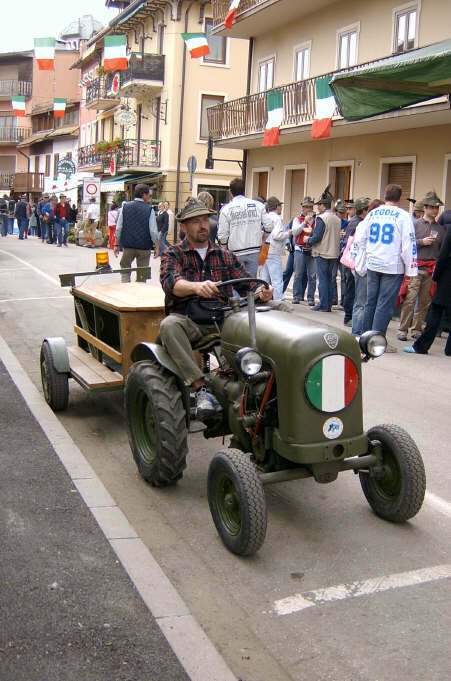 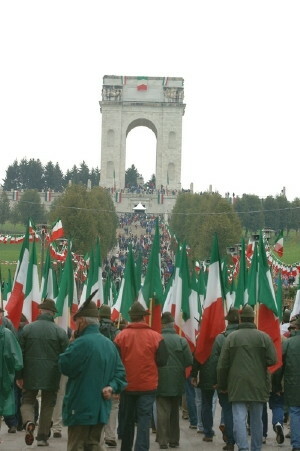 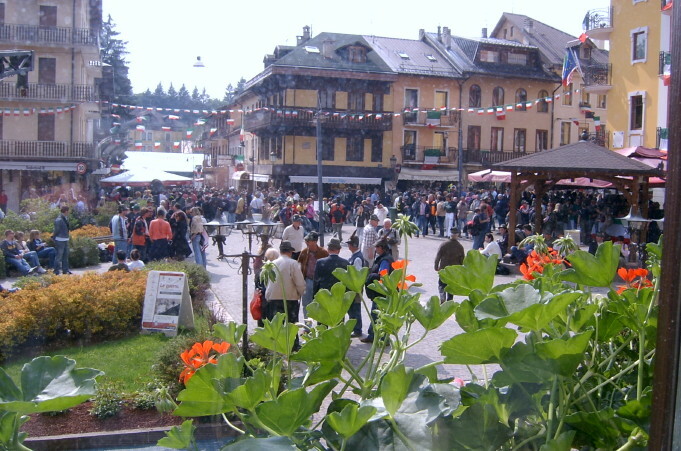 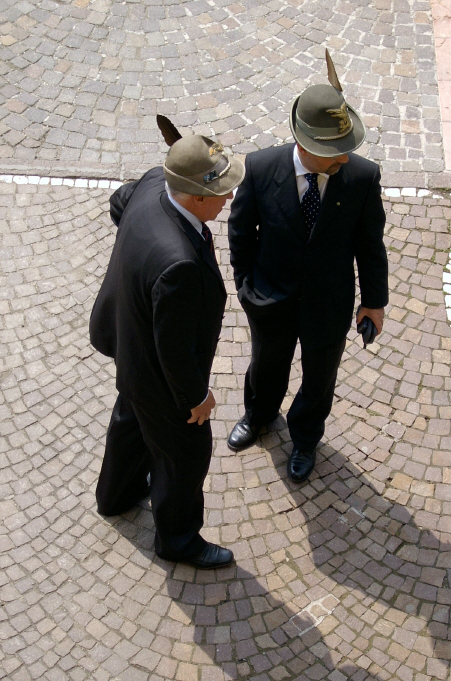 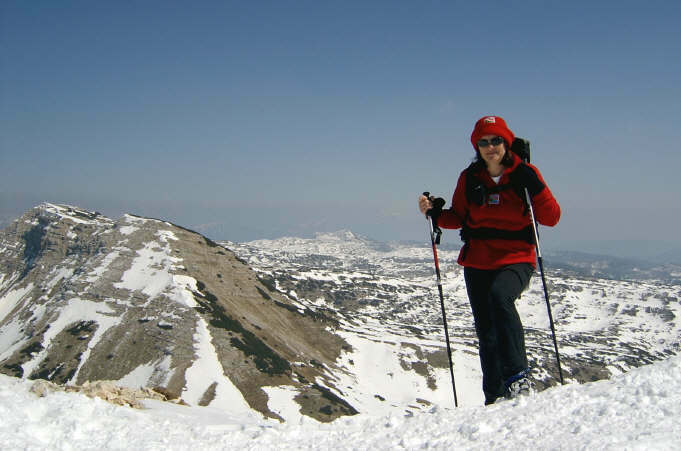 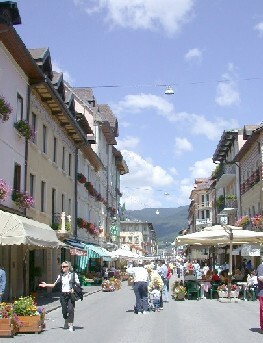 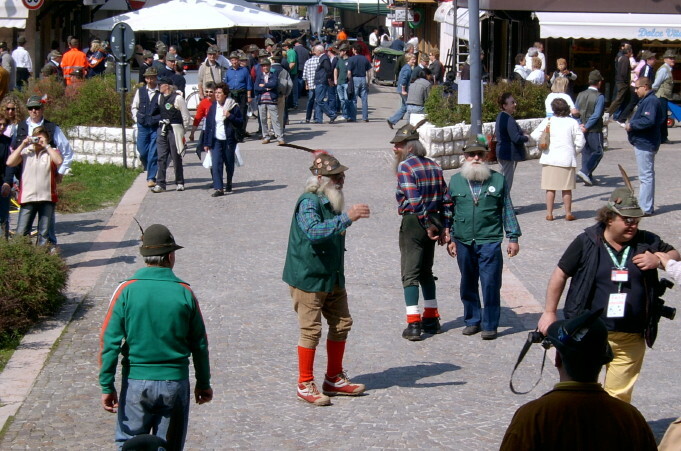 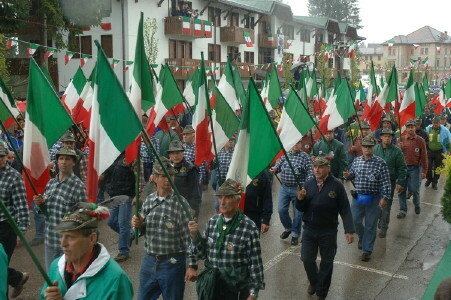 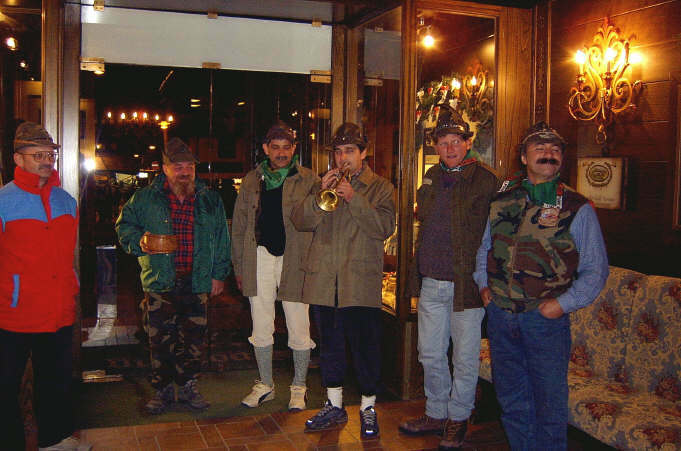 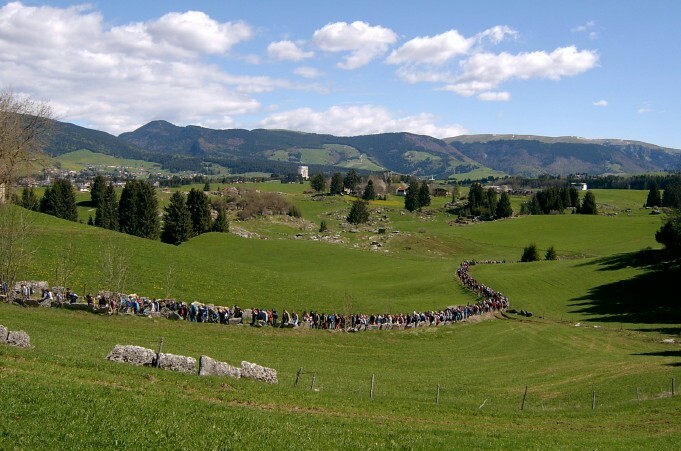 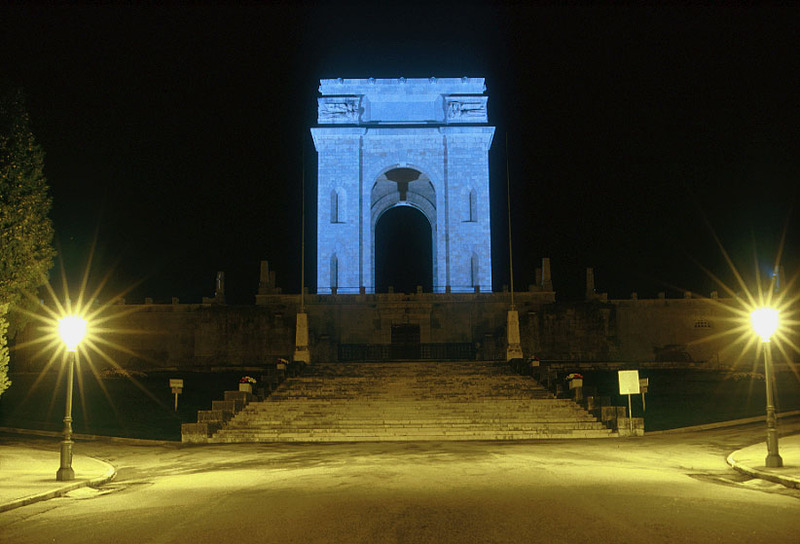 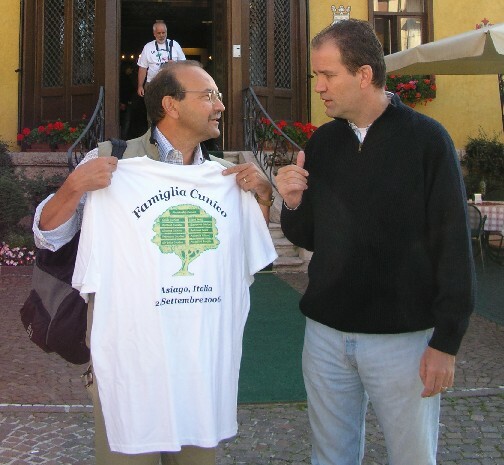 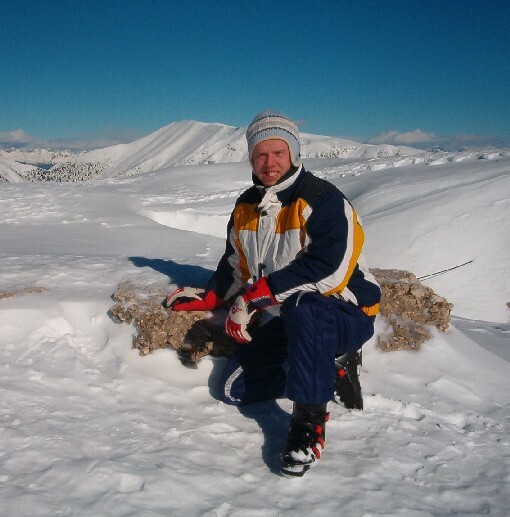 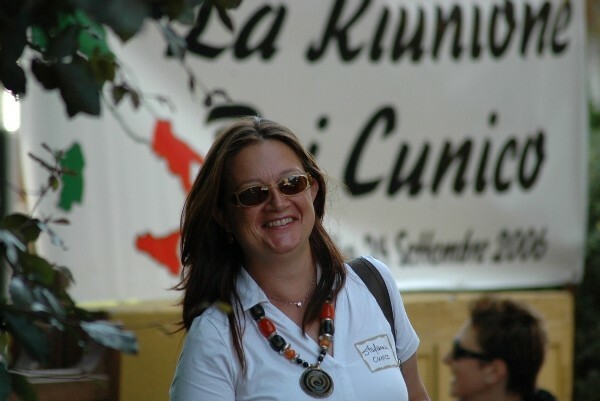 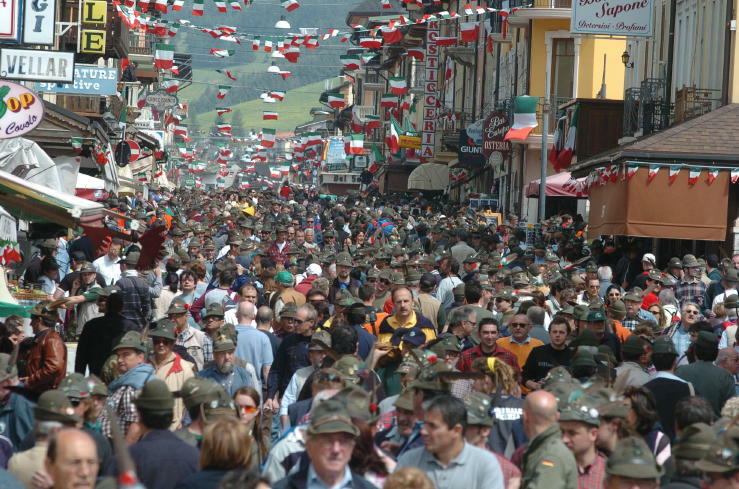 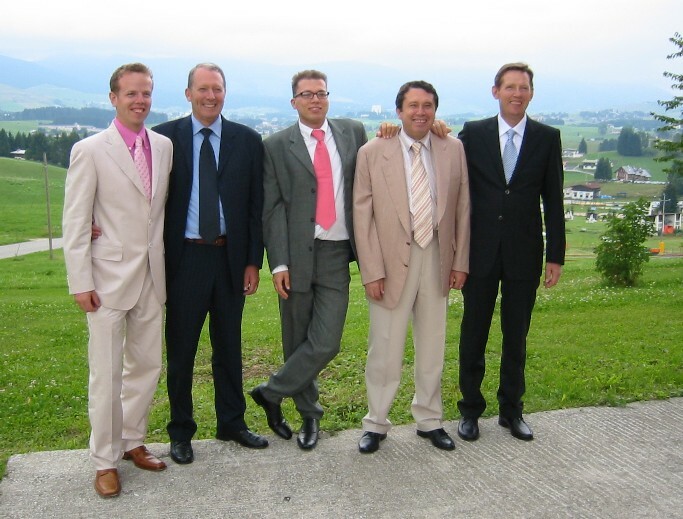 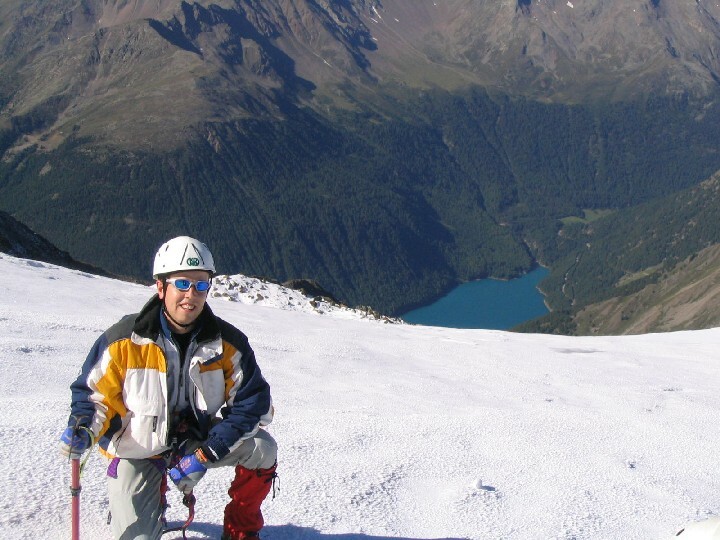 The following photos of the 2006 Adunata Alpini celebration were supplied by Adriana Longhini.